JULY 5TH, 2015 Please go to "finishing touches and living our dream" in top margin for our latest update . 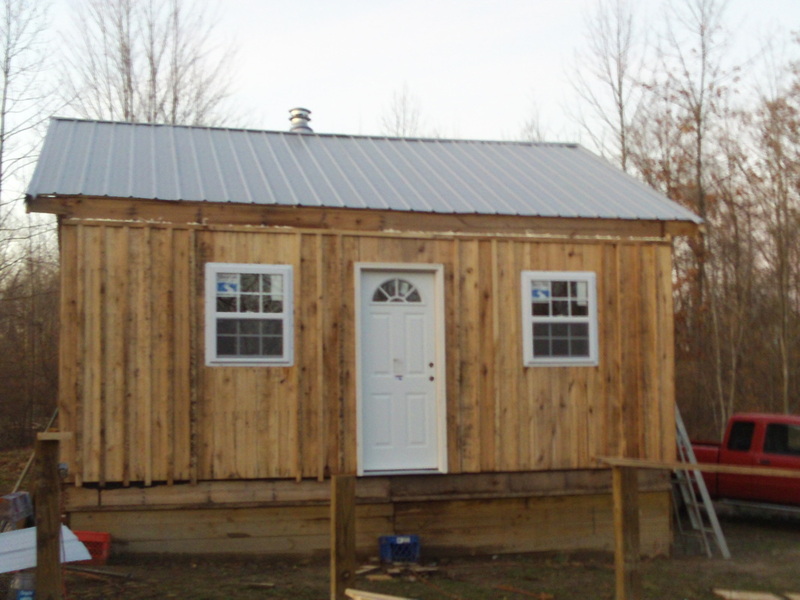 Here at "Little House On The Hill" we have started a new business. 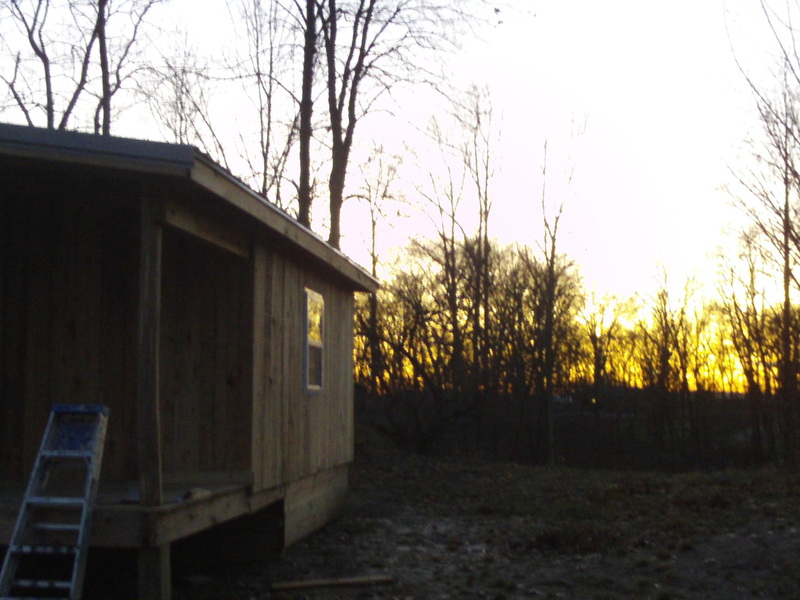 We live in an area they call "Hickory Hollow"
That is where we got the name "HICKORY HOLLOW HATCHER"
we have begun hatching our own chickens and offering both peeps and started pullets for sale. Please (gawd i hate this) "like" us on facebook. (I put am about as sick of the "like us" as I am "baby bump", but it really helps promote our business. lol......i won't ask again, i promise! 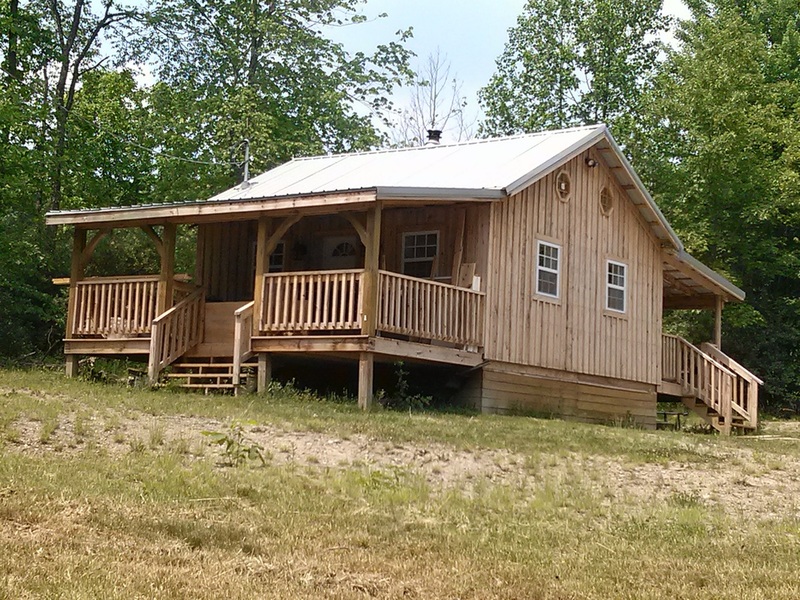 "This little house" is my inspiration. There has been a real movement lately, to down size. The more I read, the more it totally makes sense to me. We have "over built" terribly in this country. 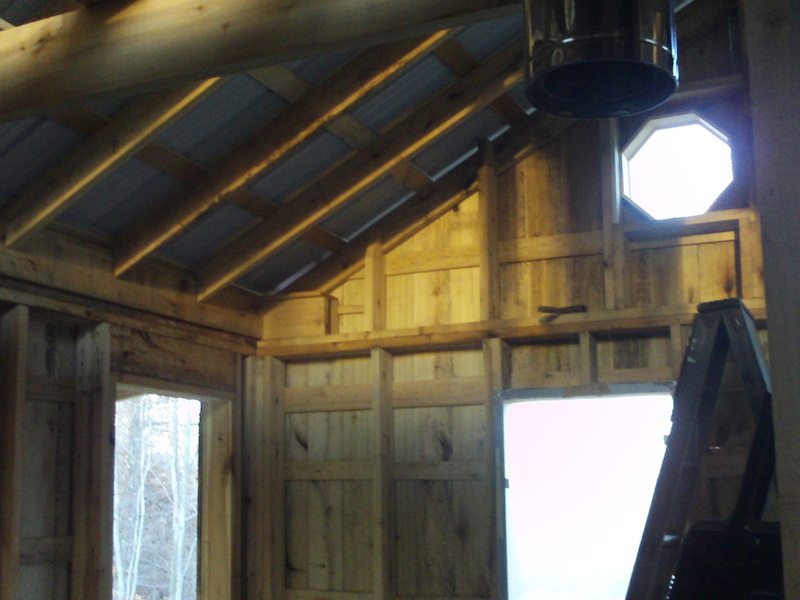 Every day we heat, cool and clean spaces we use once a year. That not only causes way more work for us, but has created some real issues in this country. Foreclosure, abandoned houses, and working jobs we hate, every day, with no end in site. Most of us will never be able to retire with our current financial obligations. I will reach retirement age in 3 years. There is no way I could retire with the mortgage and utility bills I pay right now. 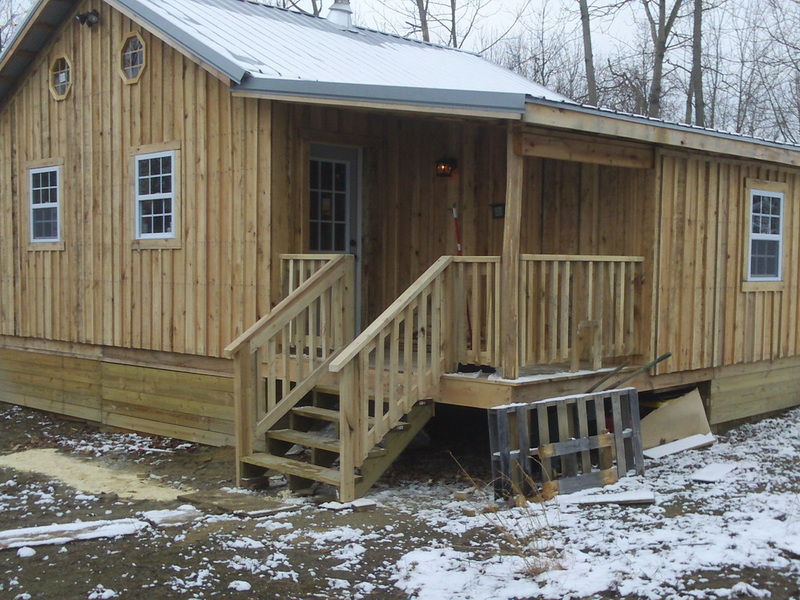 But.....this little cabin will be almost paid for by the time it is finished. Most of my income for the remaining 2 years will be "bankable" as a nest egg. I am really liking this idea. 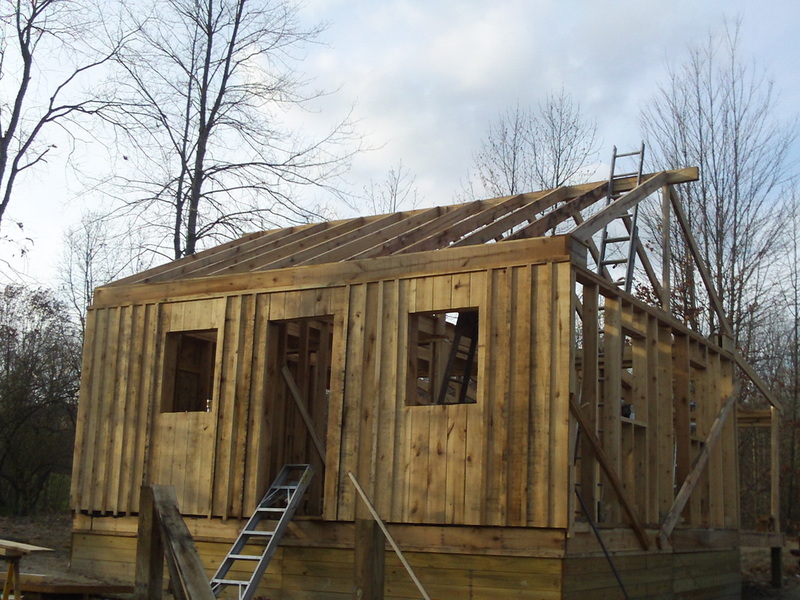 Although I have done lots of different types of construction, including a log house, I was younger then. The thought occured to me, can I still do this? I am not as fit and agile as I once was. Then I read a story of a man with Cerebral palsy who walked with two canes. 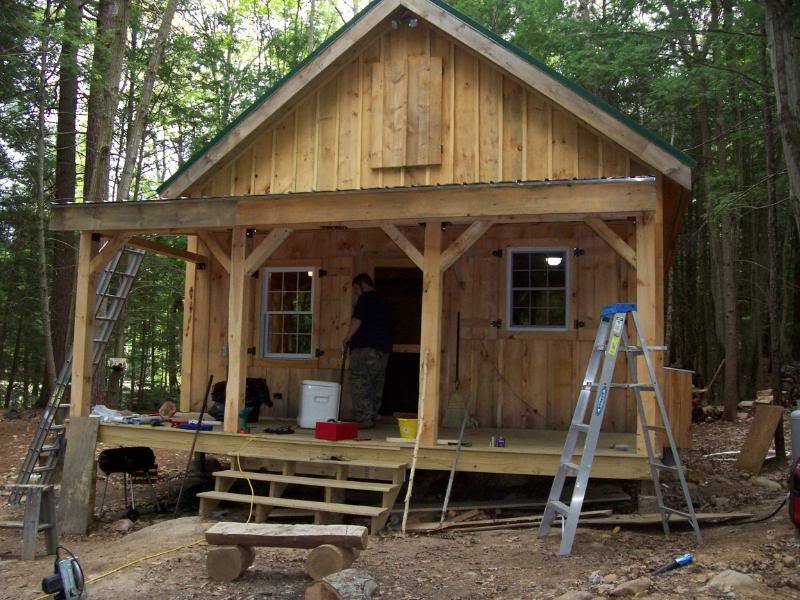 He built a very similiar cabin with the help of a friend. His friend was totally blind! 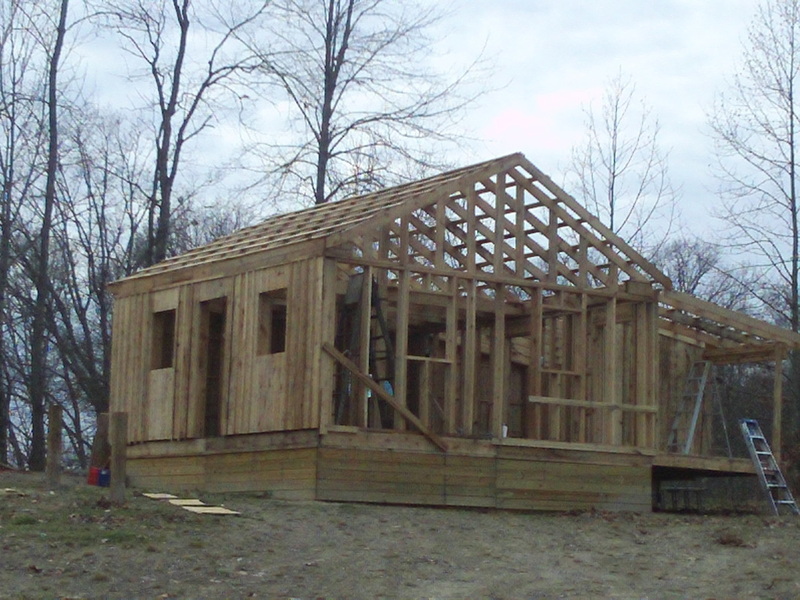 Financing the construction of such a little house is not an easy thing. 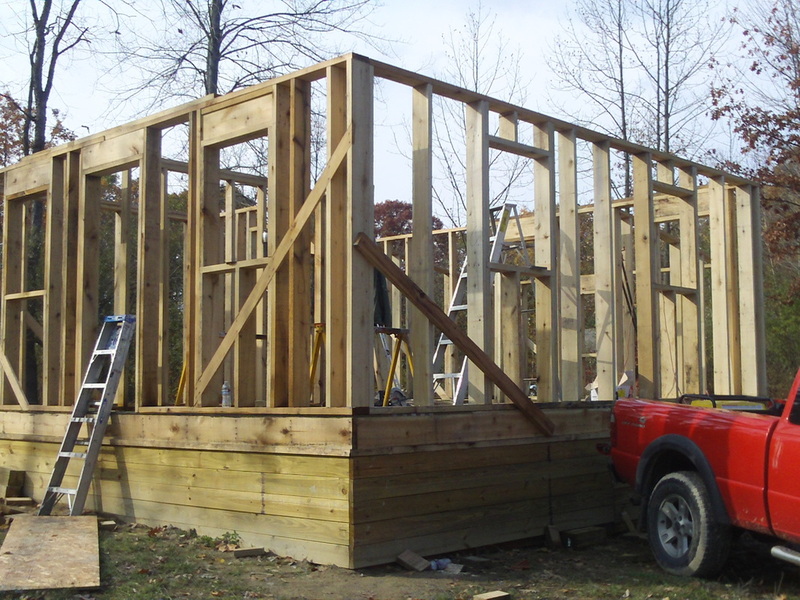 Banks don't want to lend money to somebody building their own house. They also don't want to lend very small amounts of money. 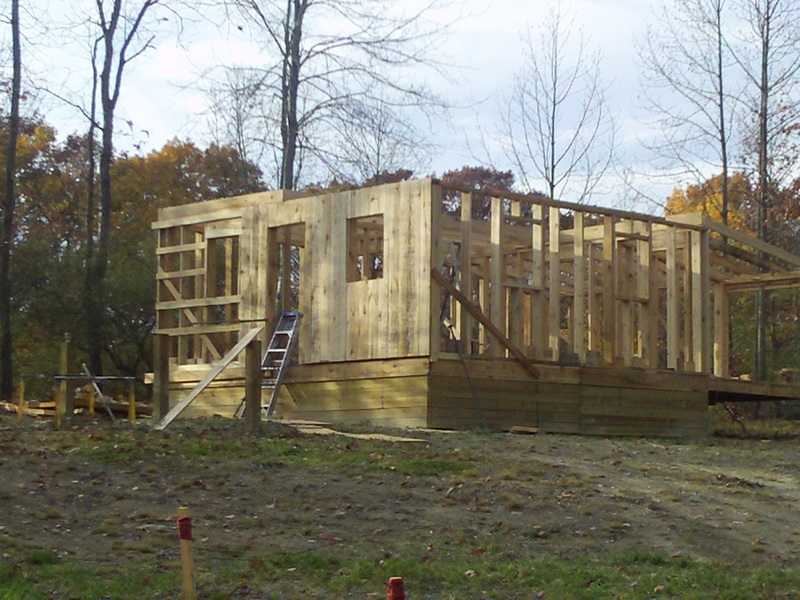 I have enough money to build the house, or I have enough money to buy the land....but not both. 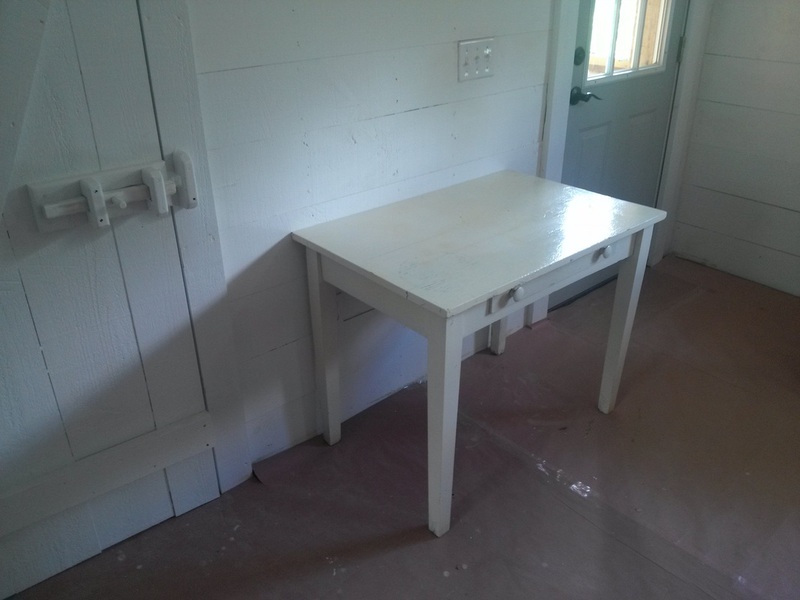 This past week, I found the perfect piece of property. 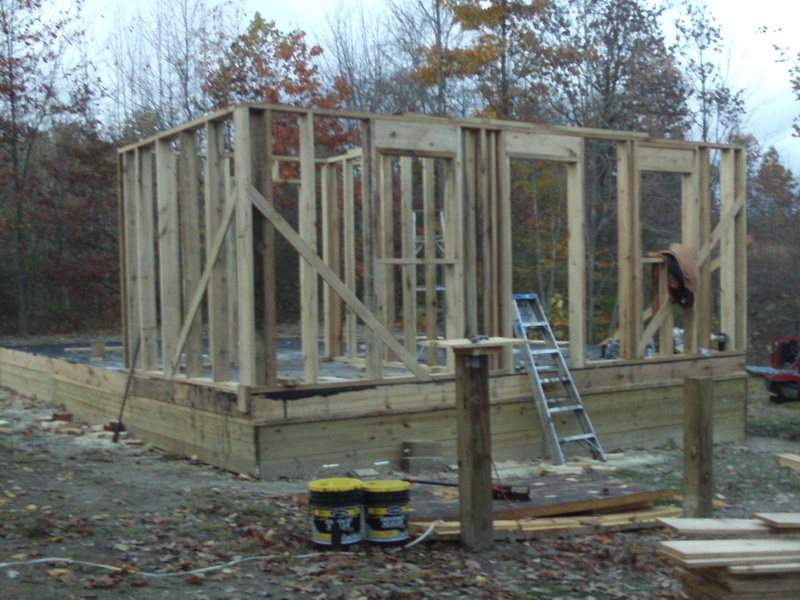 The owner agreed to sell it land contract until I get the house built. At that time, I can take a conventional loan and pay him off. I have spent hours and hours going over the figures, and have it down to this. 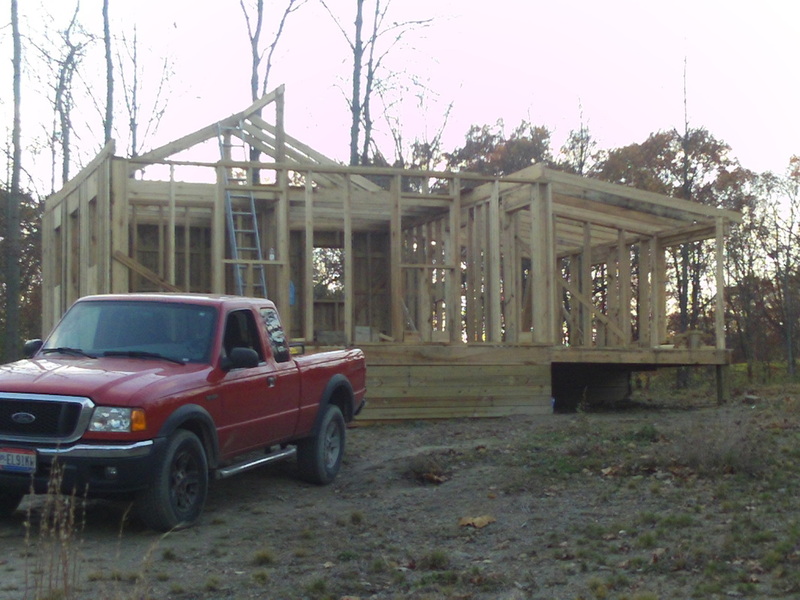 By the time the house is finished and ready to move in to, I should still owe about $15,000. That will be my total morgage! I can have this paid off early in the first year I live there, and be able to bank the next 18 months of my income before retiring. 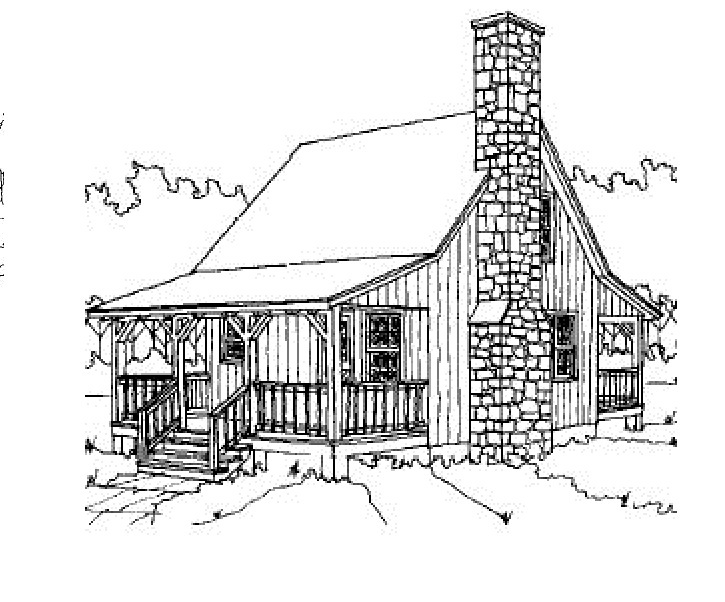 There are tons of possibilities a small house like this present. 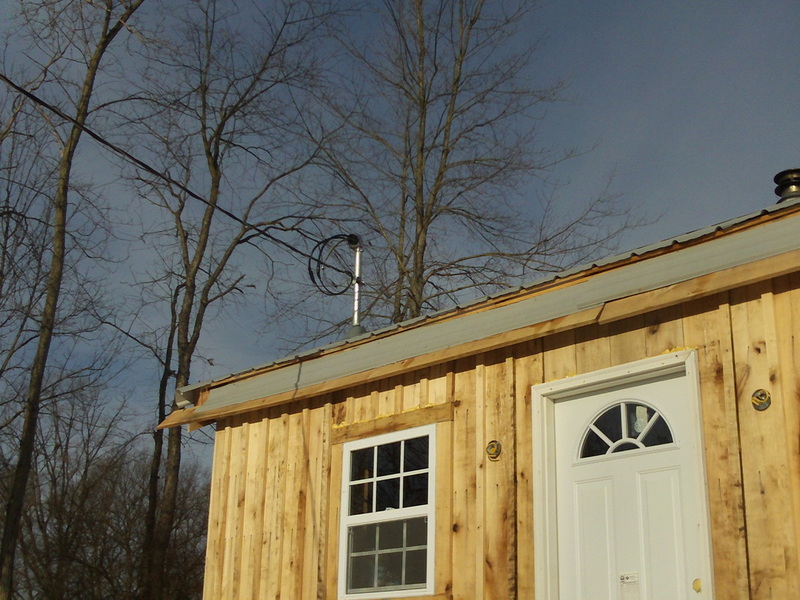 For example, although I will be "on the grid", I can easily add solar power, a wind generator, etc. 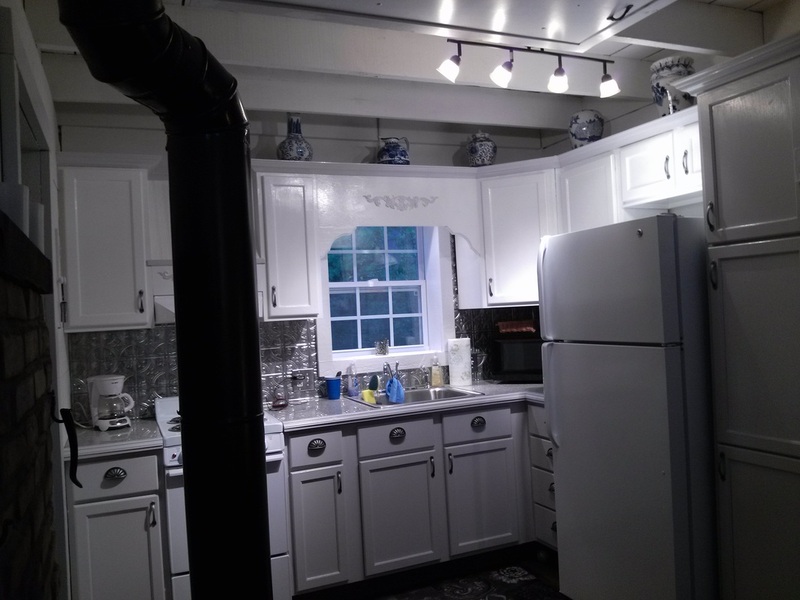 and have next to no electric bill. 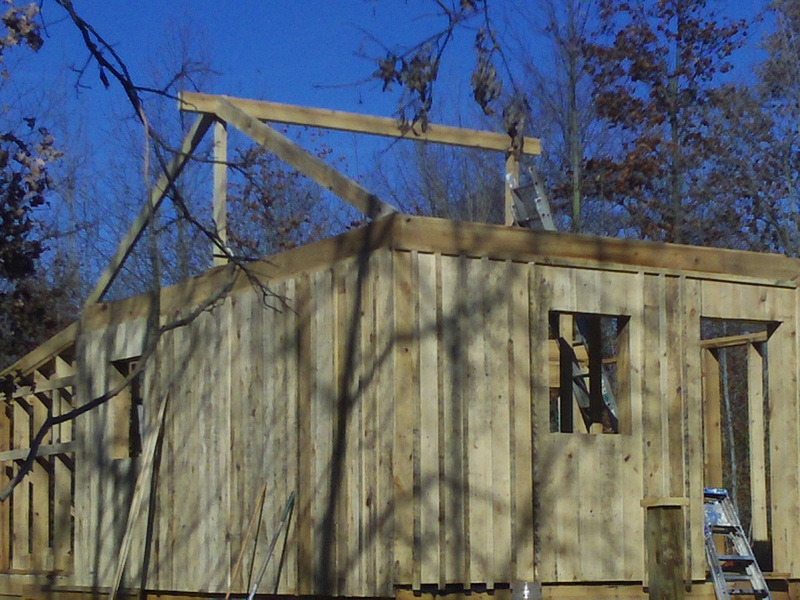 I will be building this little house EXTREMELY energy efficiant. I will go into much more detail on that later. 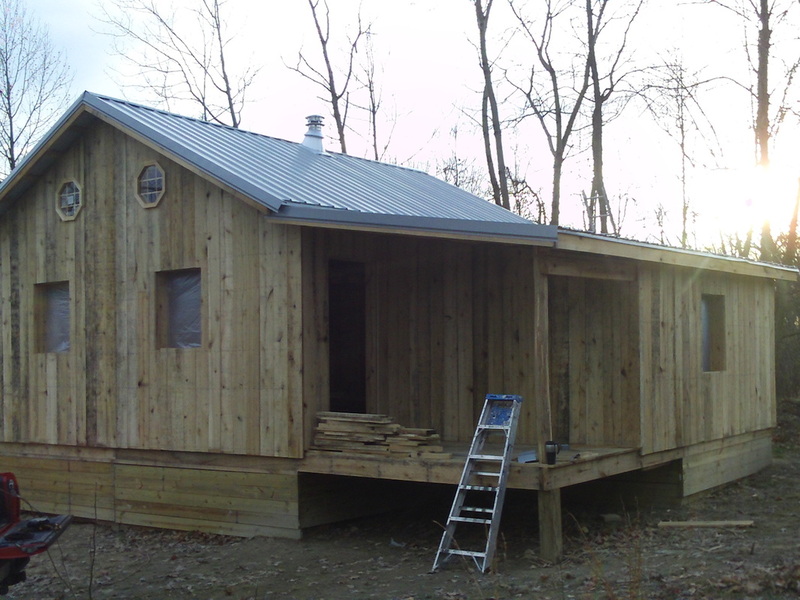 To build this cabin, I must keep the cost down, but I want a very nice, well built home. I won't skimp on quality, but have been known to go with "the unusual". I rarely follow the flock. I don't believe in cookie cutter housing, always being politically correct, or belonging to "the club". You will never find me "living on the cul-de-sac" or "in the sub-division". And, I really don't care if everybody else does it "this way". You might say I "strive to be different"! 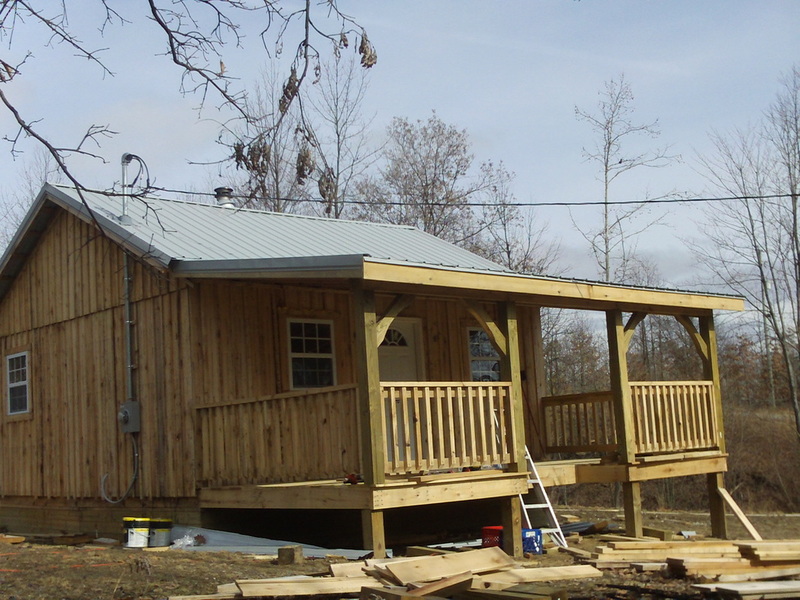 This little house might as well start out just like that! 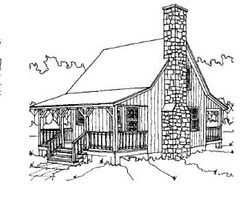 I began by reading, cover to cover, a book by Larry Michael Hackenberg entitled "The Green Wood House". Google it, and buy it if you can, you won't be sorry! I also already had on my book shelf a book by Mike Abbott entitled "Green Woodwork". 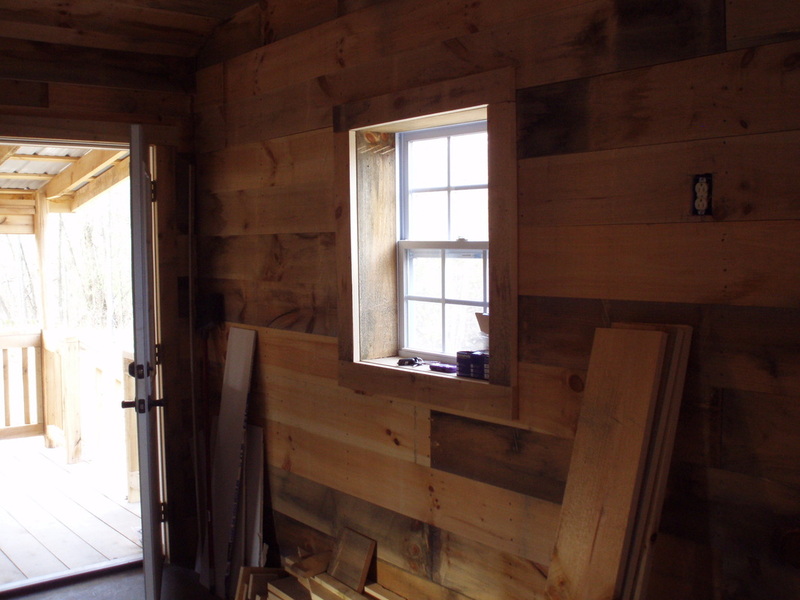 Both books teach the joy, fun and techniques of working with green, rough sawn lumber right from the saw mill, or in some cases, right from the log. You see, this is just one of the millions of examples of how we humans have become sheep. 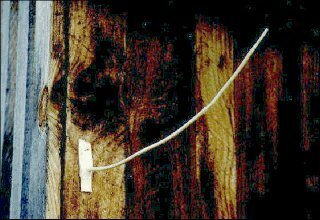 It is "general knowledge" that wood must be dry before use. It will warp, split, crack, and cup if it isn't dry, right? WRONG! The truth is, there are techniques that prevent this. 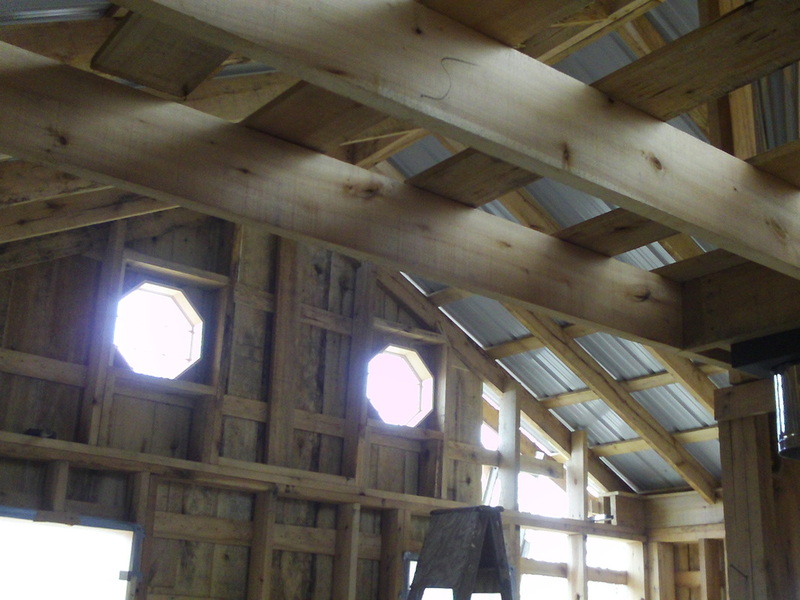 Long, lost building procedures that only a few have passed on. You see......you must know what you are doing. Easy to learn, but little known! 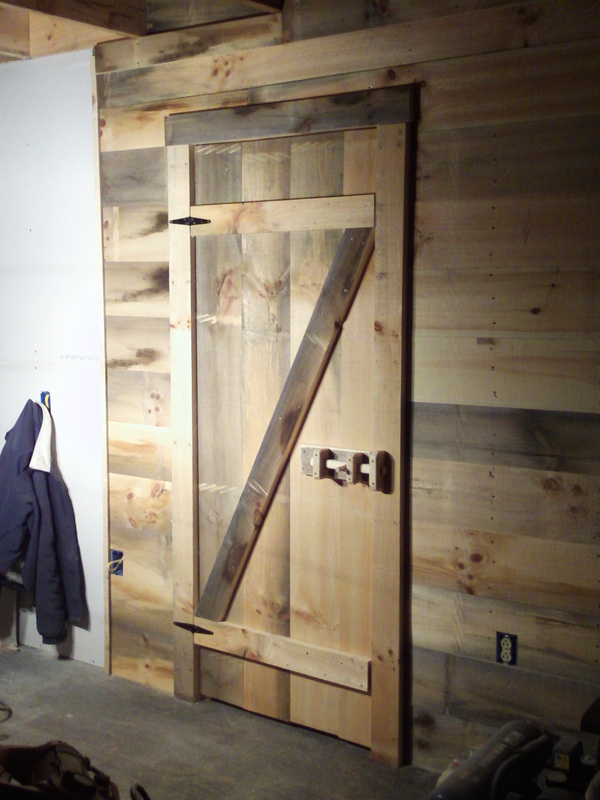 The easy way, is just spend a bunch more money for a mill to kiln dry the lumber, and you don't have to know these things. If you spend enough money, you don't have to know anything at all! 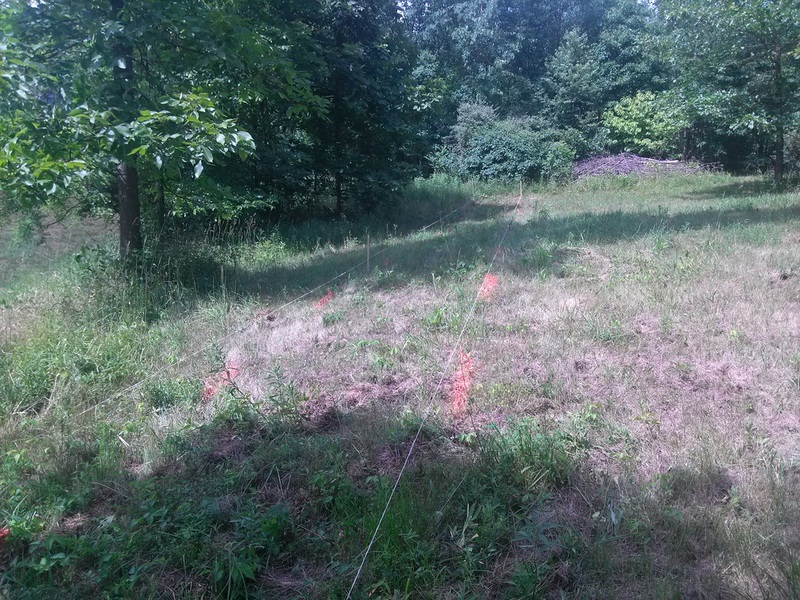 After work this afternoon, I will be signing papers on the land we bought. 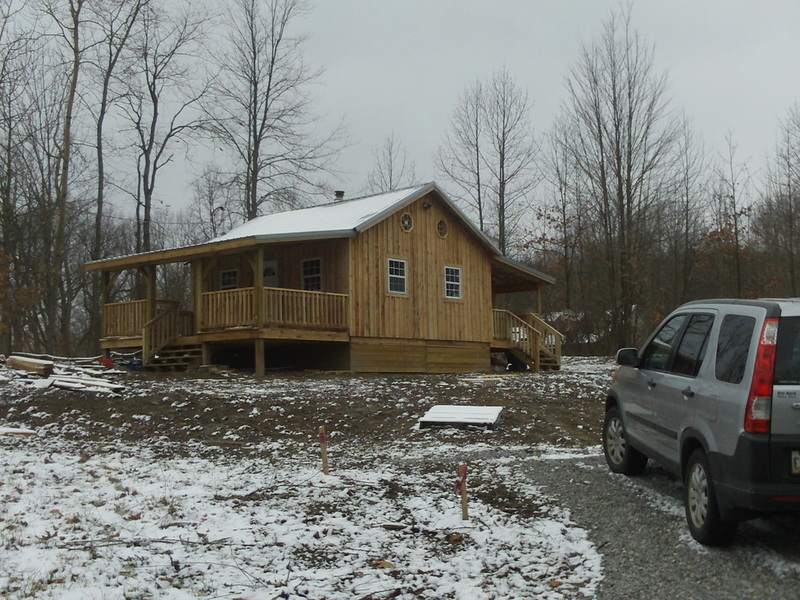 Yesterday, we went out and staked out where the cabin will sit. 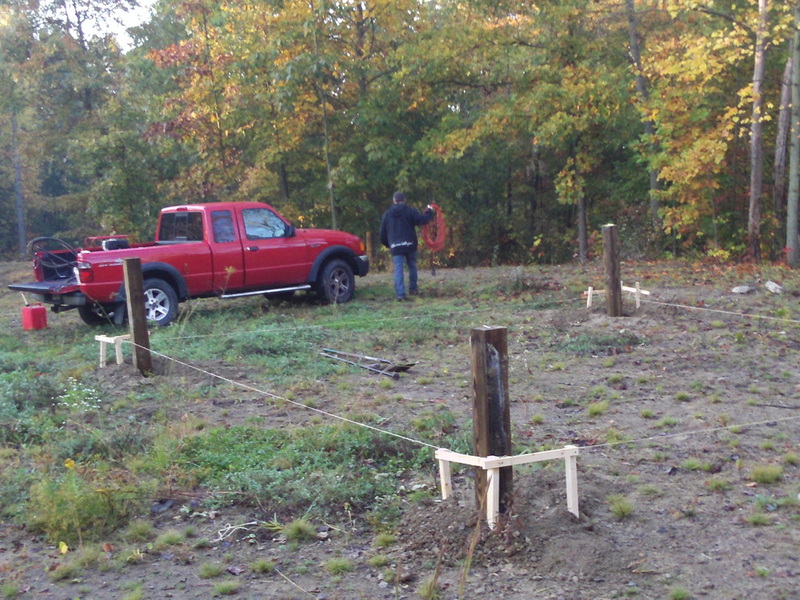 By the time we finalized a location, those stakes had more miles on them than my pick-up! 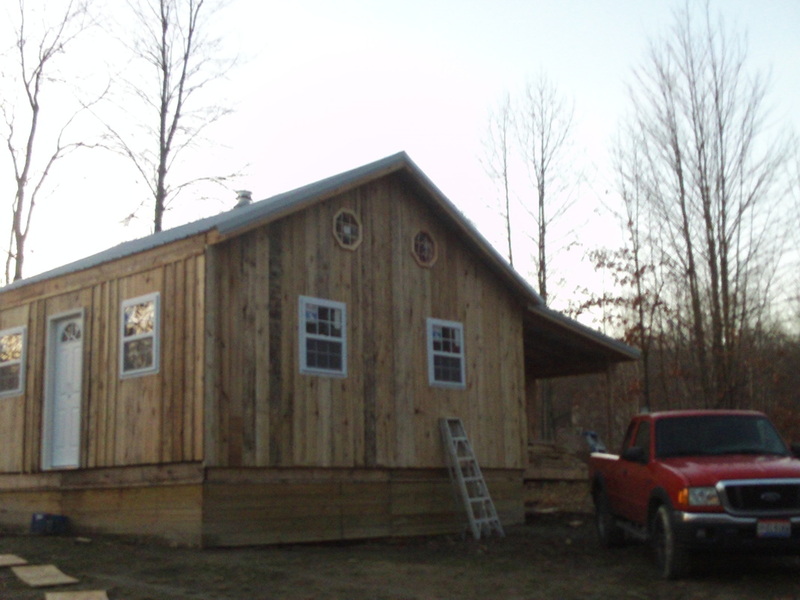 We decided on a floor plan of 20'X20' (400 square feet) with a 10' deep porch on both the front and back of the house. I think the location we chose was a good one. 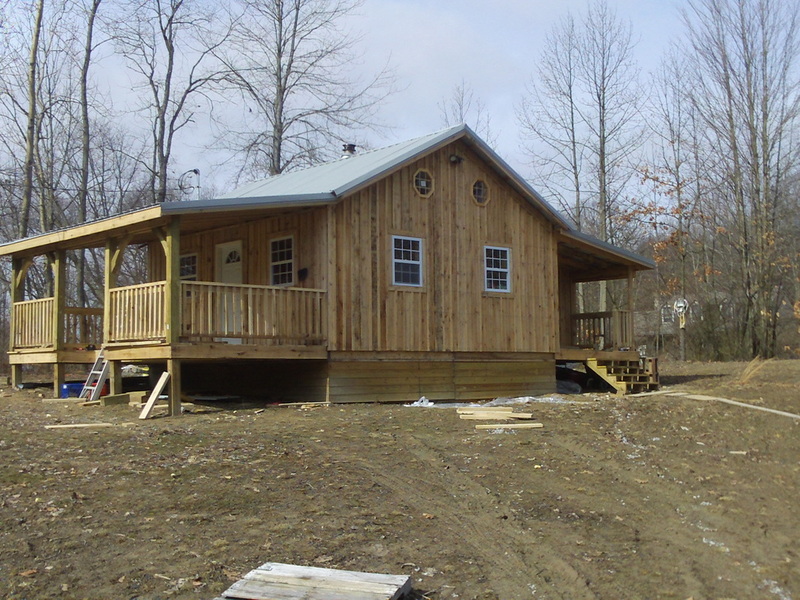 The "back porch" will be placed right at the top of the hill, overlooking the valley where the road is, looking south. The "front porch" faces north. The original plan was to face it east and west to watch the sun rise and sun set. We finially decided they wouldn't be that dramatic anyway due to the trees. 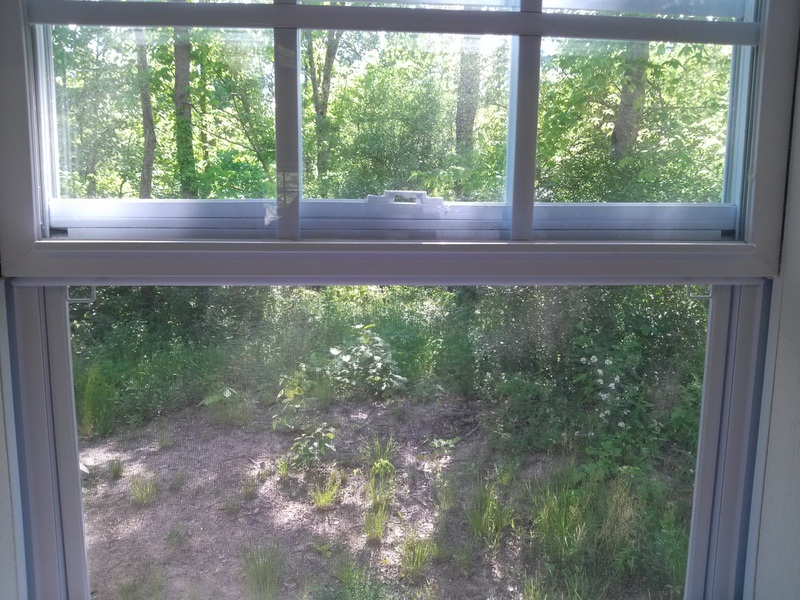 I really didn't like facing the porch to the north as a wind scoop, but a hill and woods pretty much block that direction anyway. 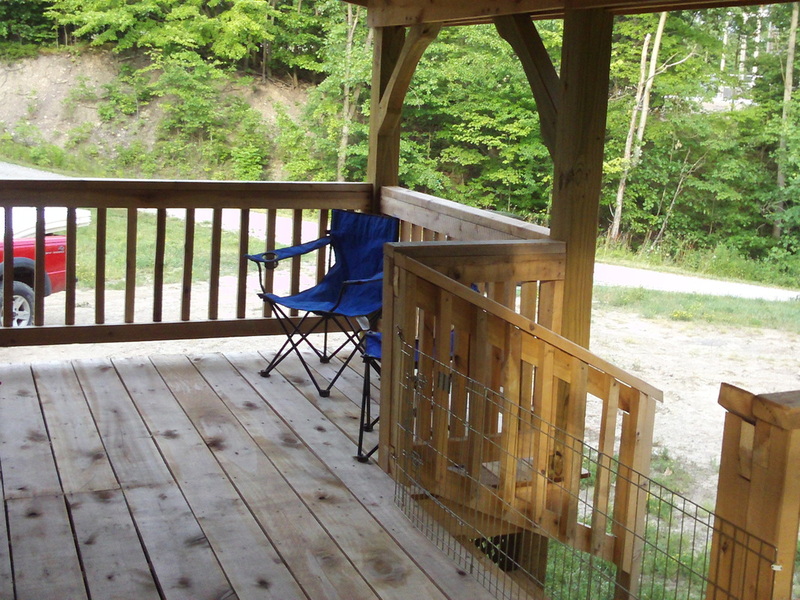 The view from the back porch, looking south. This is where the house will sit! This is looking north. The pond in the next picture is right at the base of the hill at the far end of this photo. The little pond, right at the north end of the property. Ok, here is one of those stories that will be a funny memory some day. 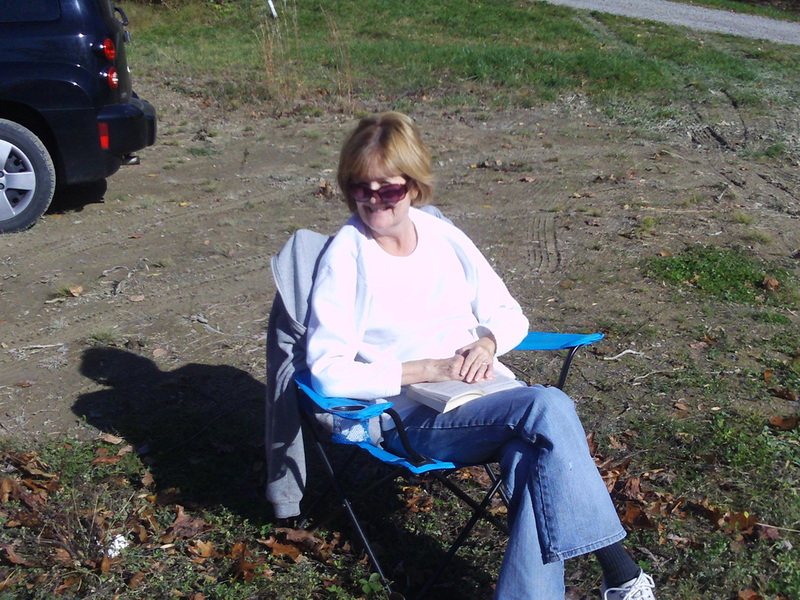 Yeasterday, after work, I headed for Lowe's, list in hand. 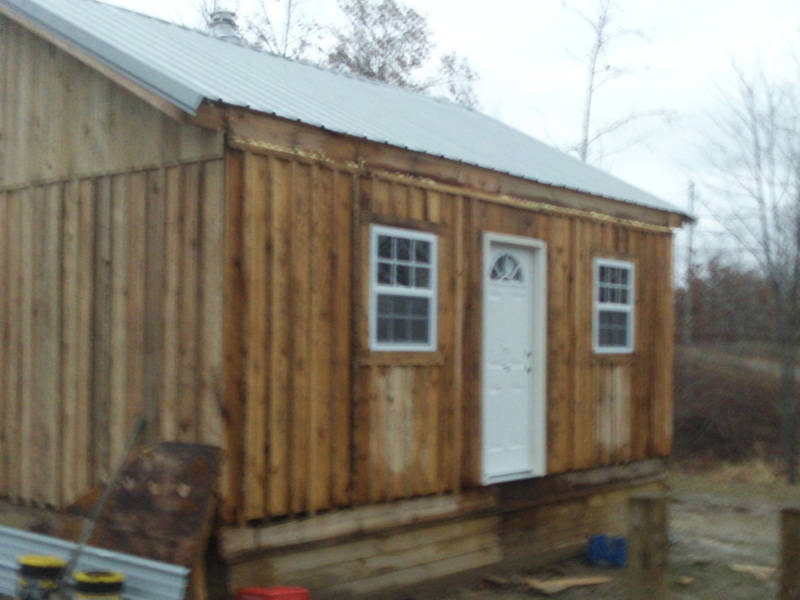 I was headed there to get my treated lumber for the foundation. 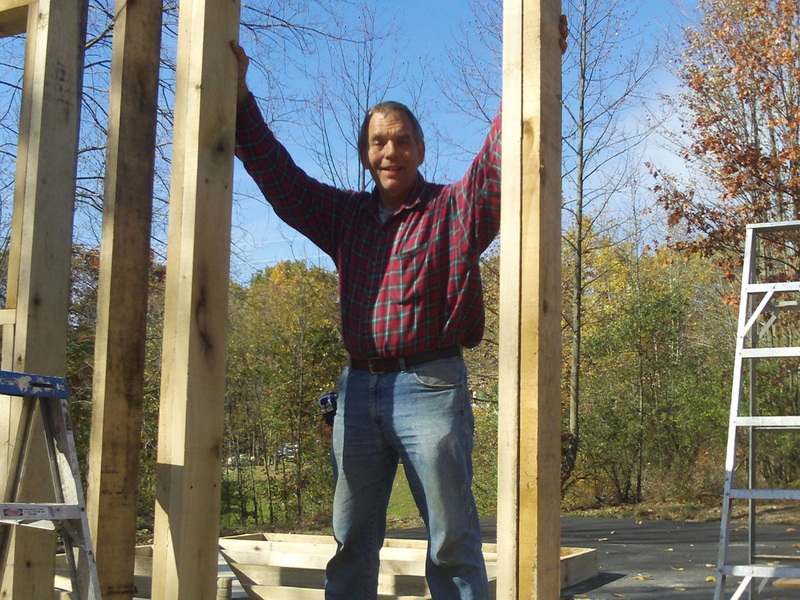 I have been around construction for 35 years. It isn't that I shouldn't have known this, but I just never gave it any thought. I drive a 2005 Ford Ranger! NOT a GMC dump truck! 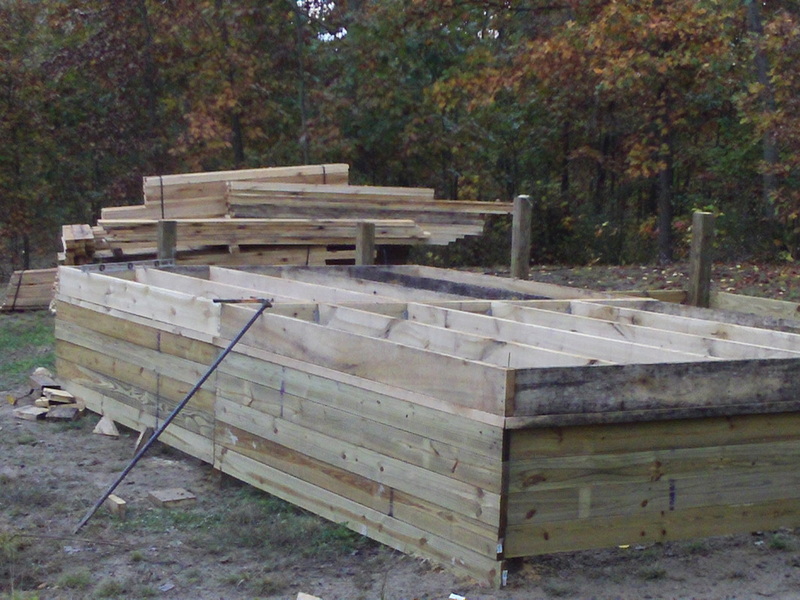 2 1/2 loads later, and three trips out to my new property, I had all the lumber on site! By the time I got everything there and unloaded, it was dark. The plan when I left work was to set up the batter boards and be ready to start drilling holes after work tonight. I have the auger reserved for this weekend! Oh well, this will just be the first of many, I am sure!! This weekend is supposed to be beautiful and there should be some good progress. I will post pictured at the end of the weekend of where we are. 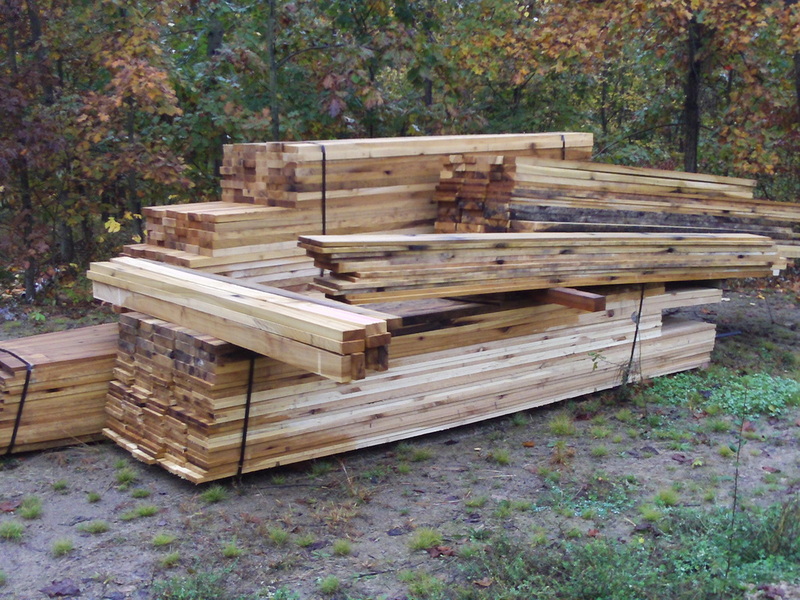 I got a call this morning from the sawmill where my lumber was being cut. They had my order cut, and ready for delivery! Wow was I excited! I made arrangements to meet them at my property at 3:00pm. I left work at 2, and stopped quickly at lowes for 50 lbs. 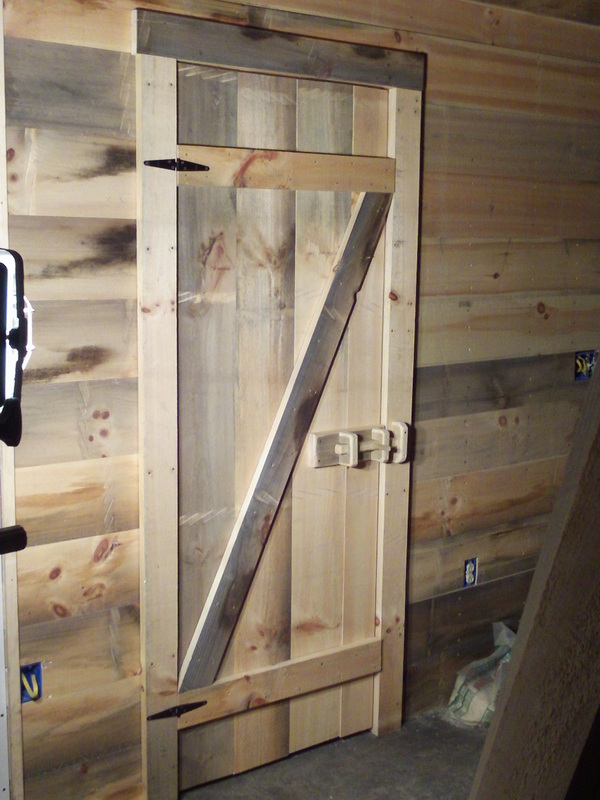 of nails, and a new saw blade. Then a quick stop at my current house for tools. Generator....check.....hammer....check......level....check...lol In my haste, I forgot to grab the camera! It is supposed to rain here the rest of this week on and off, so I wanted to get started. 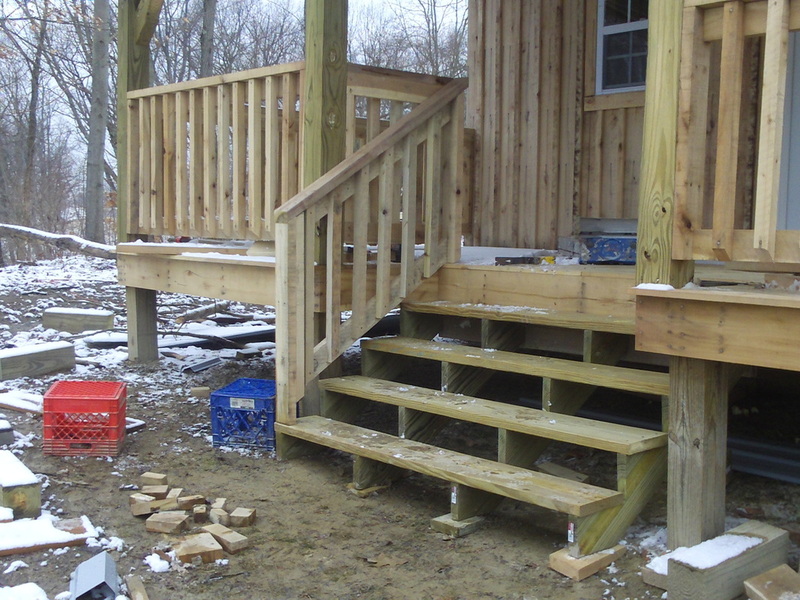 While I waited for the lumber to arrive, I trimmed off the top of the posts, even with the top of the treated skirt boards. The driver finely arrived and backed into the property. 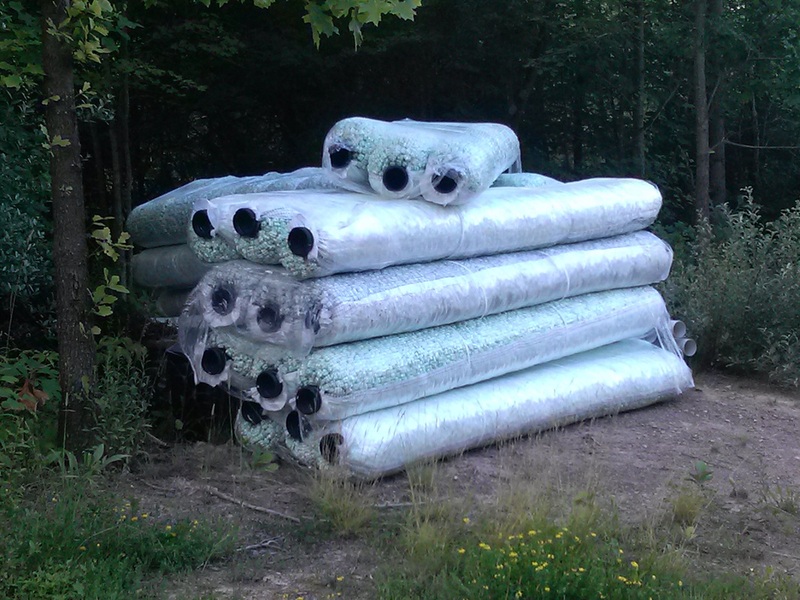 There were 5 large bundles banded together. I suppose they bundle them however they will best travel and dump. All sizes of oneby's and twoby's were sorta mixed together. 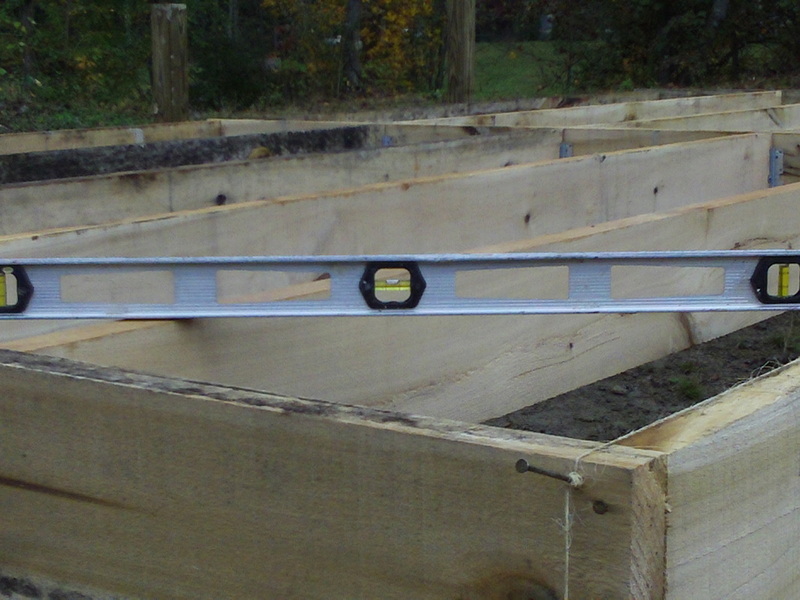 I spotted the 2X8X10's that I needed for the floor joists, on a the bottom of one of the upper bundles on my side of the load. Oh crap, I thought! I didn't think to bring tin snips to cut the bands. Just before the driver dumped the load, he explained the bundles will probably tip over, bands will break, and things will go everywhere. He slowly raised the bed and the load began to slide back. As he pulled slightly forward, the entire load dropped right into place, still stacked perfectly, and the bands on the bundle I needed broke. Everything stayed stacked just as though it had been stacked right there in place! Wow, nice job! 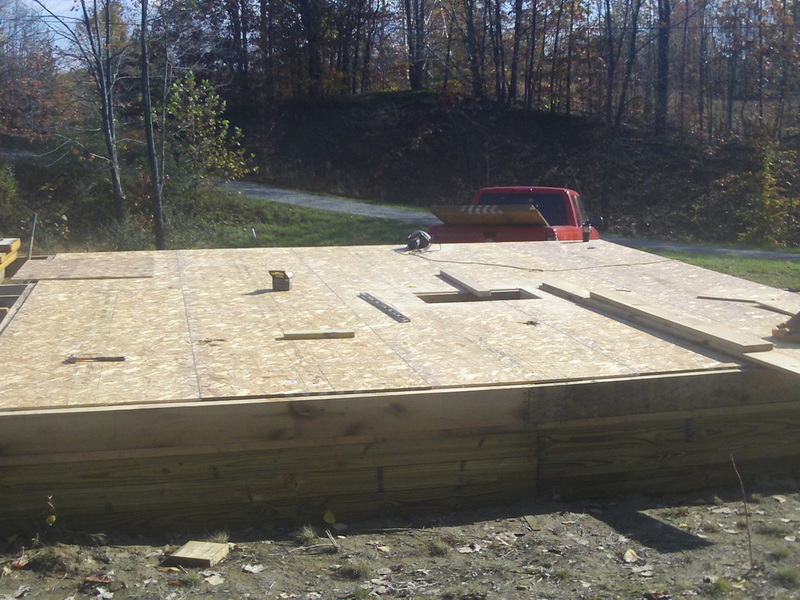 From the top of the broken bundle, I had to remove about 24- 2X4X8's that are for the interior wall studs, and about a dozen 1X8X8's that are for siding. 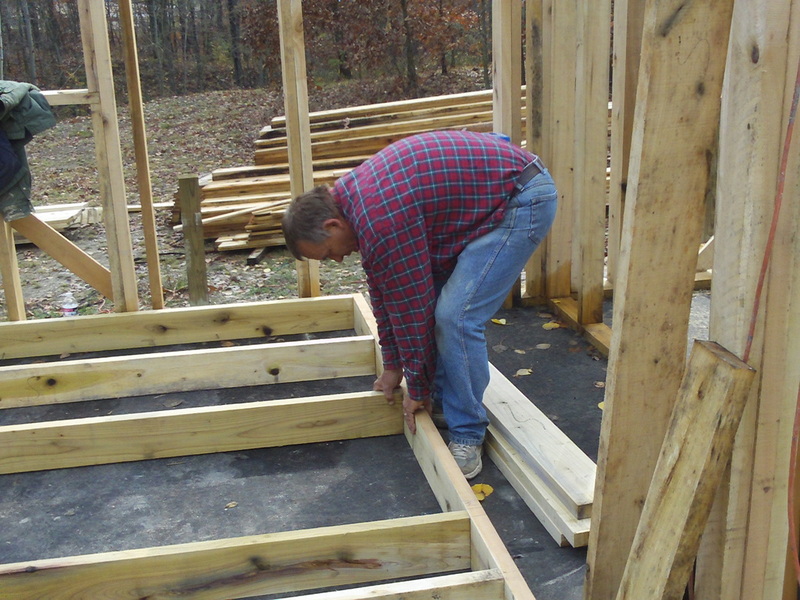 That exposed the 2X8X10's that I needed for the box sill and floor joists. 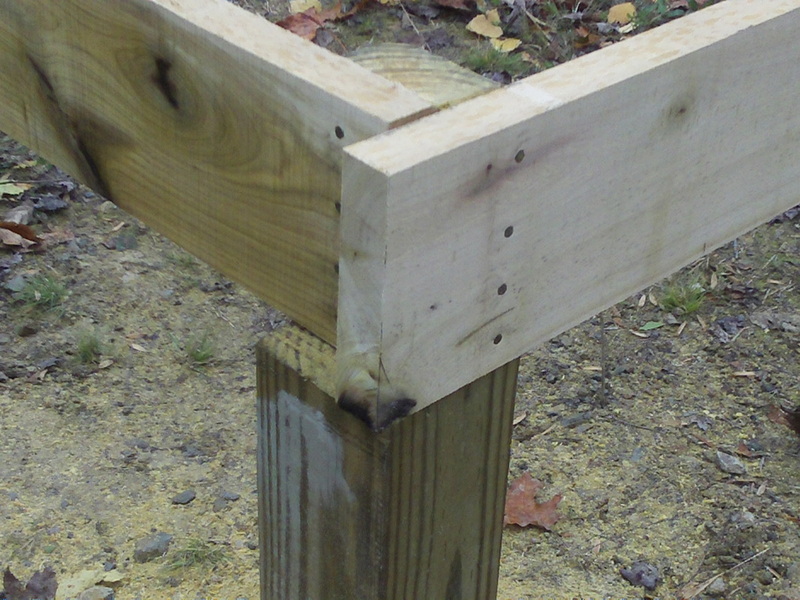 I started by laying the "cap sill" flat on top of the posts. 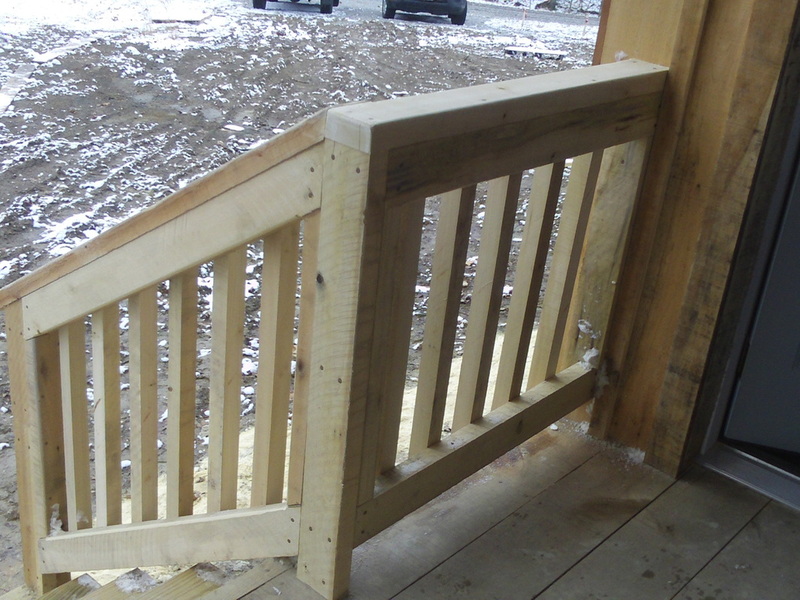 I mitered them 45 degrees at the corners, so all of the sills would lay on the corner posts. 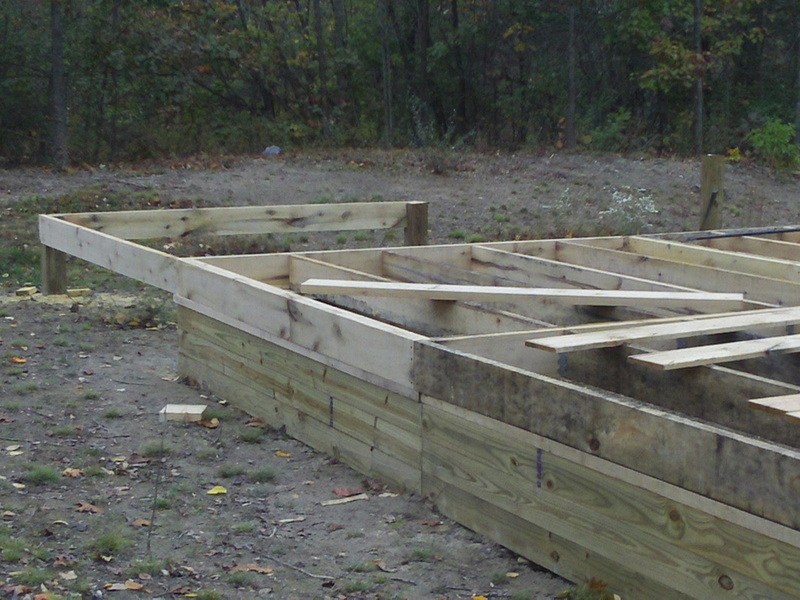 Next I built a 10'X10' "box" with the inside corner resting on the post in the center of the foundation. 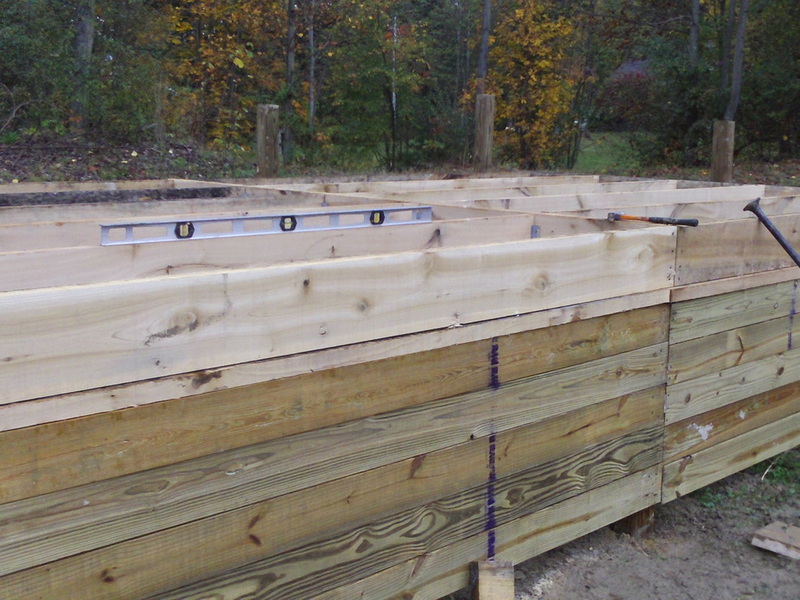 Before it got too dark, I was able to get the floor joists set in place inside that box, completing the floor joists on the front right 1/4th of the floor. lol....this is exciting stuff! 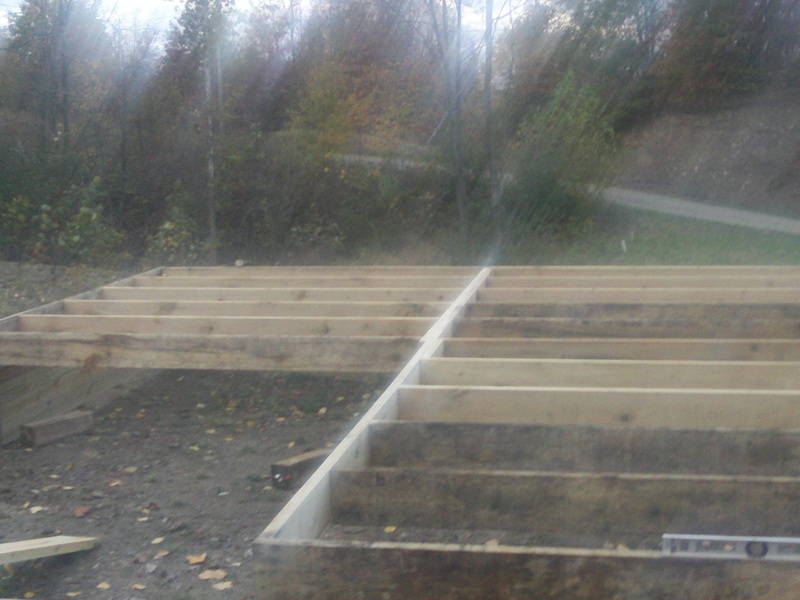 If the weather holds, I will complete the floor joists by friday, and can sheet the floor this coming weekend! 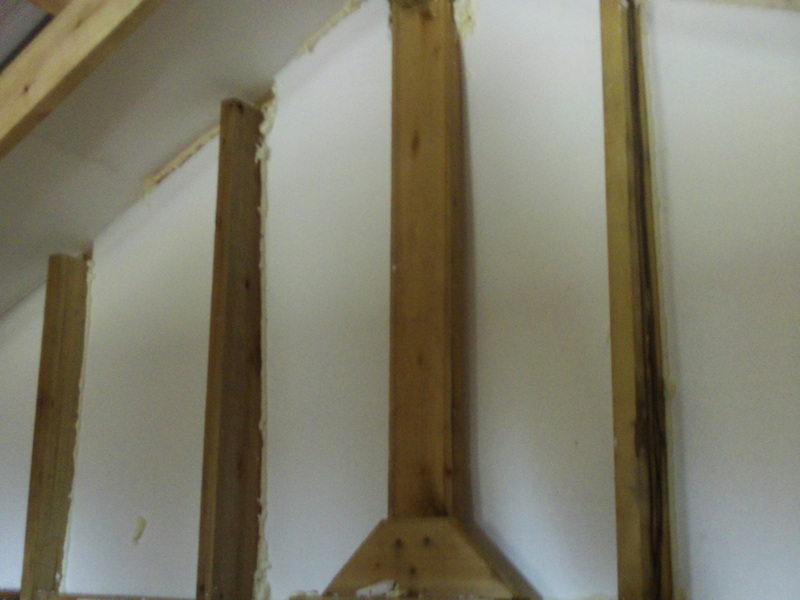 I will be treating the plywood with "static asfault" to protect it from water until I get under roof. 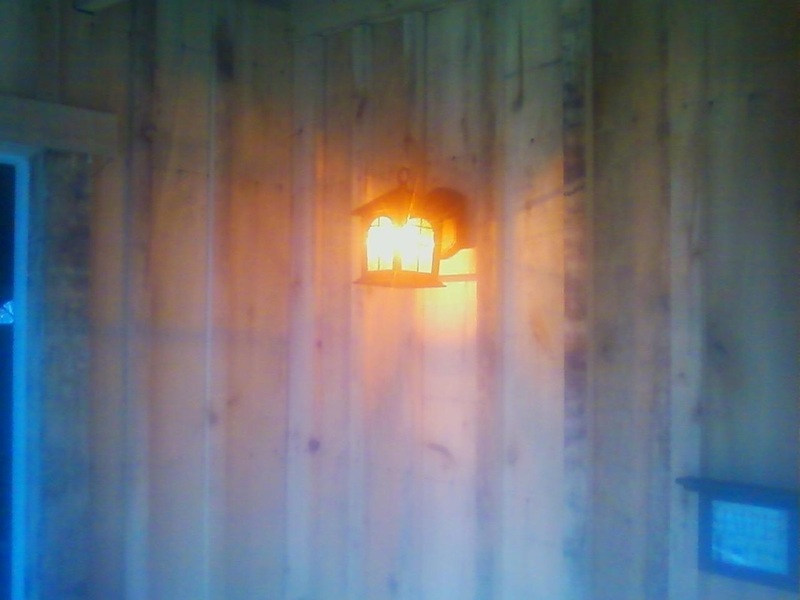 I did this on a log house I built years ago, and it held up very well for almost a year. 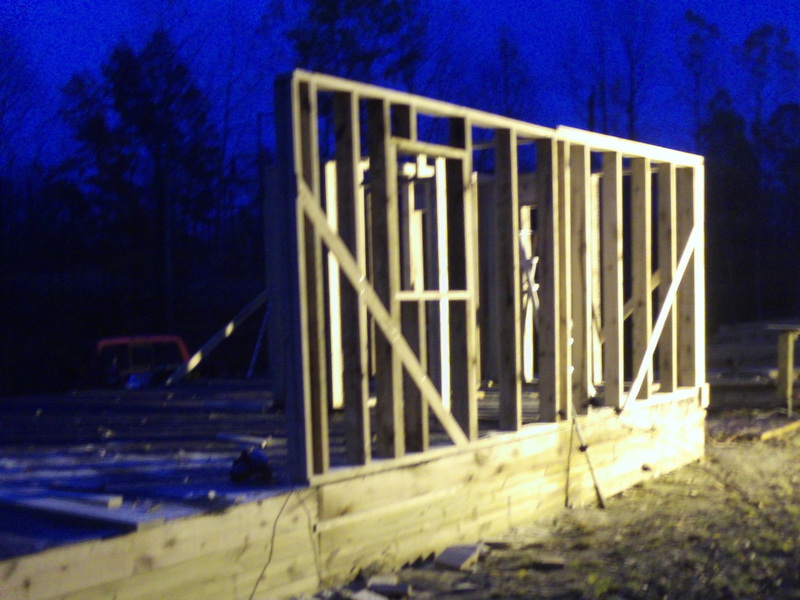 Tonight, I will get pictures of the progress! One more thing I want to throw in here. 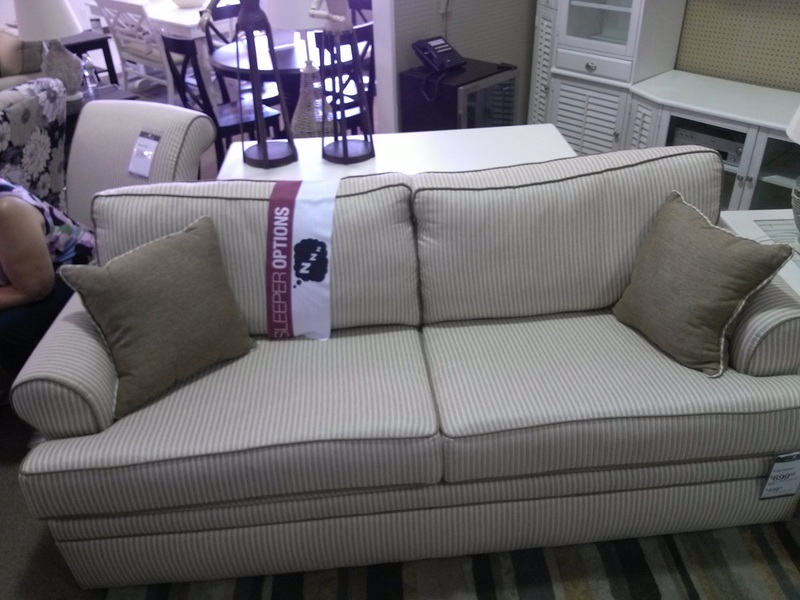 I have had tons of doubters on the furums, thinking I need far more posts in place. 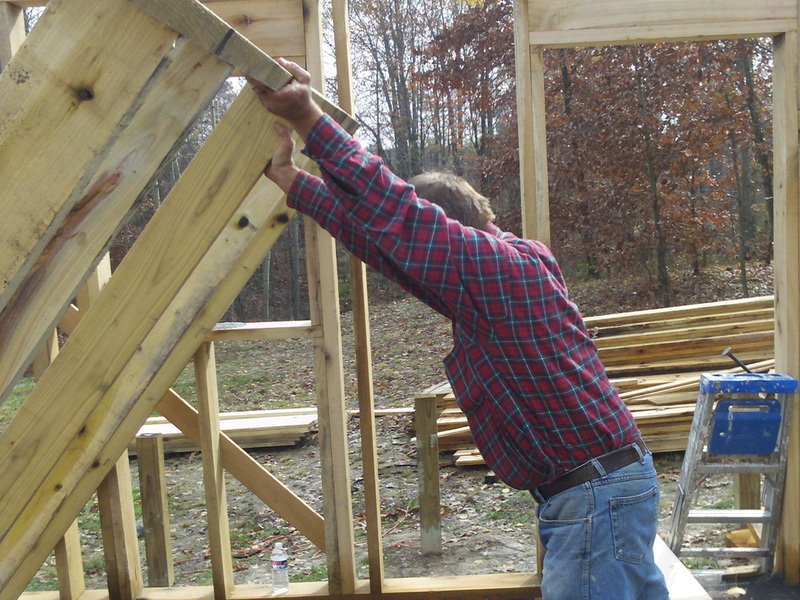 As I have stated lots of times, I learned this method of construction from an old timer. Coinsodentely, I also came across it in the book I mentioned above "The Green Wood House". Nobody gave me a chance to explain the entire process, so I finely just gave up trying to explain it. But, here is a great drawing from the book that explains it very well. 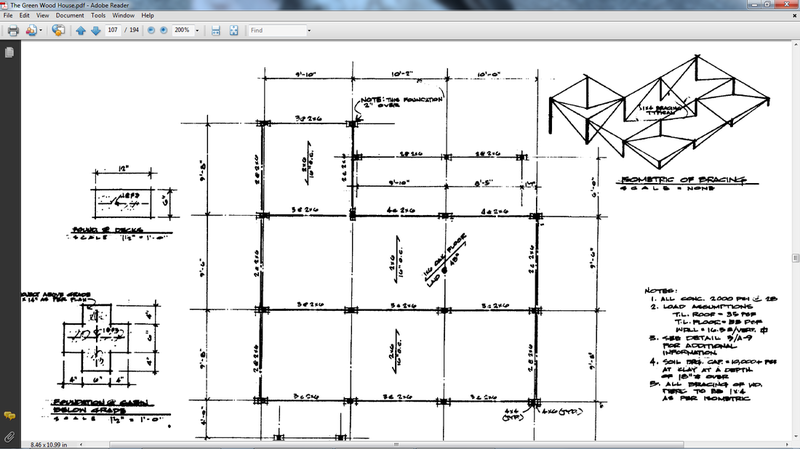 Notice, although the drawing snows 3- 10' sections across the front, I only have 2-10' sections across the front. The rest of the footprint is exactly the same as mine! It was a beautiful day all day today until just about time to get off work. I checked weather.com right as I was leaving and the weather map showed storms moving in from the south. It predicted them to be here about 5:00pm. That gave me 2 hours, not much time. 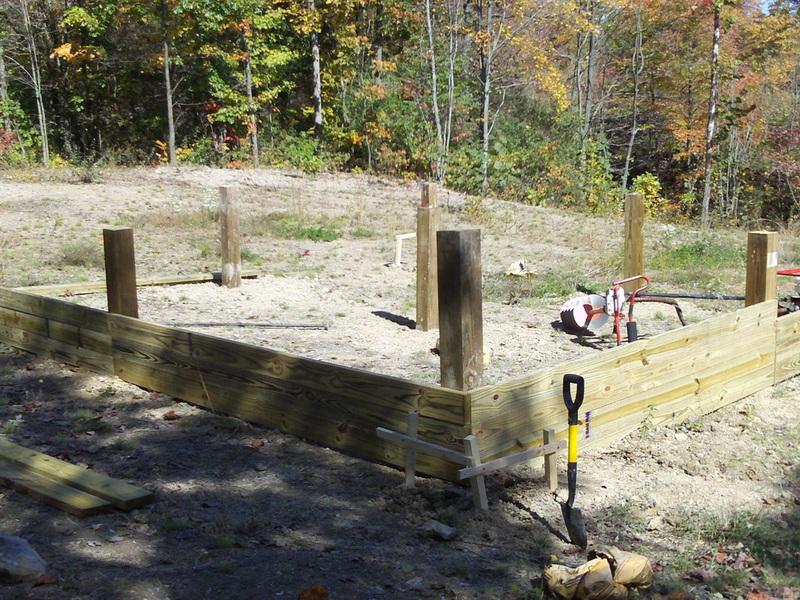 I headed right to the build site with what few tools I had with me. No time to stop home for the generator or other tools. 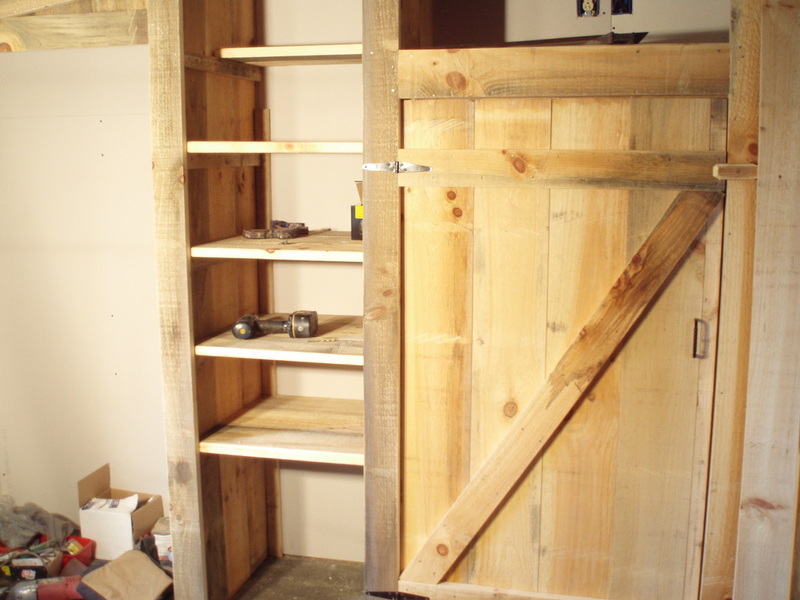 There were a few nails I could add, some scrap wood needing piled, etc. 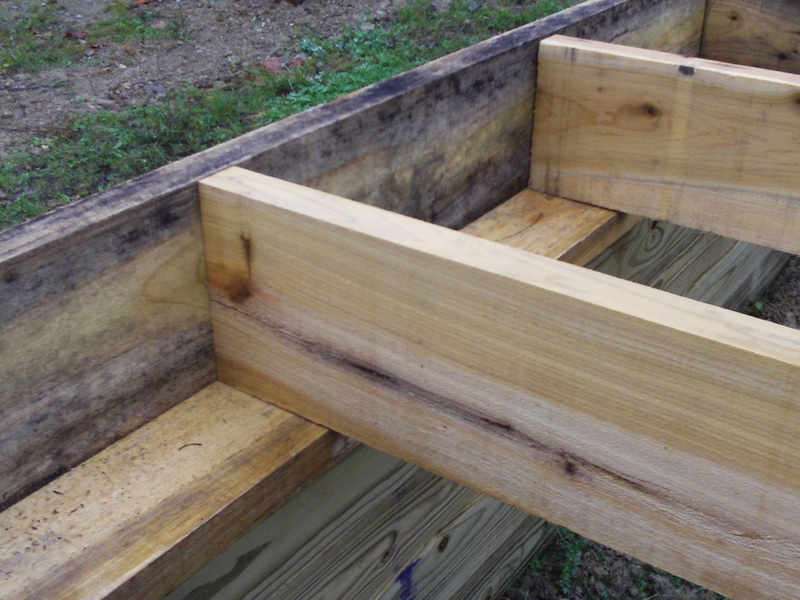 For rough sawn lumber I am pretty happy with the way it is coming out! 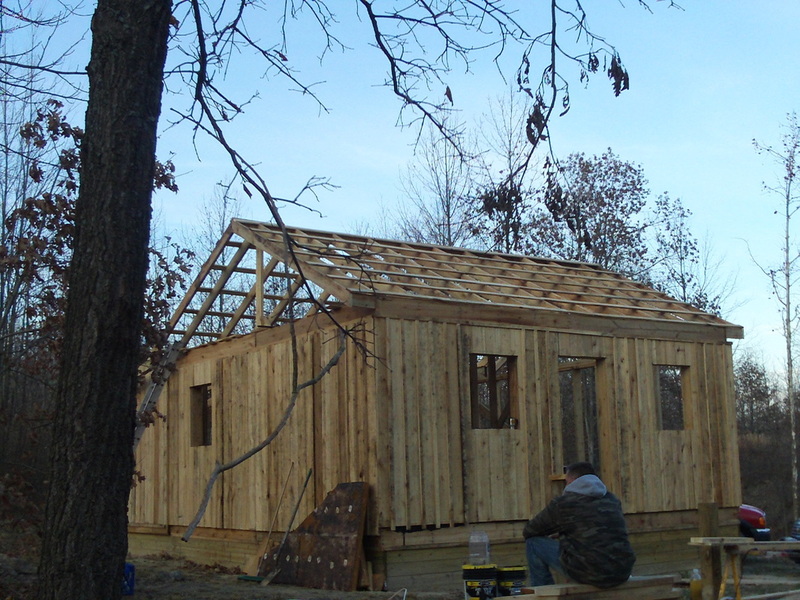 Below, I will post a picture of what I am building. 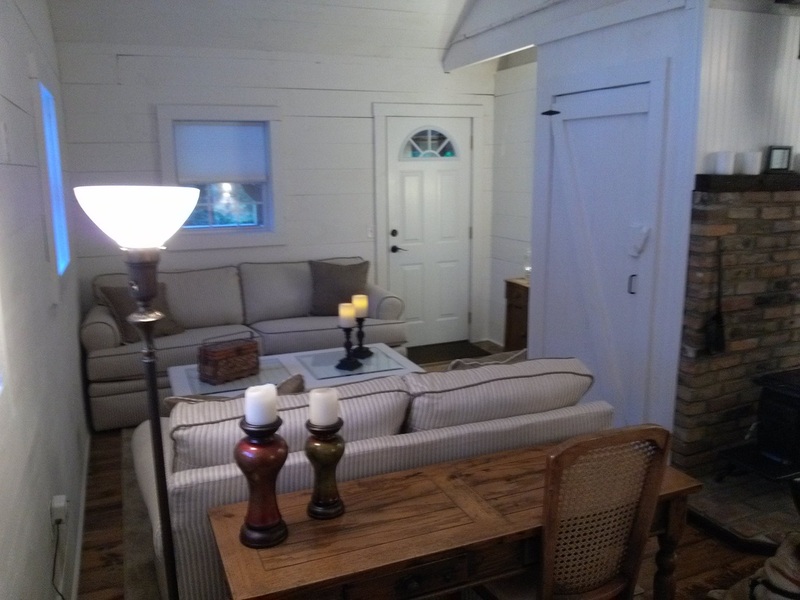 This is a picture of a house I found on another website that is exactly what I pictured ours to end up looking like. I arrived at the build site about 7am and took the tire off. A quick trip to walmart and $120.00 later, I was back for a days work. 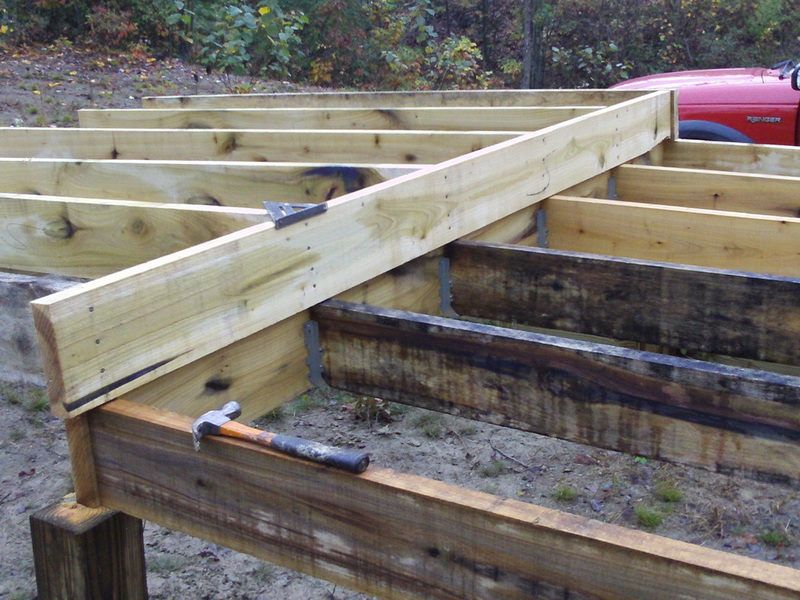 I finished the floor joists in the main 20X20 section. 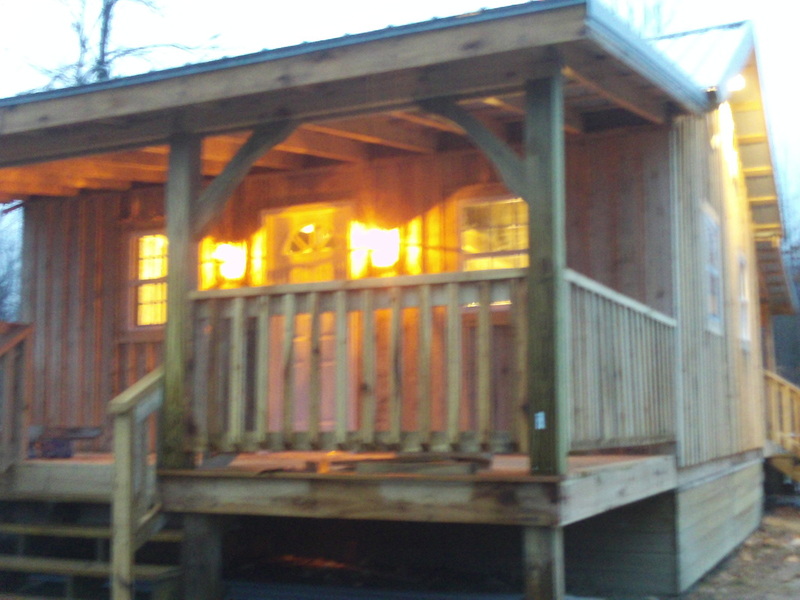 We have decided to use part of what would have been the back porch as the bedroom. This was one of the things we discussed when in the planning stages as an option we would decide on later. 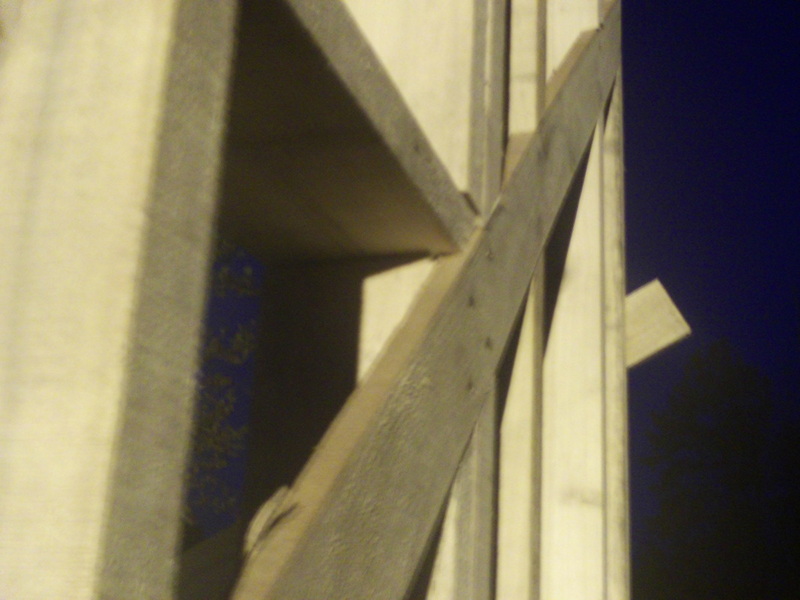 When I designed the foundation I designed the support at each corner of 8 - 10'X10' squares. 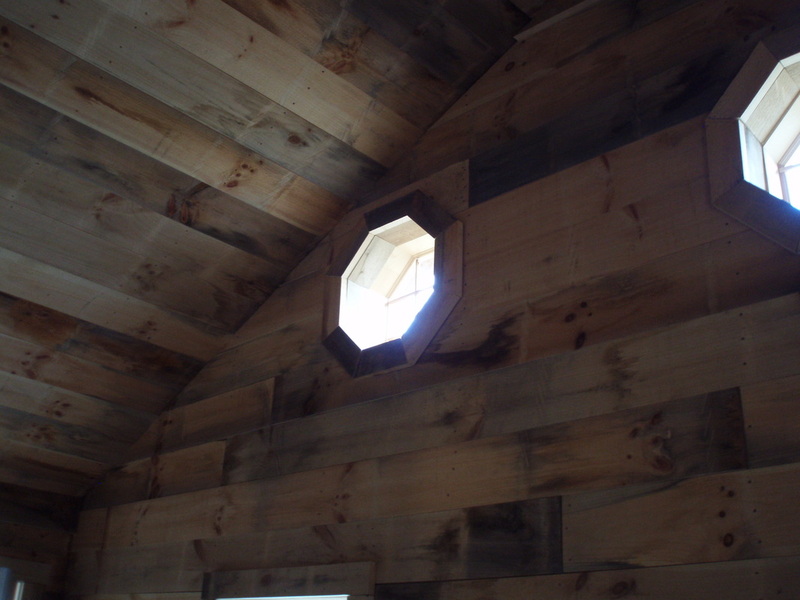 The center 4 squares make up the main body of the house. 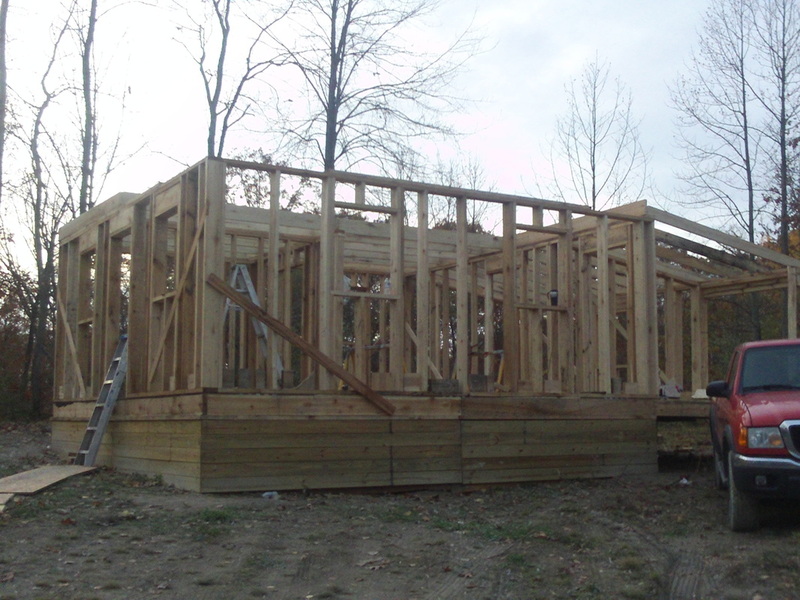 2 10'X10' squares at the back and 2 10'X10' squares in the front, originally formed the porches. 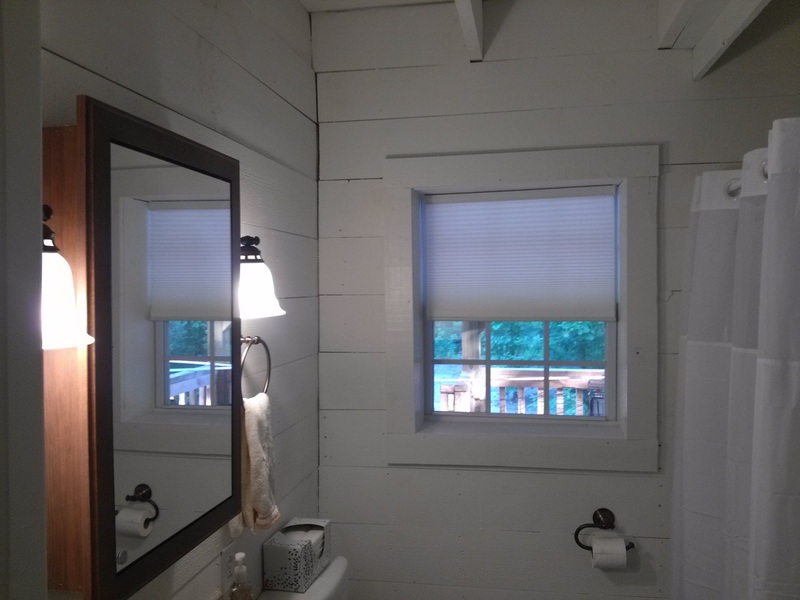 What I will do is use one of the 2 squares in the rear as a bedroom. 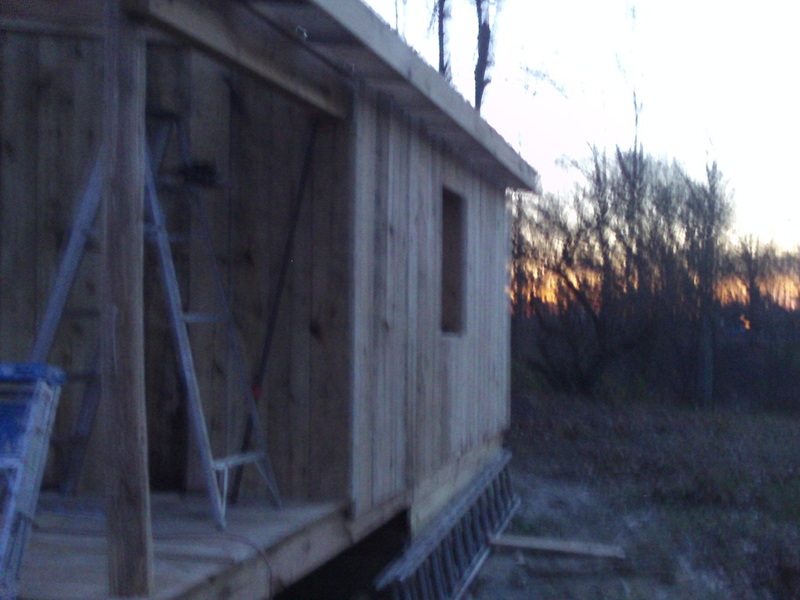 The other 10' square will be a smaller back porch. I hope that isn't too confusing. Here is the new floor plan. 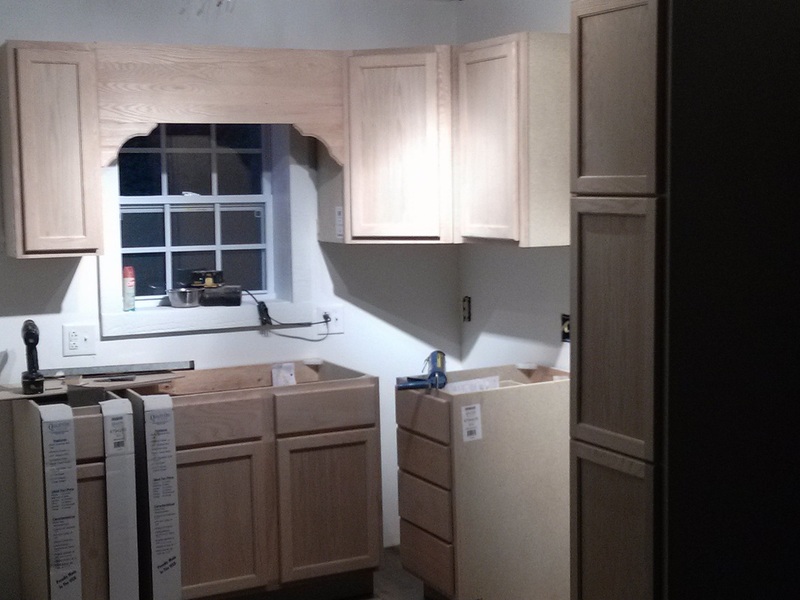 Tonight, I built the kitchen wall. 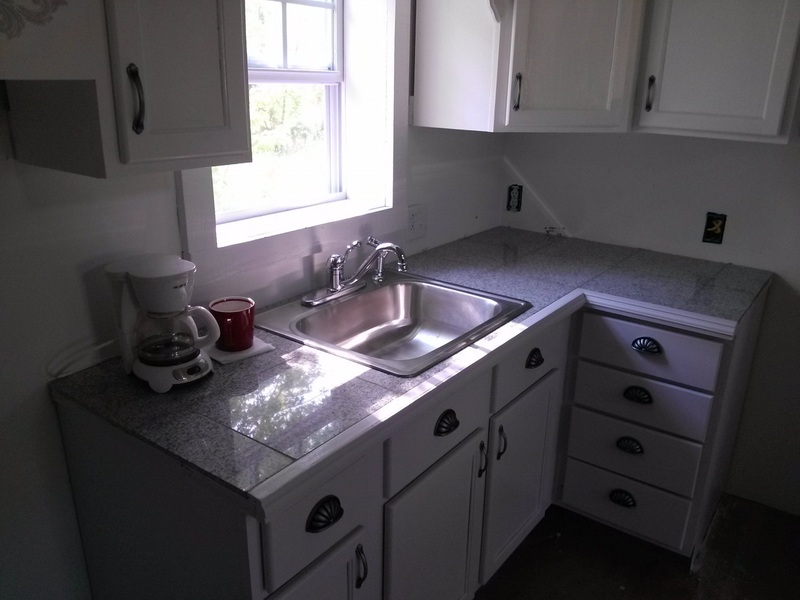 The window will be over the kitchen sink. Today, was a busy day! 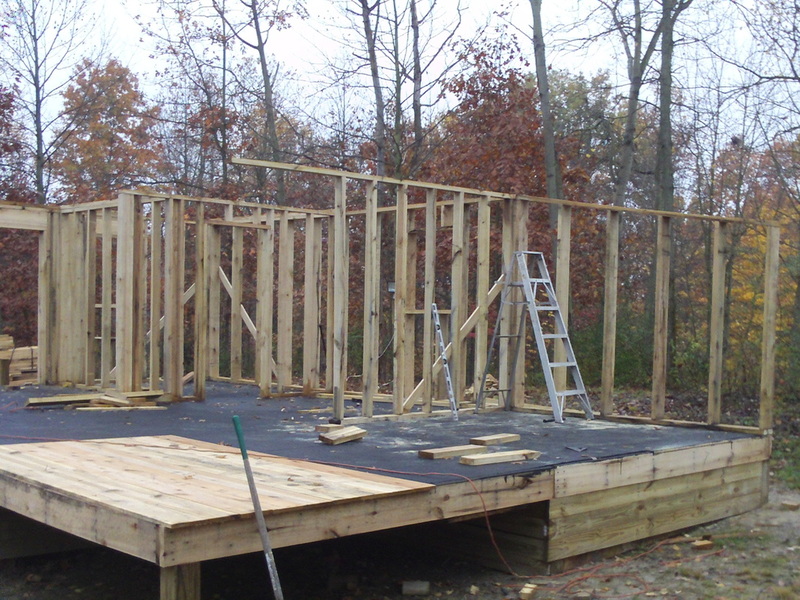 I got all the walls finished except for the one on the north-east side. 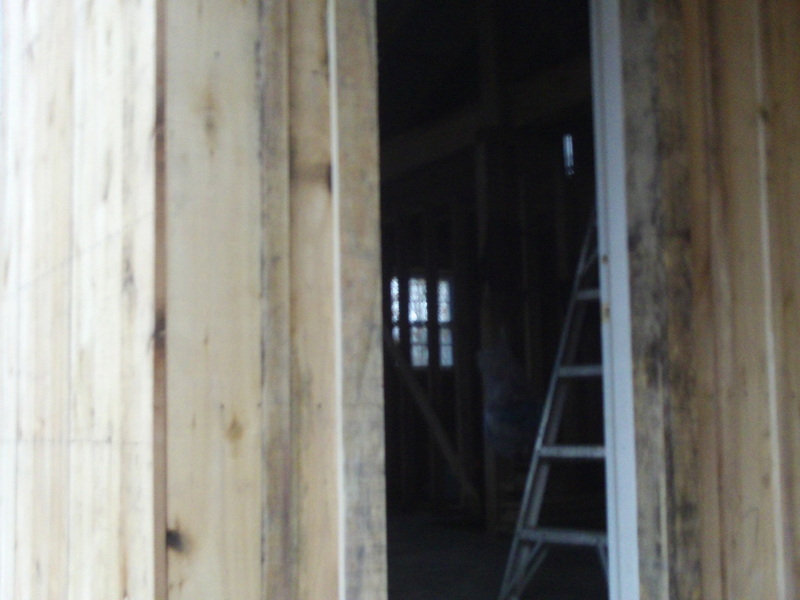 It will take some time because there are 2 windows to frame up in that wall. 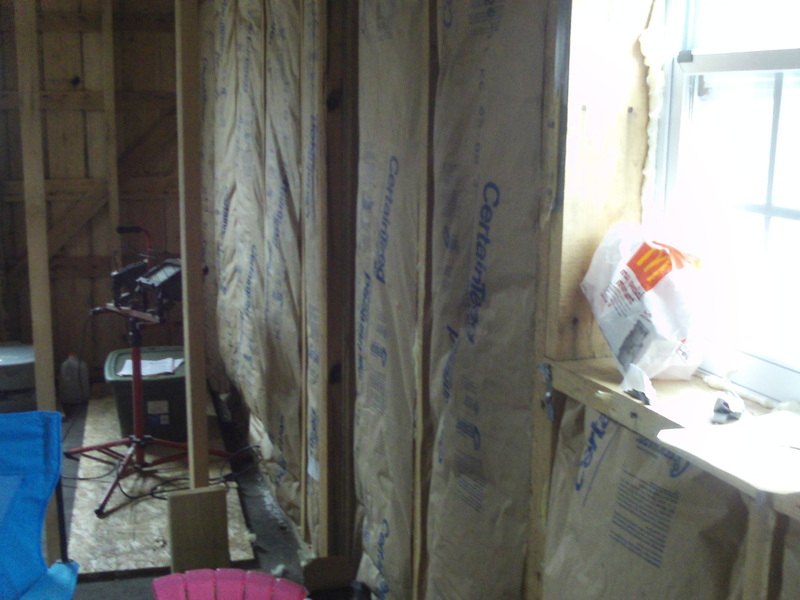 The kitchen, bathroom, and bedroom are now fully defined and walled in. 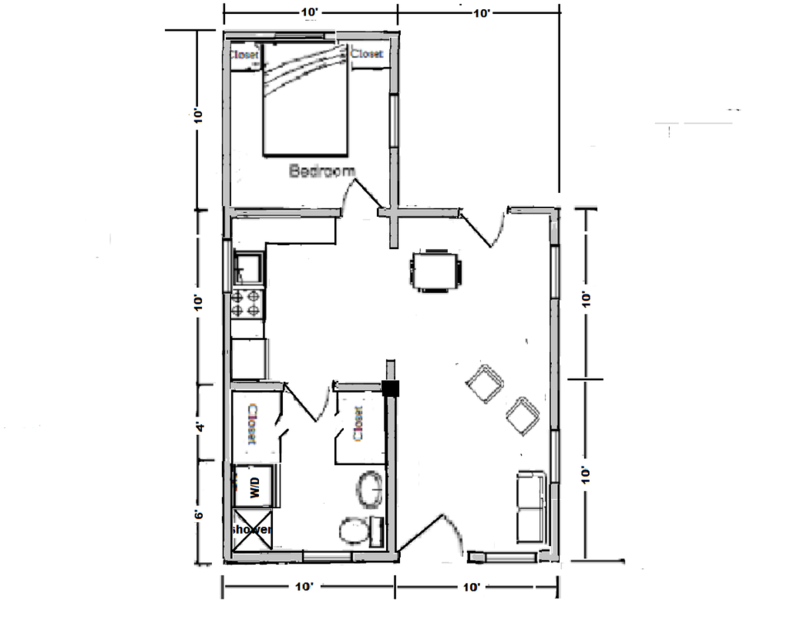 It is cool seeing the actual room sizes and planing where things will go. Today, was a monumentous occasion! I stood the last wall. 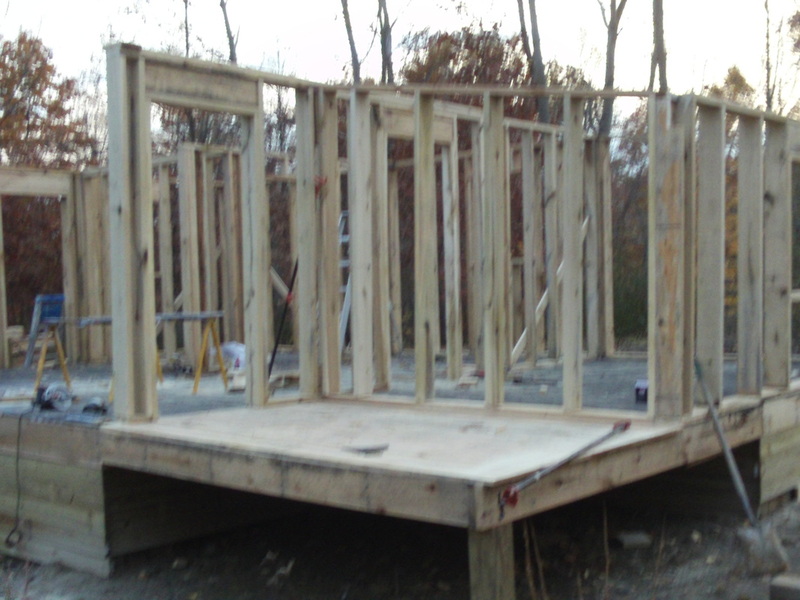 I still have to inlet some angle bracing at the corners, and add the stiffeners on top of some of the walls, but for the most part, they are done! I took another vacation day today. It was so beautiful today, it went up to about 65 and was sunny all day. Once again, I am exhausted! On days like this, I try to get as much done as possible while I can. That usually means I "over do it". lol....but that is pretty easy to do these days. 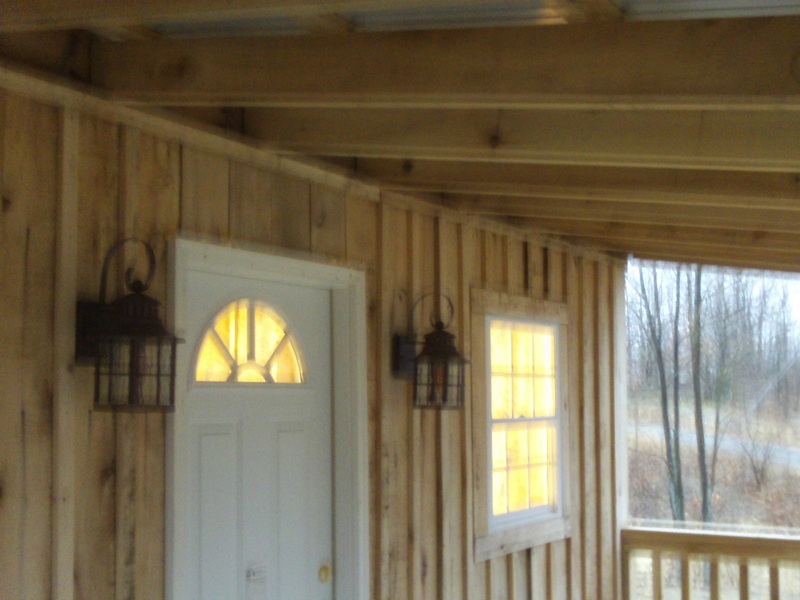 I got all of the rafters up over the back bedroom and back porch. 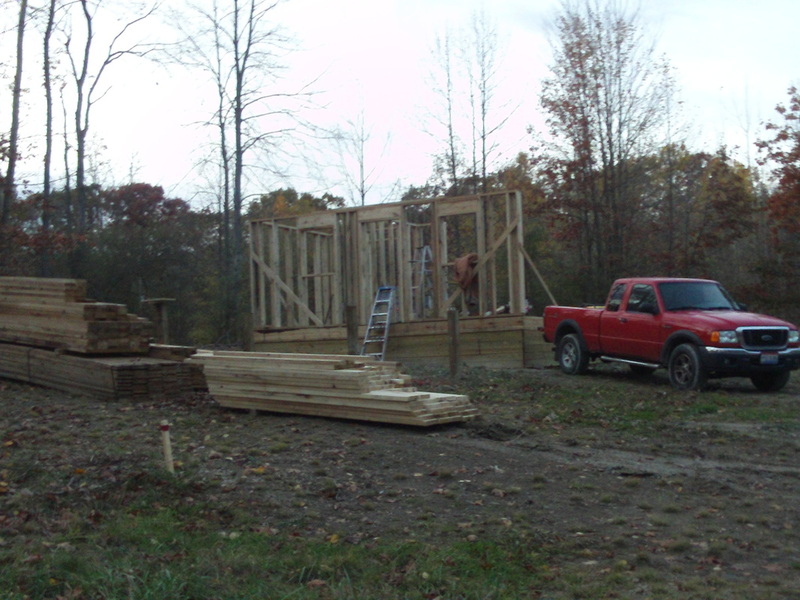 I also got all the floor joists up for the loft over the kitchen and bathroom. 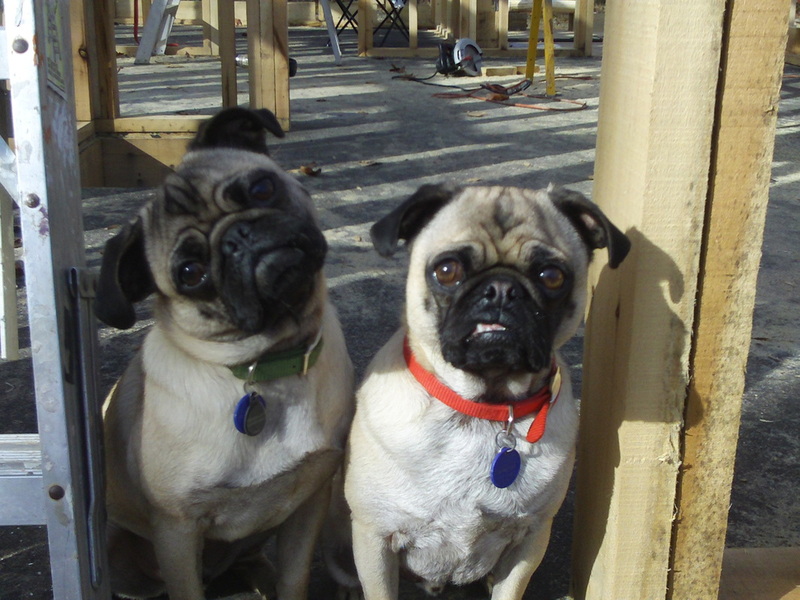 FLOYD AND GUNTHER STOPPED BY TO HELP TODAY! 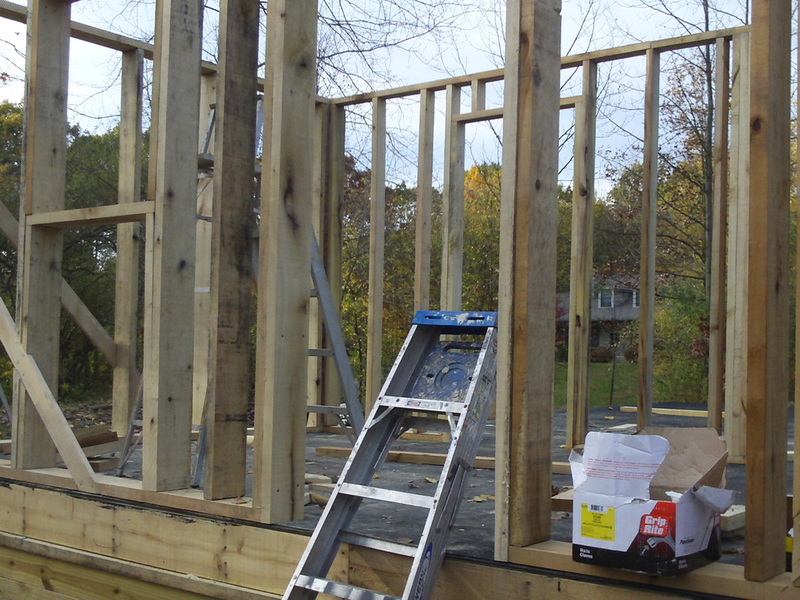 Today, I was going to start setting rafters. 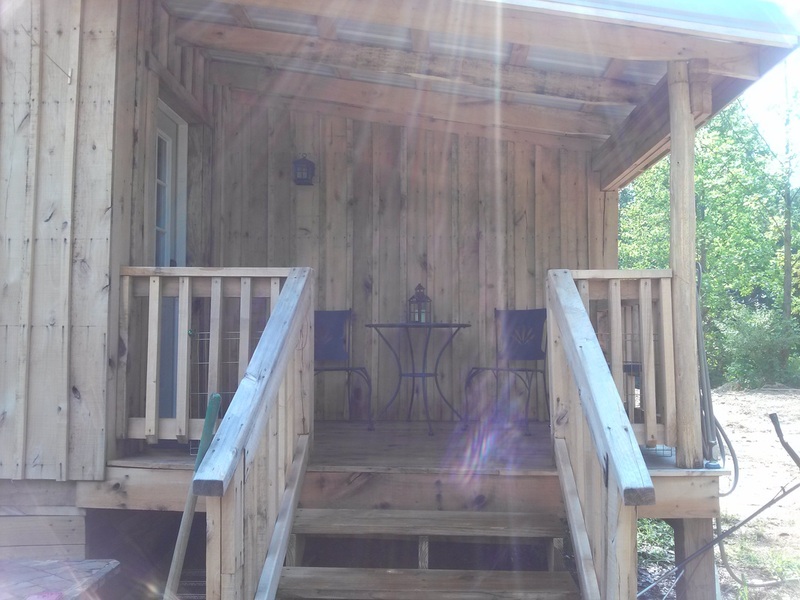 When I arrived at the cabin, I changed my mind. 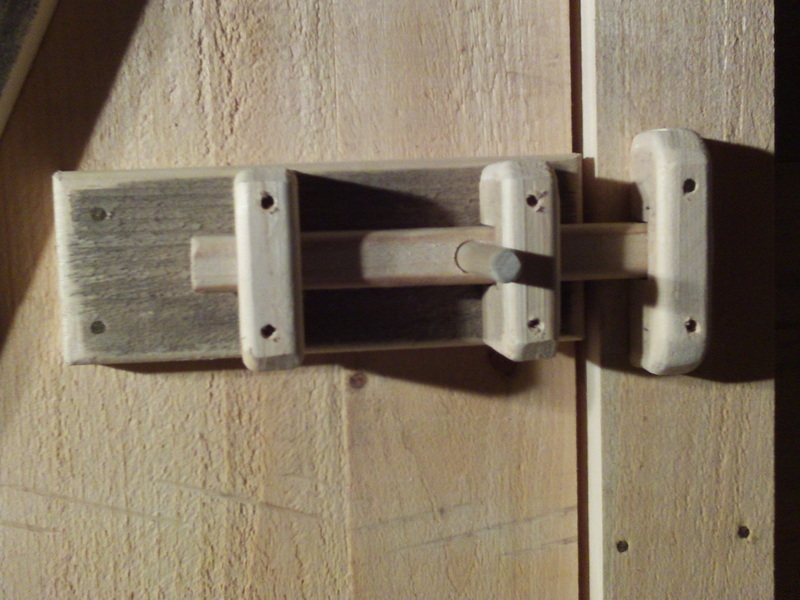 Although with the angle braces I inlaid into the studs, it is really sturdy. There is very little movement at all in the walls. Even still, I decided to put sideing on first. I know for sure nothing can shift or move then! 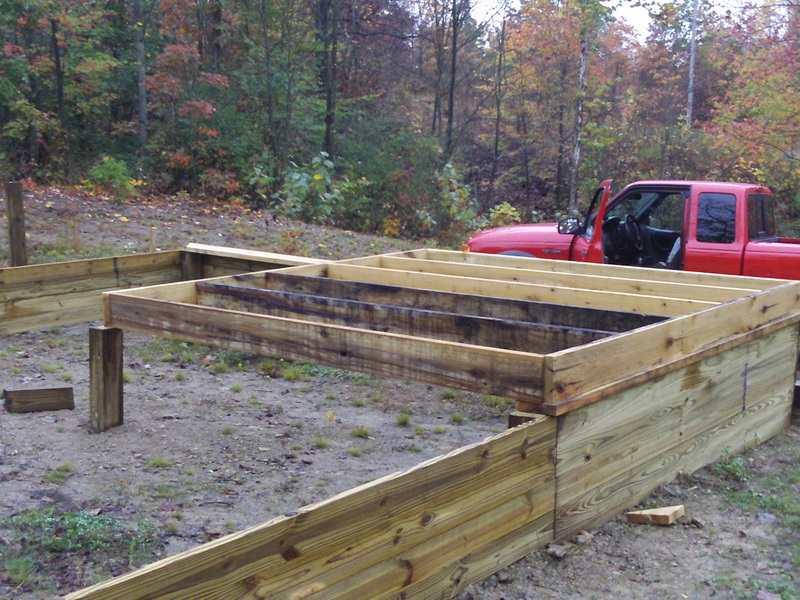 Here are some pics of my days work. First of all, thank you sincerely to all VETERANS for your service and sacrifices! Now, for the progress report. 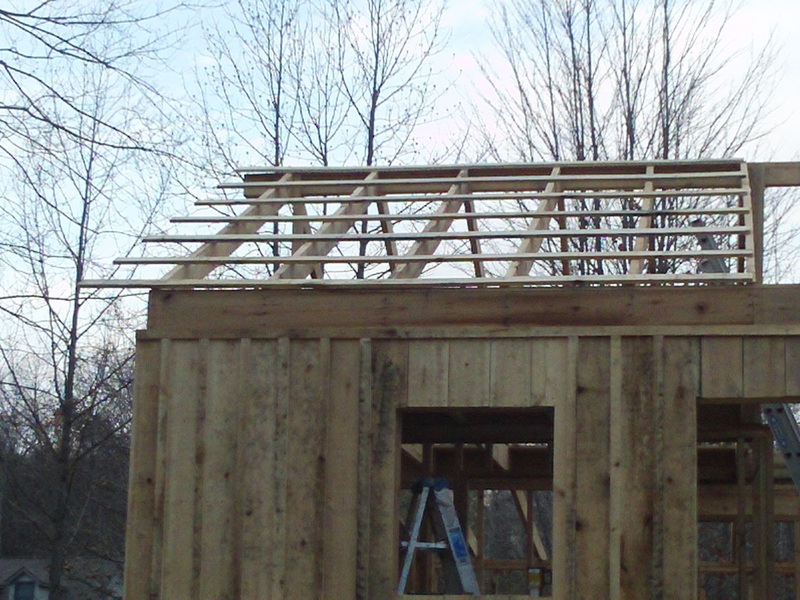 Today, all day a friend helped me with rafters. 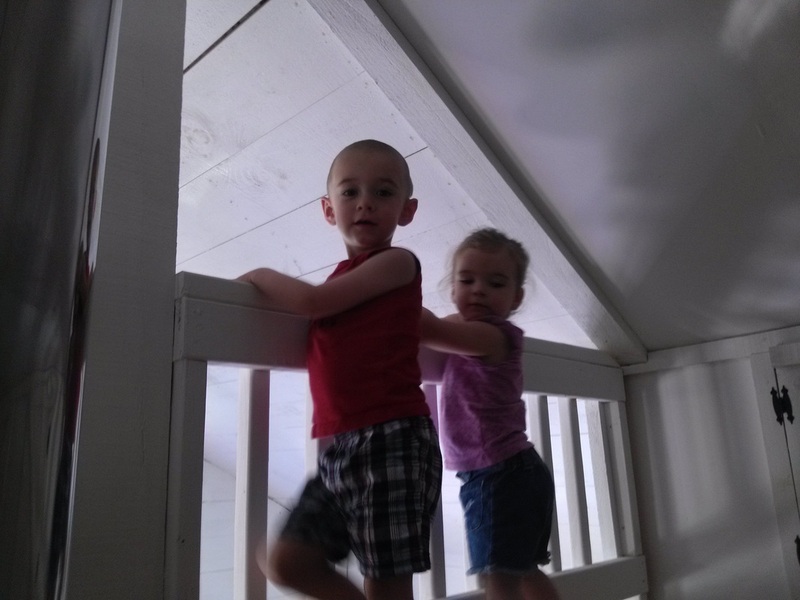 We set the high ones over the living room area where there is no loft to stand on. It wasn't any fun at all! 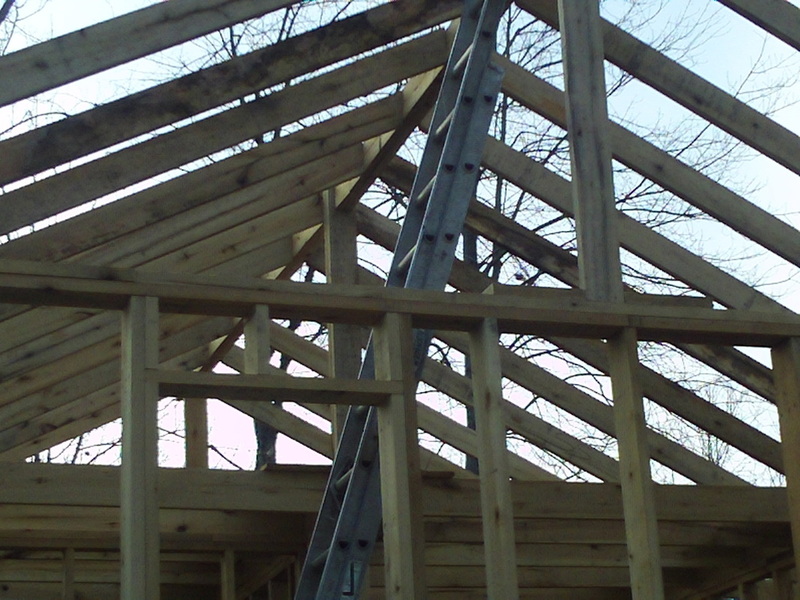 We also go half the purlins on. 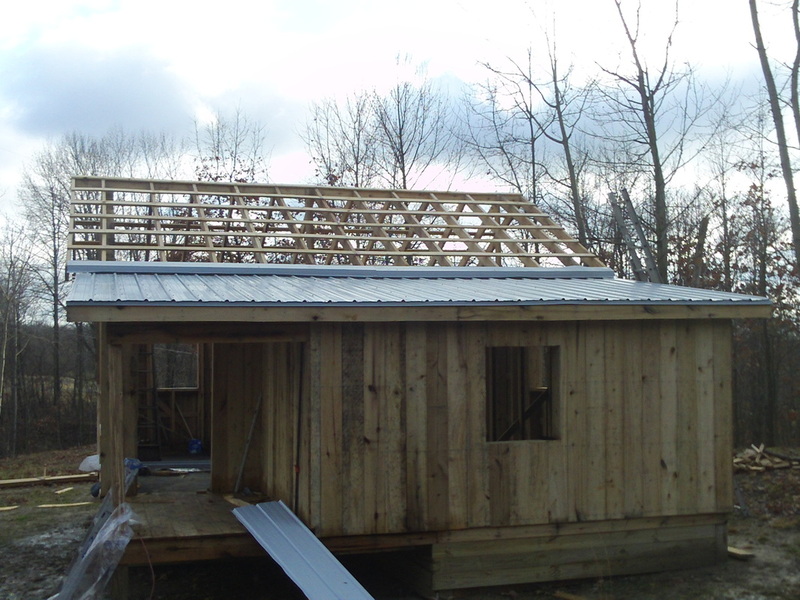 Tomorrow, we hope to finish the purlins, add the overhang rafters, and work on some siding. Nathan helped again today. 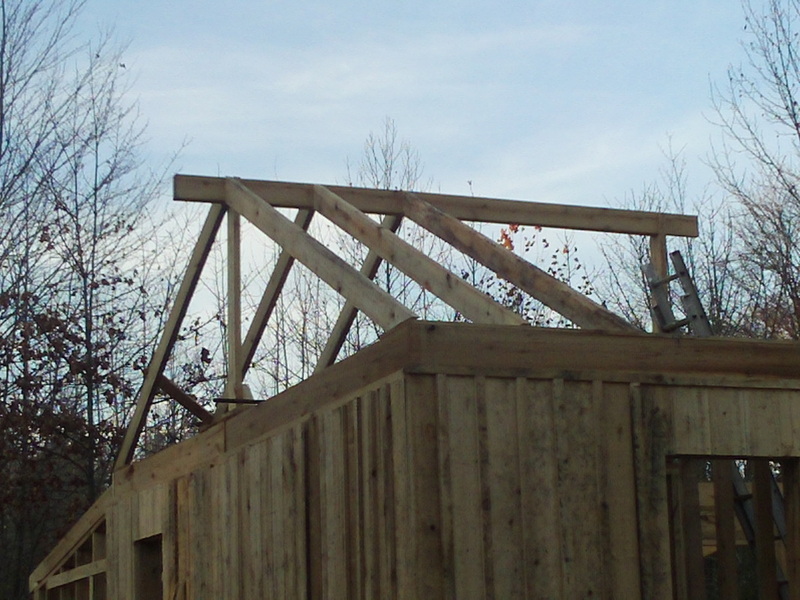 We got the purlins on and the overhang rafters! Wow, what a relief to be off that roof for a while. 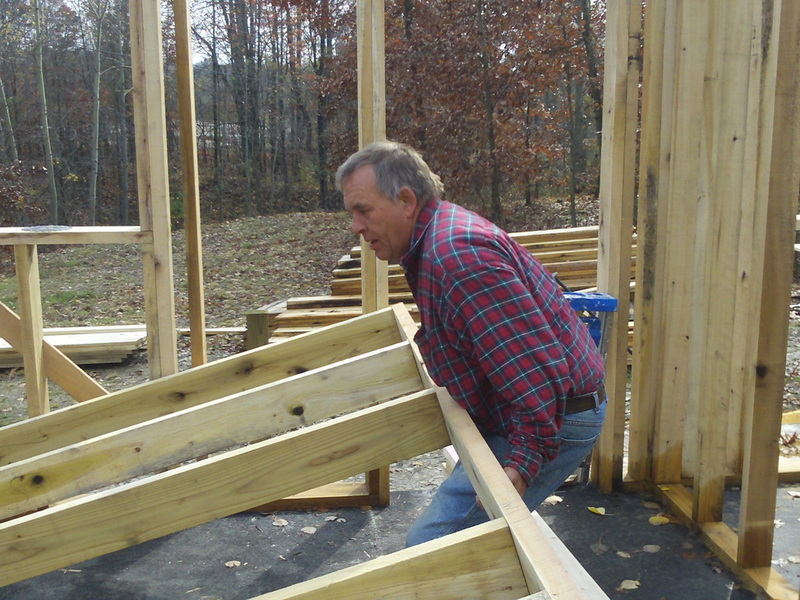 lol.....I fell 30 feet once years ago while setting trusses. I haven't been real crazy about heights ever since! Today, I did a lot of little things. 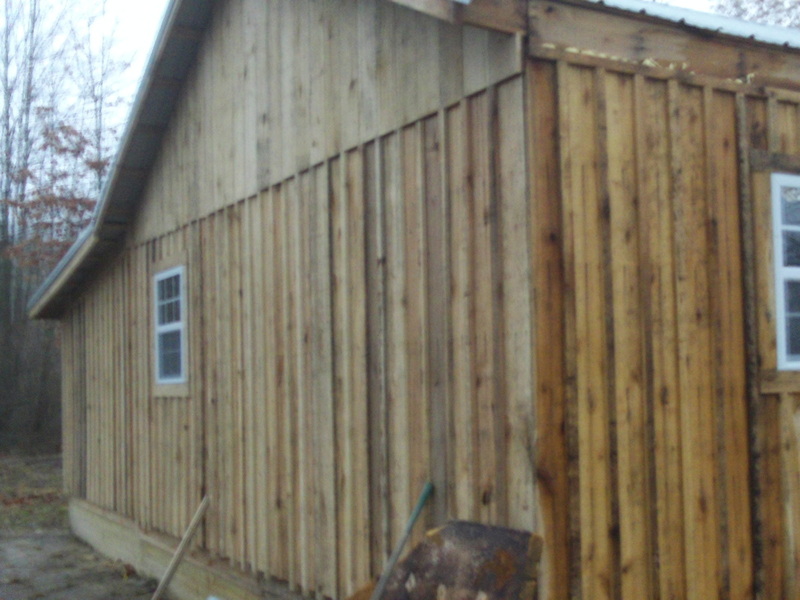 Not alot that shows, but I finished the siding on the back porch. 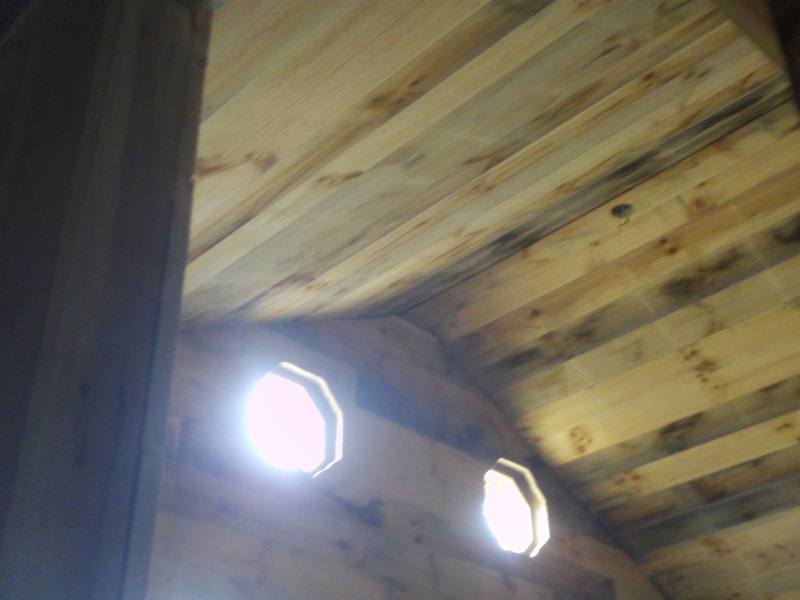 That involved cutting around the porch rafters and was very time consuming. 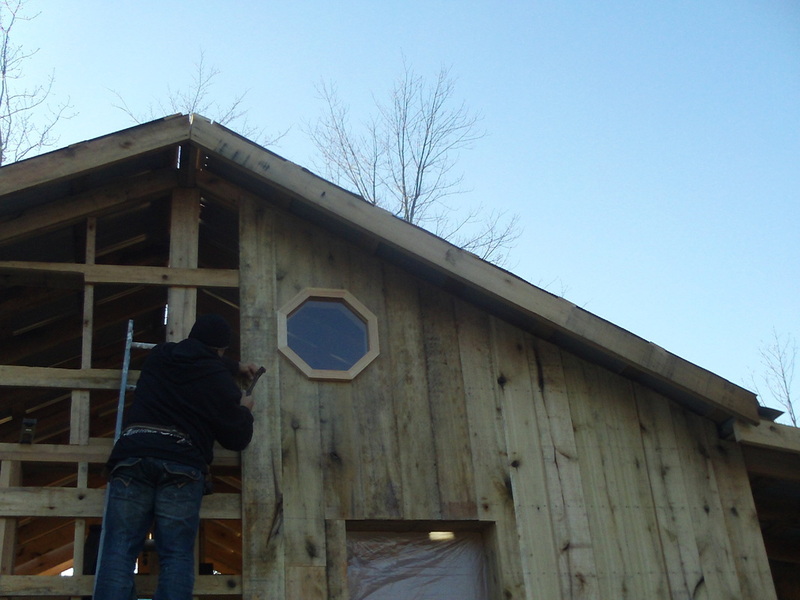 I also got the studs put into the gable end in the north east side. 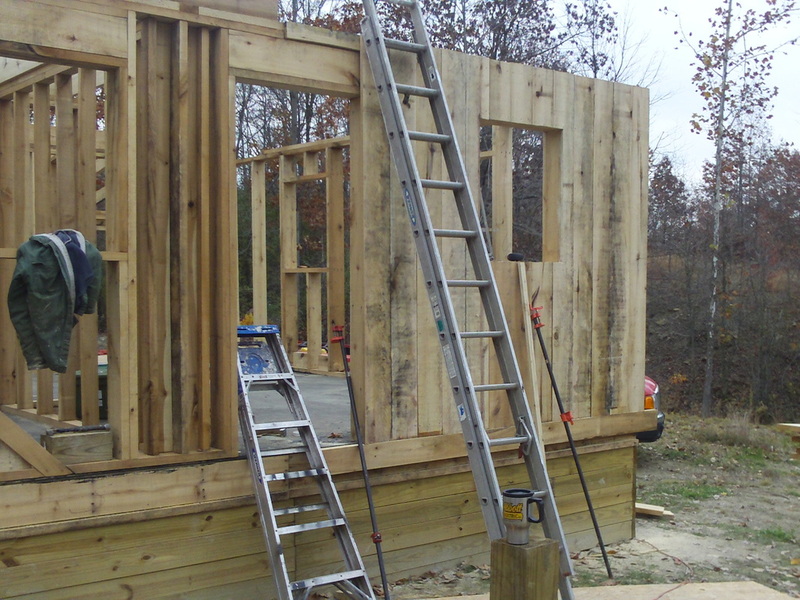 Now I have to rip and nail all the horizontal nailers and it is ready to be sided. 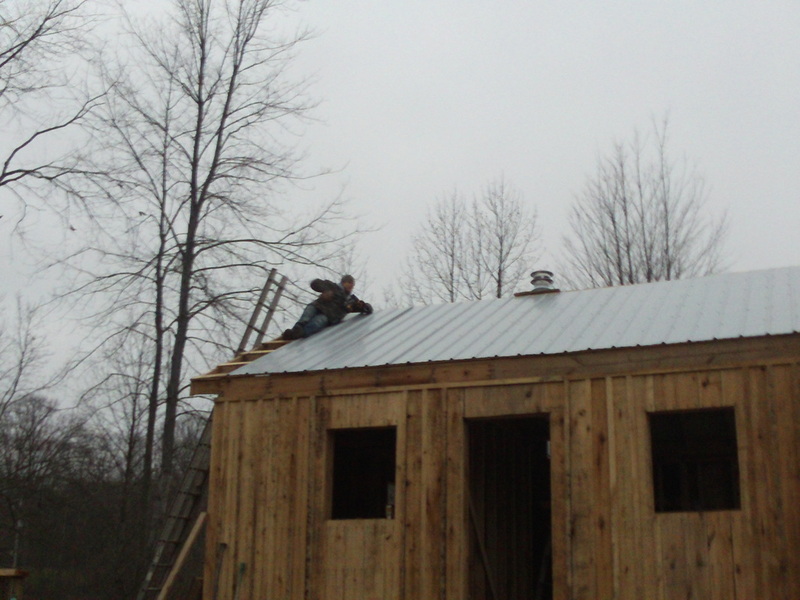 The Roof metal will be delivered the first of the week. 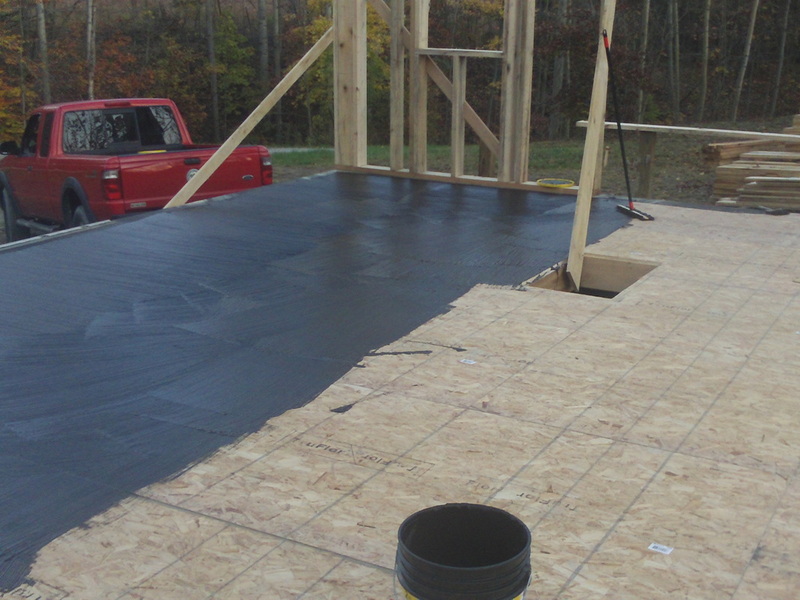 I hope to do the roofing over Thanks Giving weekend. 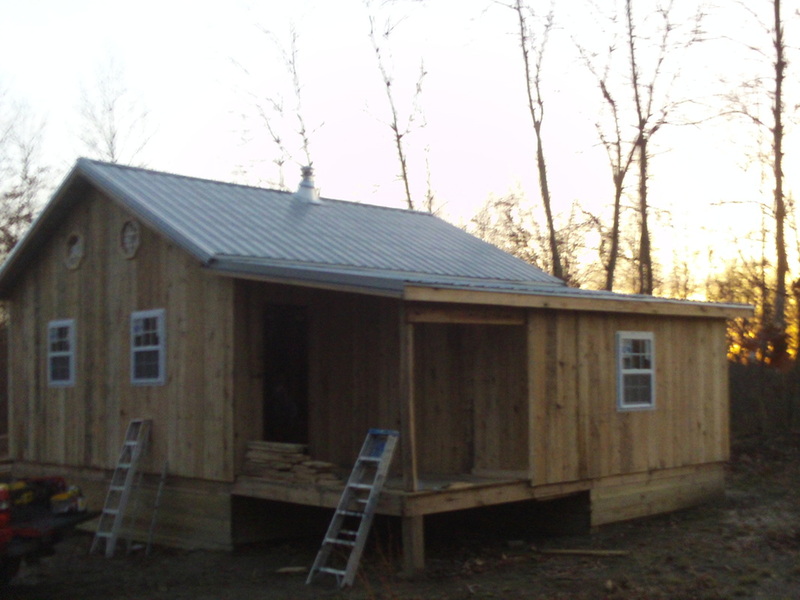 The neighbor is going to let me put the metal in his garage until we are ready to put it on the roof. 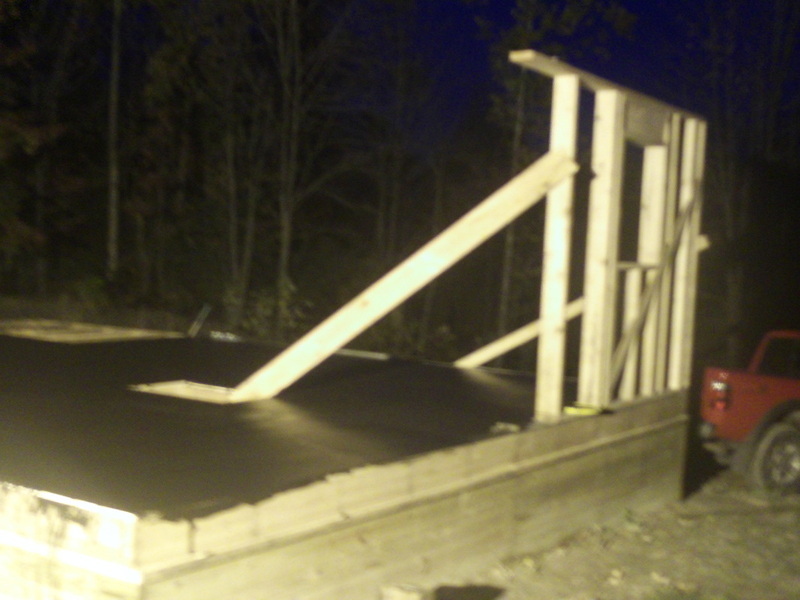 The metal for the roof was delivered this evening. 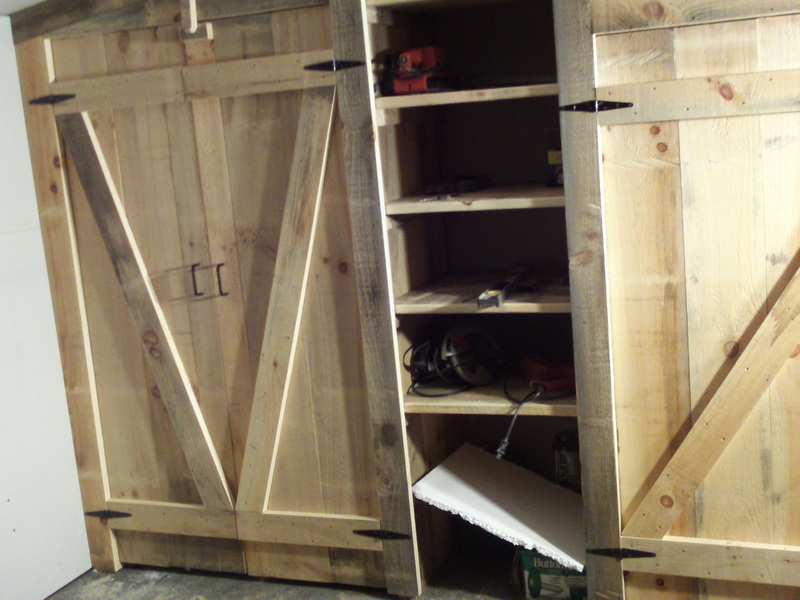 It was a bear getting it all moved to a secure place so it doesn't end up in some thiefs scrap pile. As much work as it was moving it, I am sure it is secure now anyway! Before dark tonight, I got 2 sheets put up over the back section. It goes up fairly quickly once you get the hang of it. Battery charge on the cordless drills is going to be the biggest hurtle to cross. Looks like the generator is going to be busy this weekend! Nathan (a friend) is coming up over Thanks Giving weekend to help put the metal on. 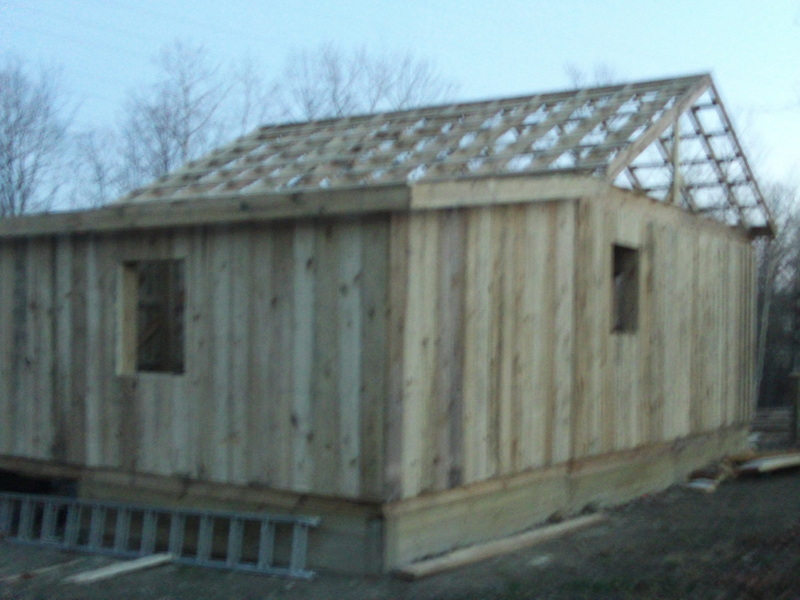 I hope to have the roof finished by late Saturday evening. I didn't work on the house this evening. You see, we had to do one of the hardest things anybody has to go through. 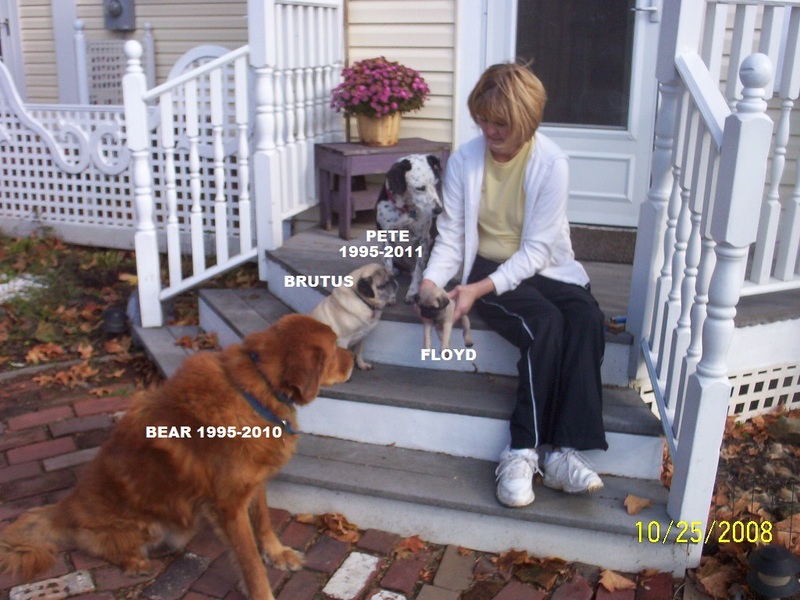 "Pete" our mixed breed mut we rescued from the humane society 16 years go, had to be put down. He had suffered what we believe was a stroke and had lost the use of his back legs. He was such a crazy dog. Part Dalmation, part Jack Russell, and who knows what else. He would jump strait up and down at the back door, to look out the window when he thought he knew you were home. 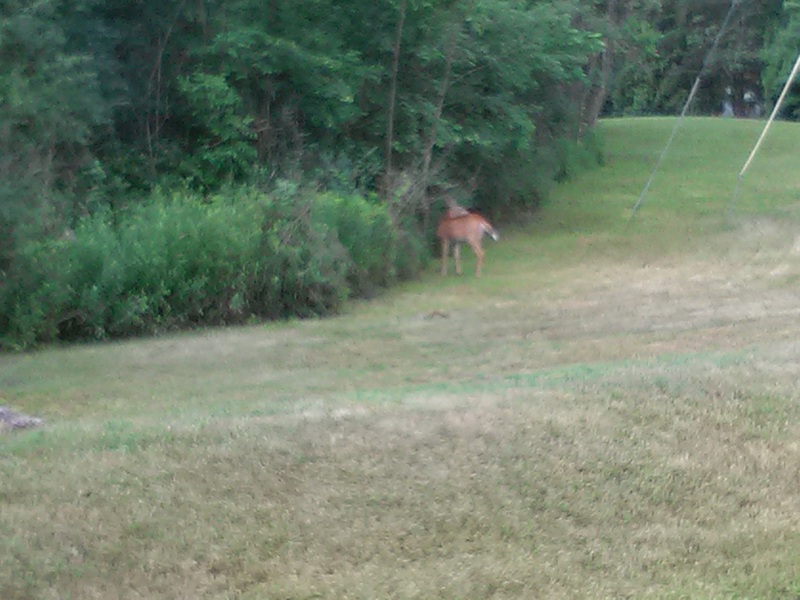 He would run around the yard at speeds reached only by a Nascar racer. We often said if he doesn't miss that tree, he is going to break his neck! He was about to be put down when I found him. I came in, looking for a puppy on his last day in the Humane Society. Nobody else was interested in that little bundle of energy that never shut up. He didn't have a prayer of getting addopted I thought. I just couldn't leave him behind. Thanks for the Memories Pete! PETTY- 1995-2011 See ya at the rainbow bridge buddy! I took a vacation day today. The day started out by burrying Pete near the cabin. That will close the chapter on that subject! Now for happy things. 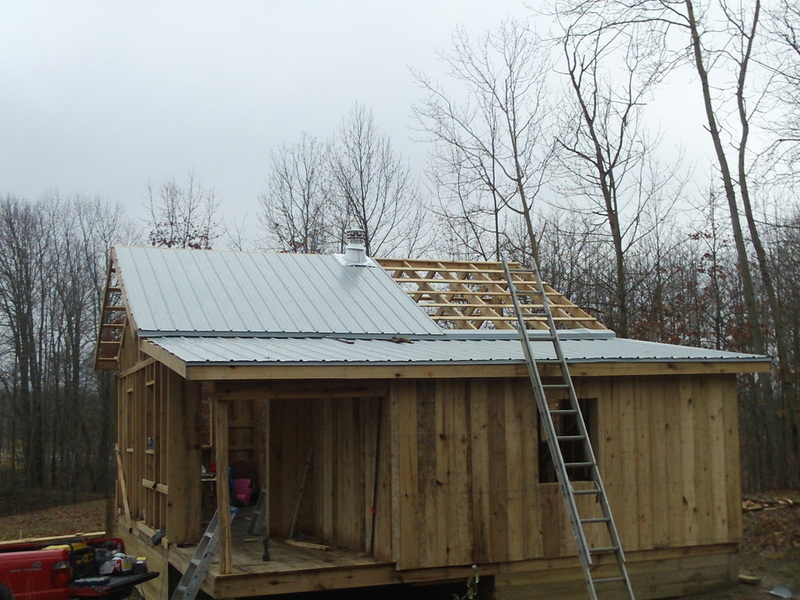 I was able to get all the metal on the roof on the back section. 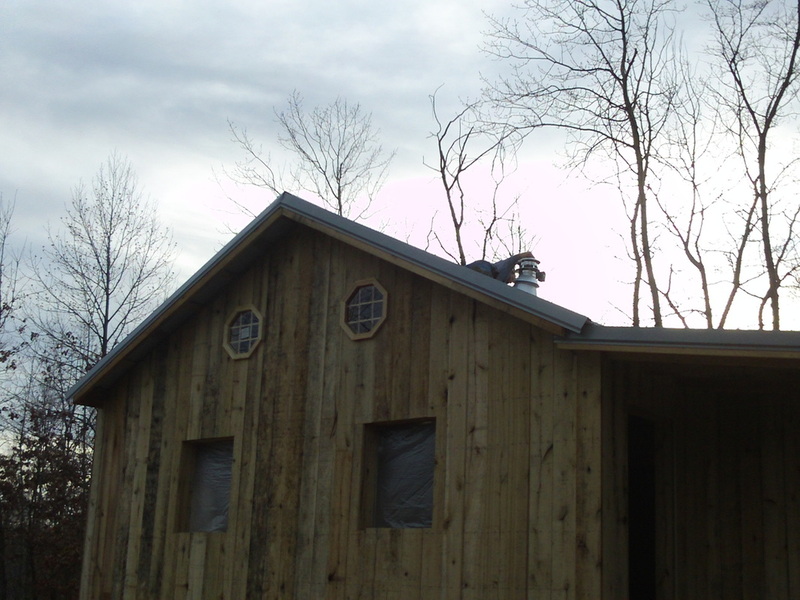 I also got the rake (gable trim) on the west side, and the transition trim on the top where the steeper roof begins. 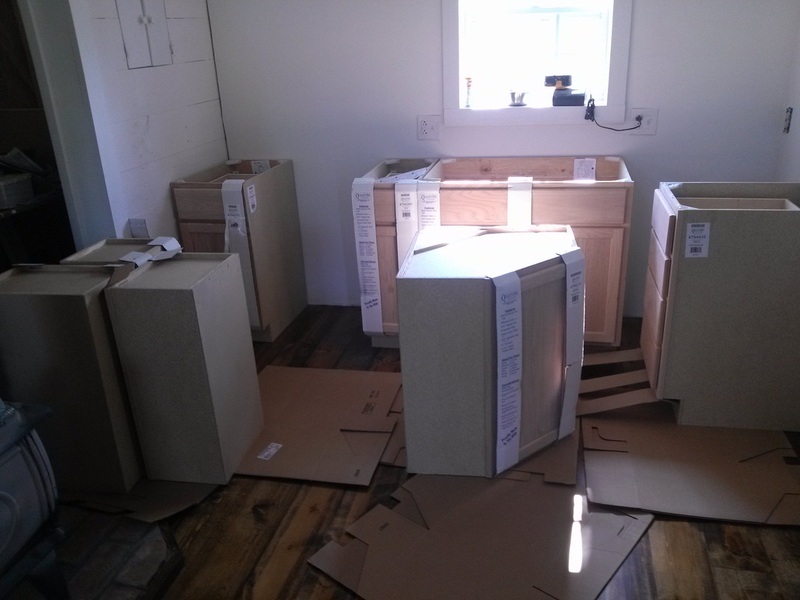 Due to so many commitments, the family has been drawn so many different directions, sending home the point we no longer have a need for a diningroom! Nathan celebrated Thanksgiving with his family last weekend, so he had no plans. 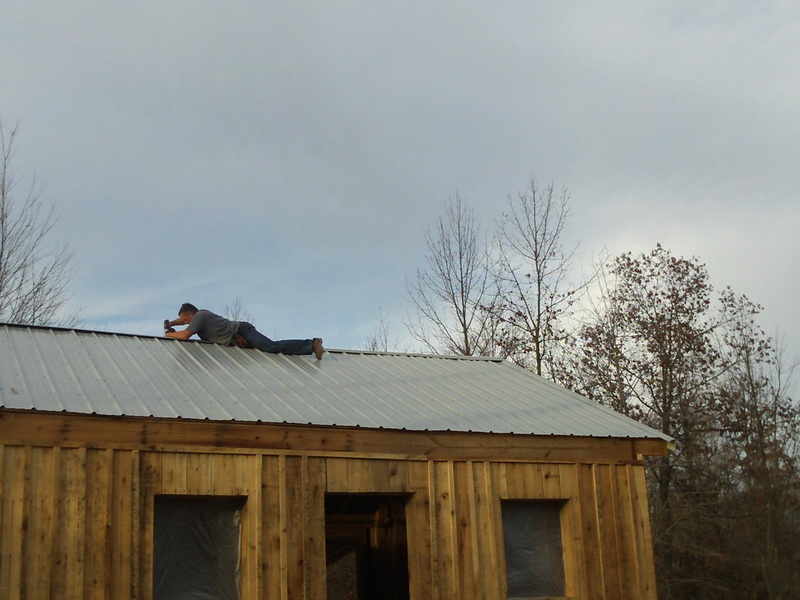 He is coming up this morning to give a hand with the roof. For that, I am extremely THANKFUL! 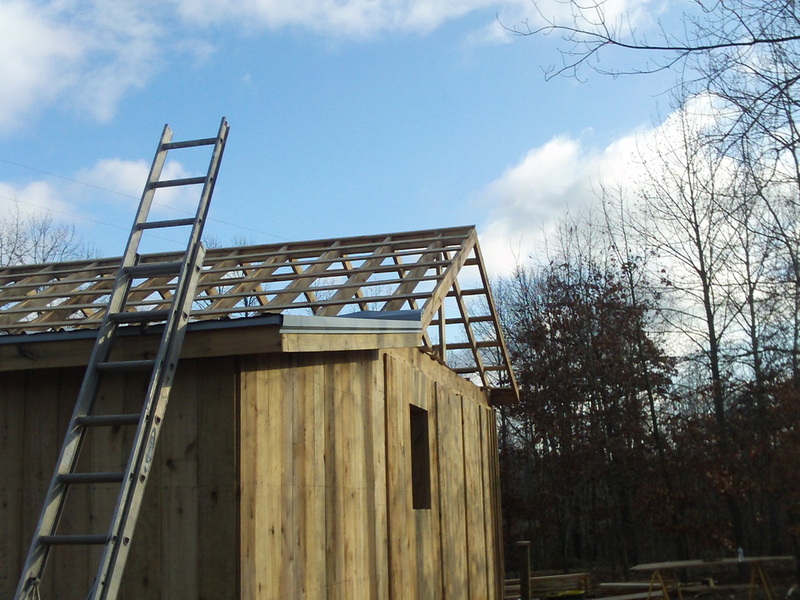 If all goes well, we will have the roof on before dark tonight. HAPPY THANKSGIVING EVERYBODY! Nathan came back today to help. 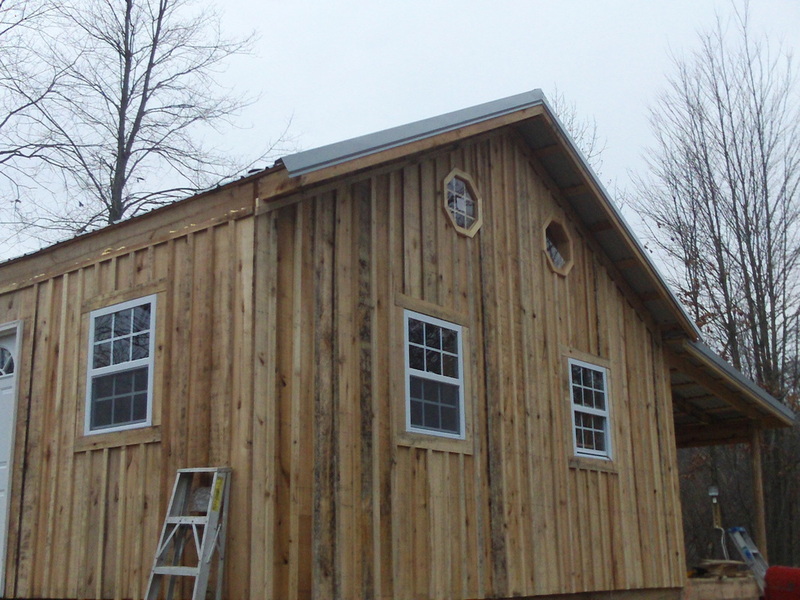 We met at the cabin at 8:am and decided to work on siding until the frost was off the roof. 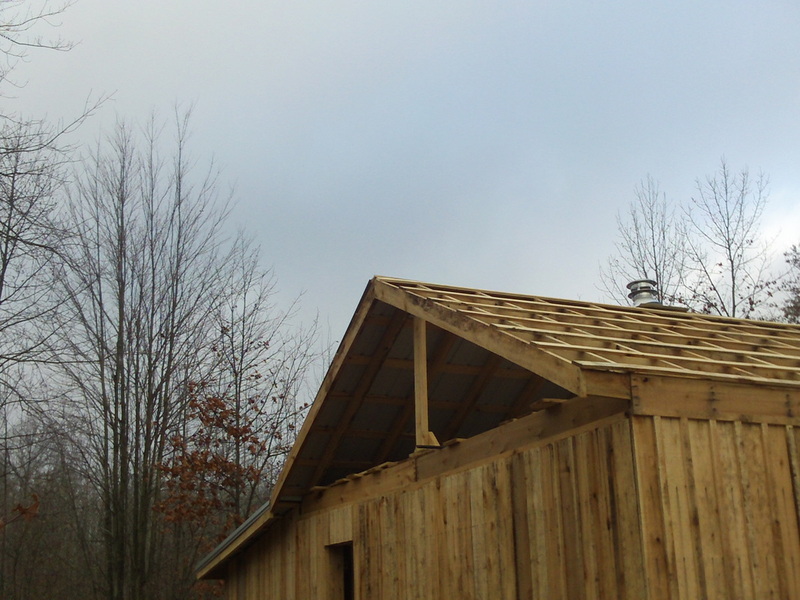 Somehow, we just never got around to finishing that roof. lol.....Tomorrow! She ran to Lowe's quick and found some "in stock". Long story short.....she was right, they are going to look totally awesome! Today was a land mark day for sure. 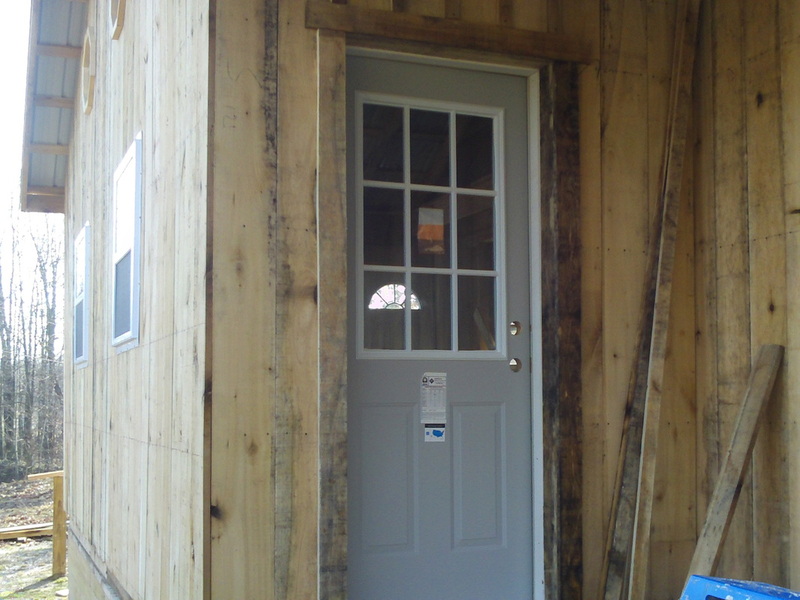 I got the back door installed. That is the final thing to do before I could consider it "dried in". Now, let Ol' Man Winter come. 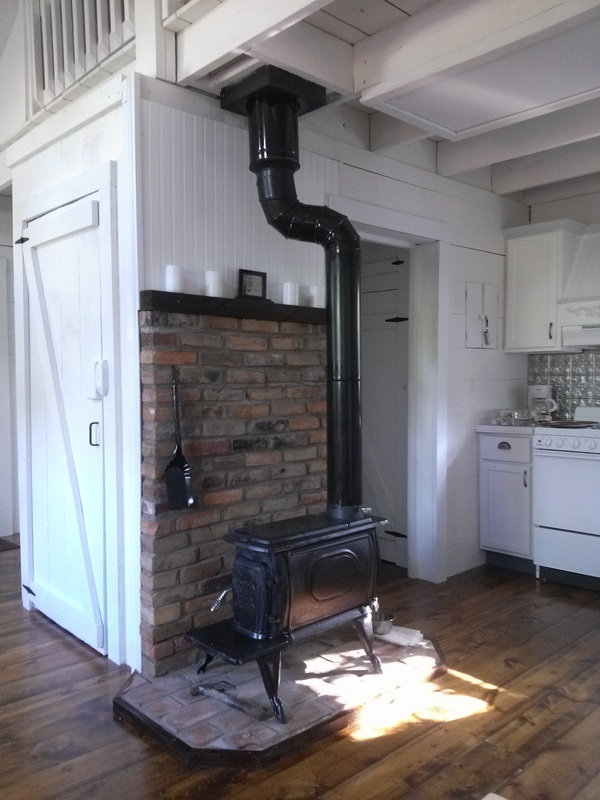 I will be getting the wood stove sometime next week and will even have heat inside. Woooo Hooooo! 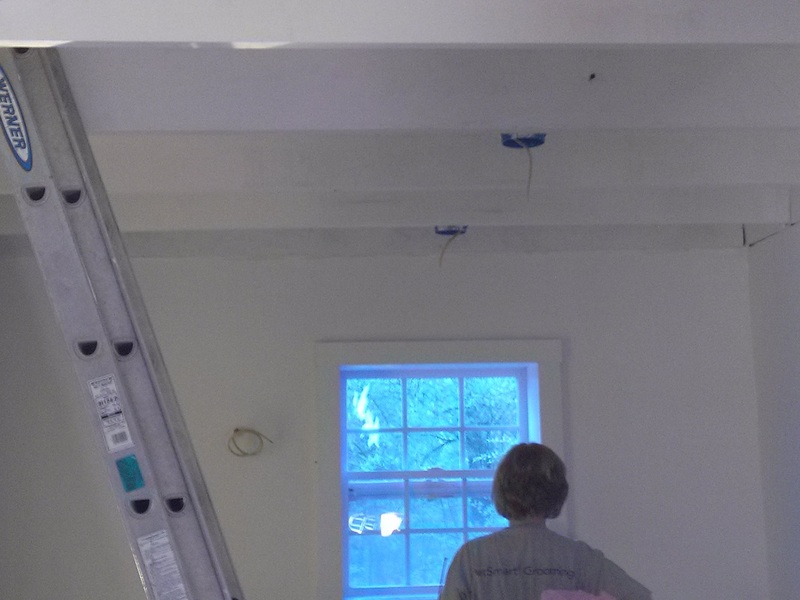 I worked on batton strips and window trim for a couple of days, but for the last 2 days it has been pouring rain! we have gotten over 3 inches of rain this week. 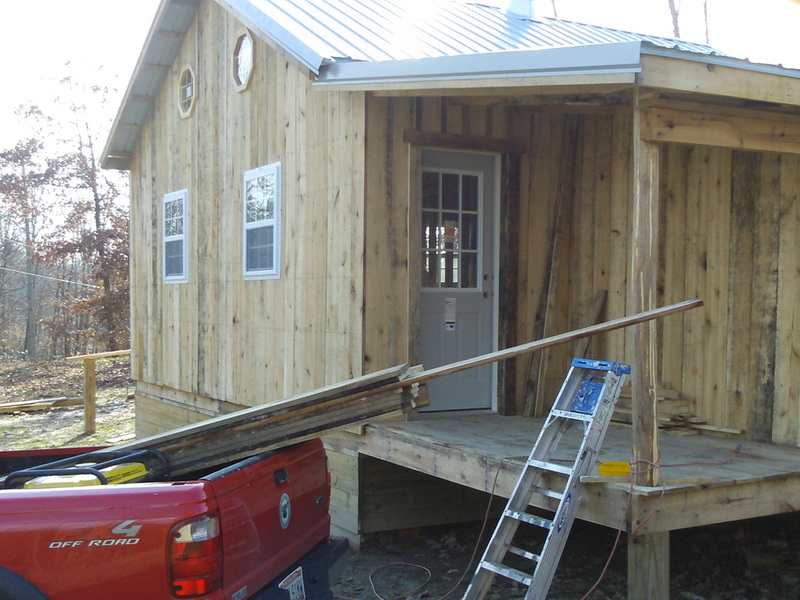 Today is Wednesday and I hope I will get the back of the bedroom and the porch battons on by the end of the week. 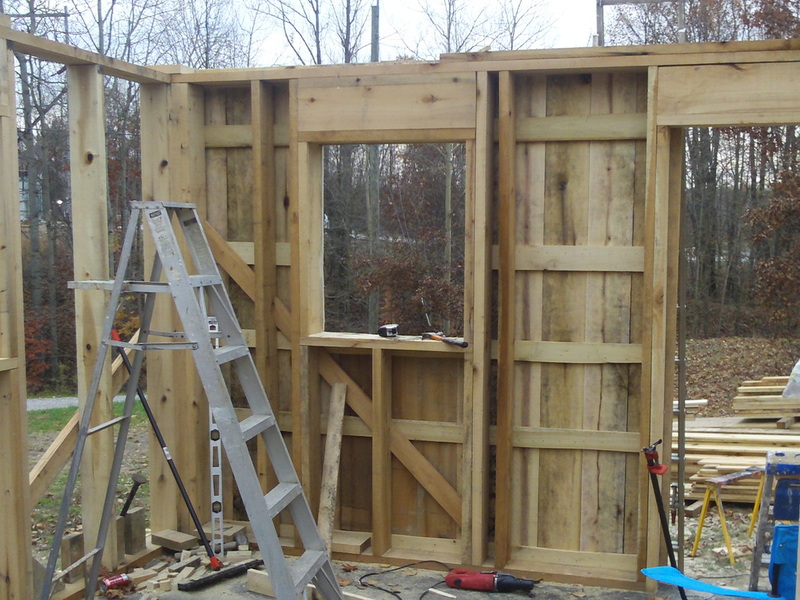 That will leave only the tall side in the above picture left to finish. 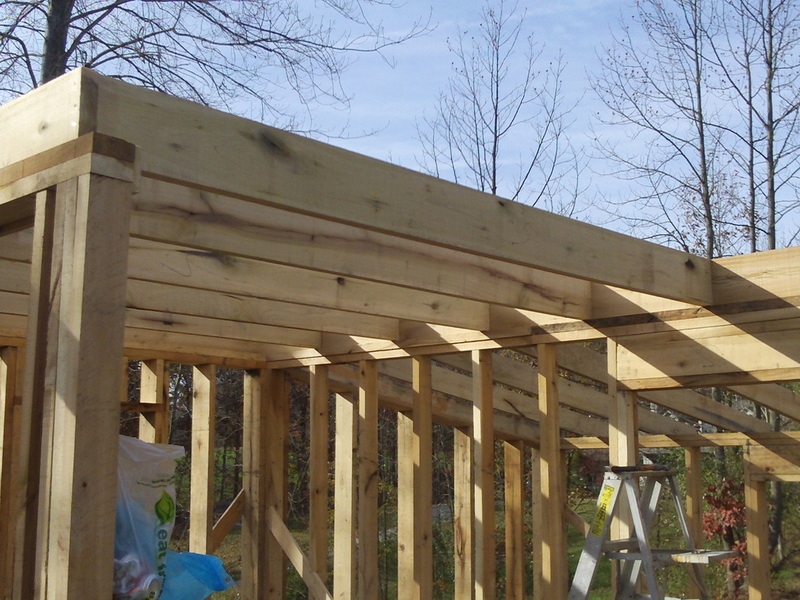 Nathan might come this weekend to help rip the longest strips on the table saw and help get them put up. 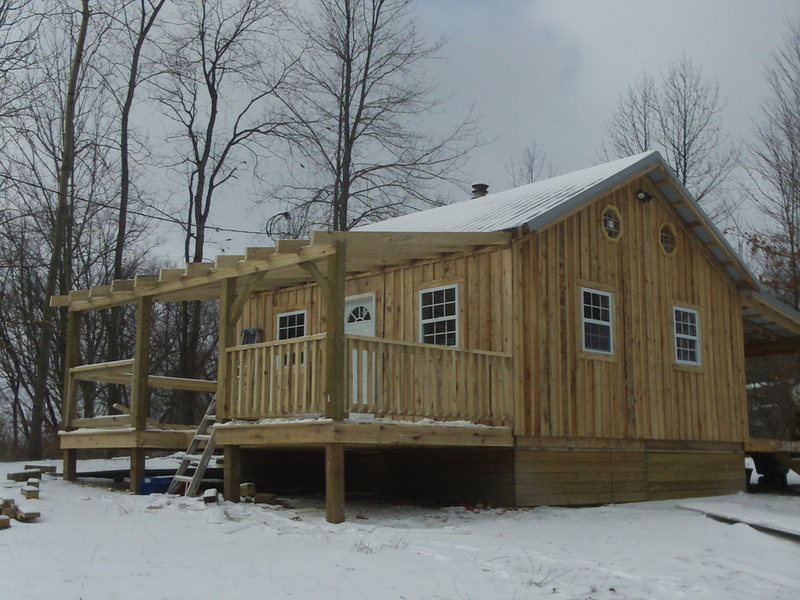 I also plan to stop and buy the woodstove this week and have some heat to stand next to inside for warmth. Then I can get the inside insulatated next! Well,the weatherman was wrong again! It still hasn't stopped raining. But the good news / bad news is it will stop raining soon, because the temp is dropping. It is about 32 this evening and probably going to turn to freezing rain or snow soon. 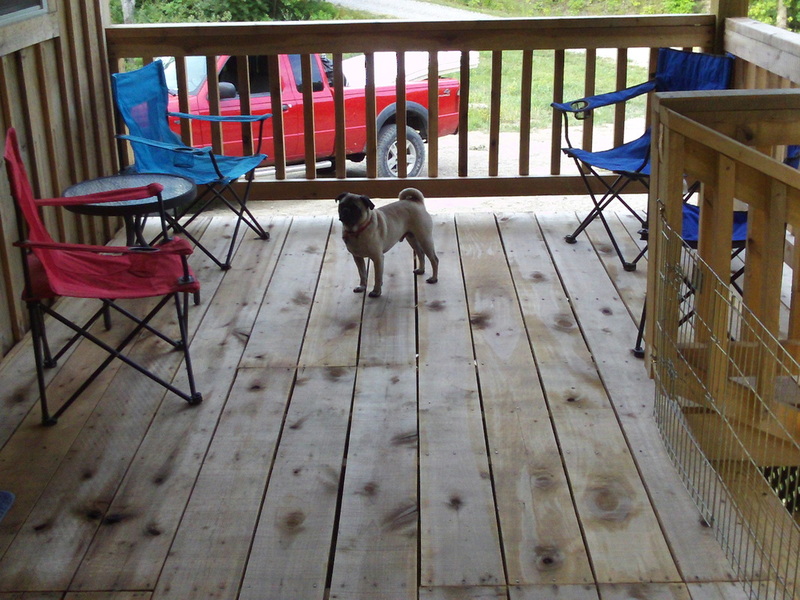 I went out tonight anyway and go all of the batton strips on the porch finished. Hopfully, it will be nicer tomorrow! 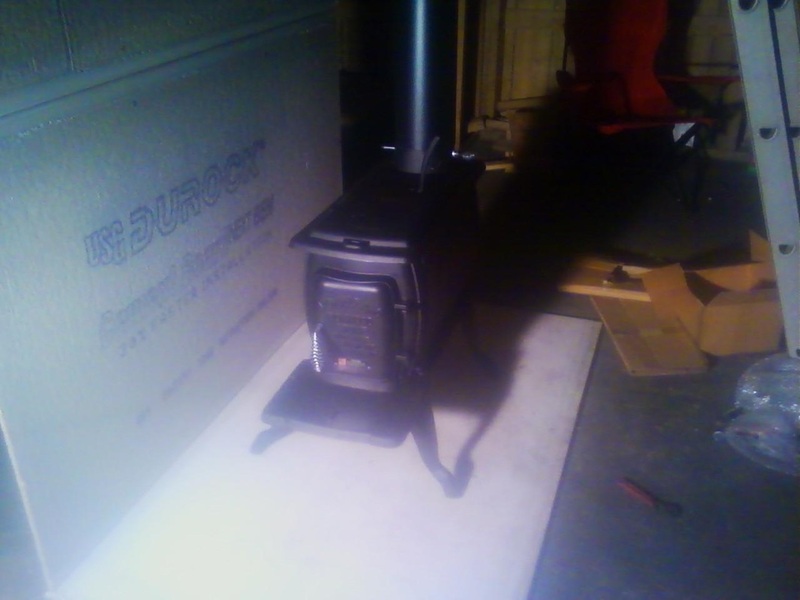 Last night after work, I stopped and bought the wood stove, pipe, some cement board, etc. 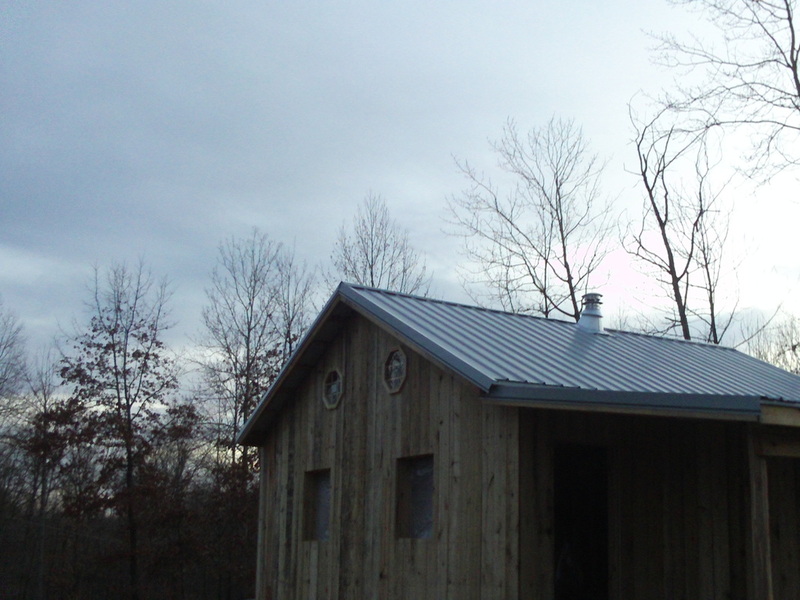 It took until fairly late evening to get it all put together and the chimney pipe assembled to the insulated pipe. By then, it was too late to start a fire. I had forgotten my camera anyway, and want a pic of the first fire. I took a pic of it with my "stupid" phone which doesn't have internet, and texted it to a friend. She then emailed it back to me this morning, so at least I have that pic to post. Not sure how the quality will be. It seems like I have been working on the batton strips for ever! Before I can put them on, I have to rip the 1X8's into 1X2's. That takes a lot of time too. 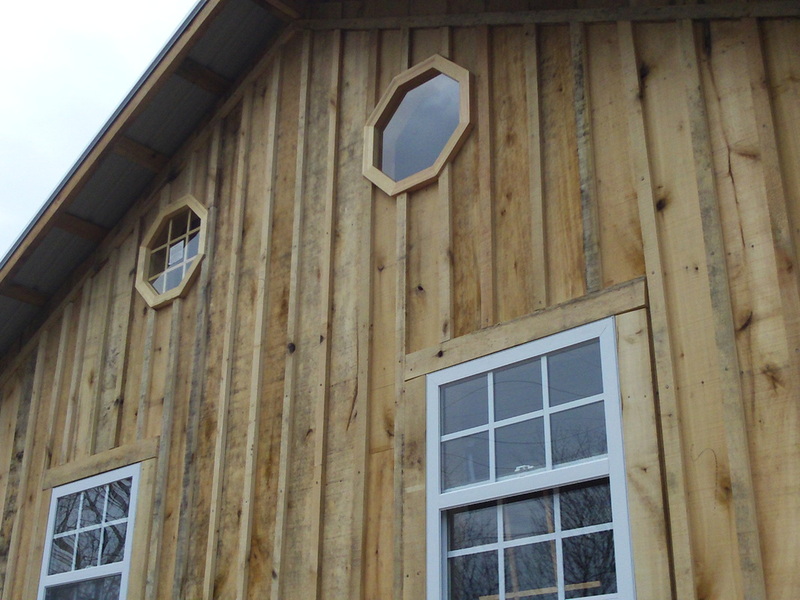 I have finely finished the one gable end, and have a little over half the other gable end done. There are about 16 more batton strips to put on, and I am finely finished! 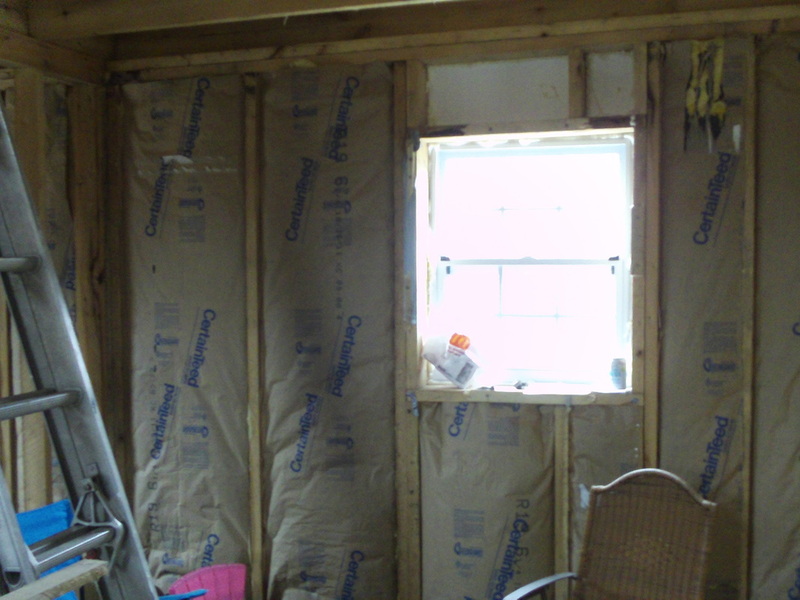 Then I can start insulating the inside. Today was an exciting day! 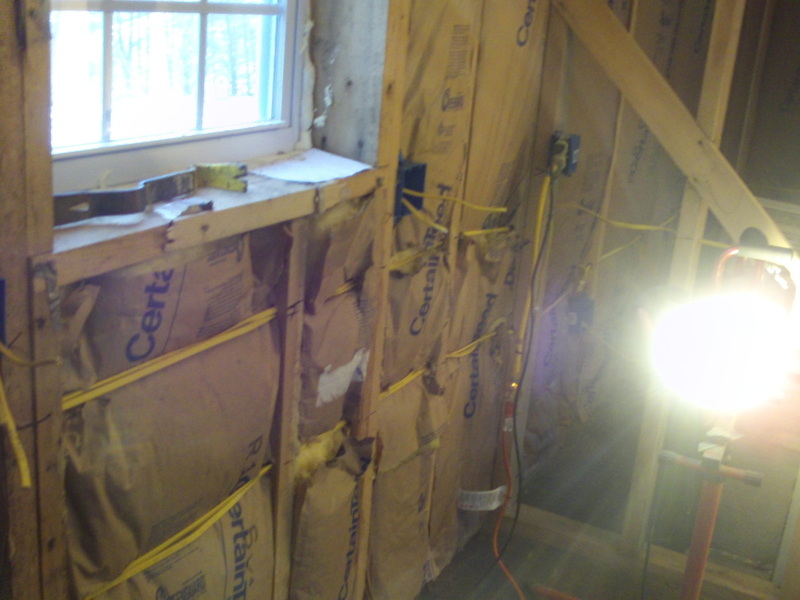 I started insulating. 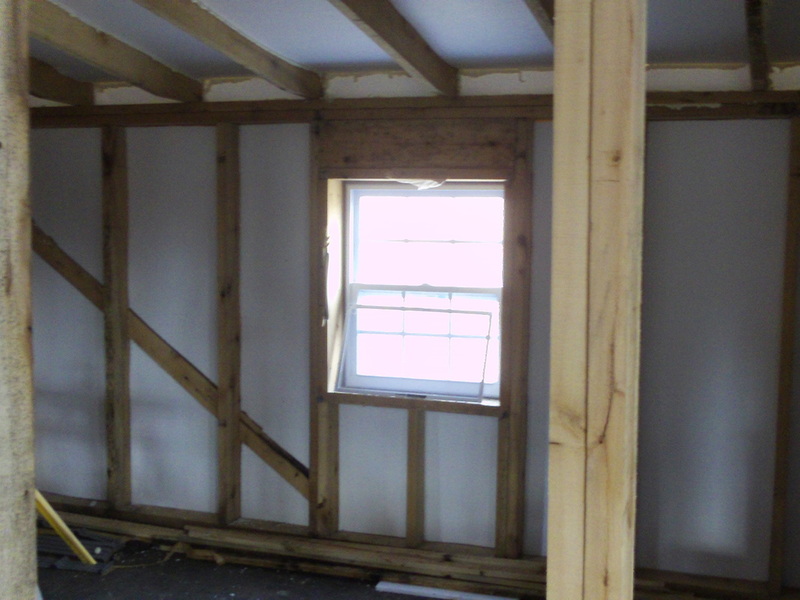 It was amaizing how much difference each little bit of insulation made as the day progressed. 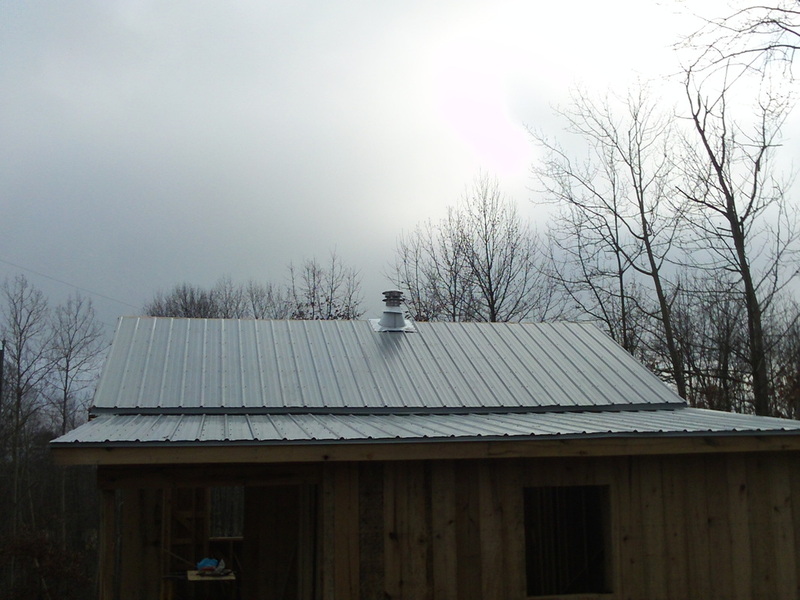 I could feel more and more of the heat from the wood stove staying inside. 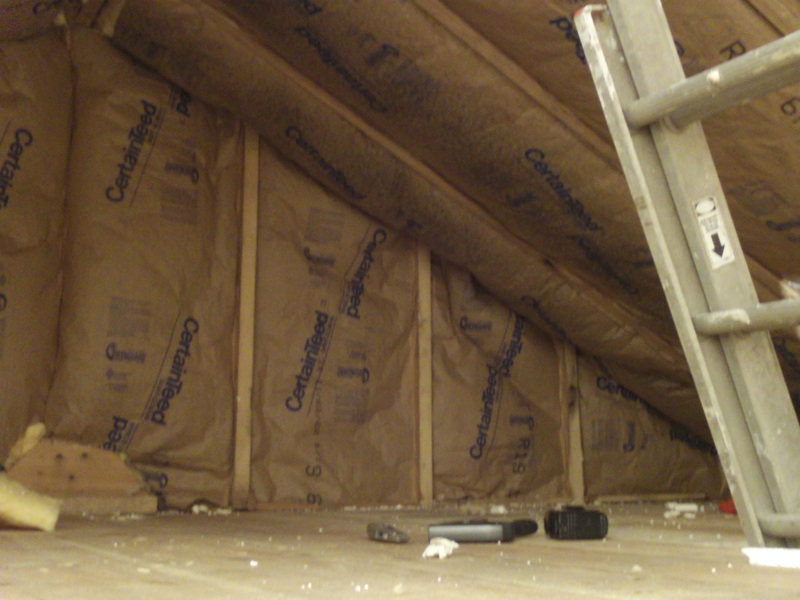 By late evening, it was actually hot working up in the loft. 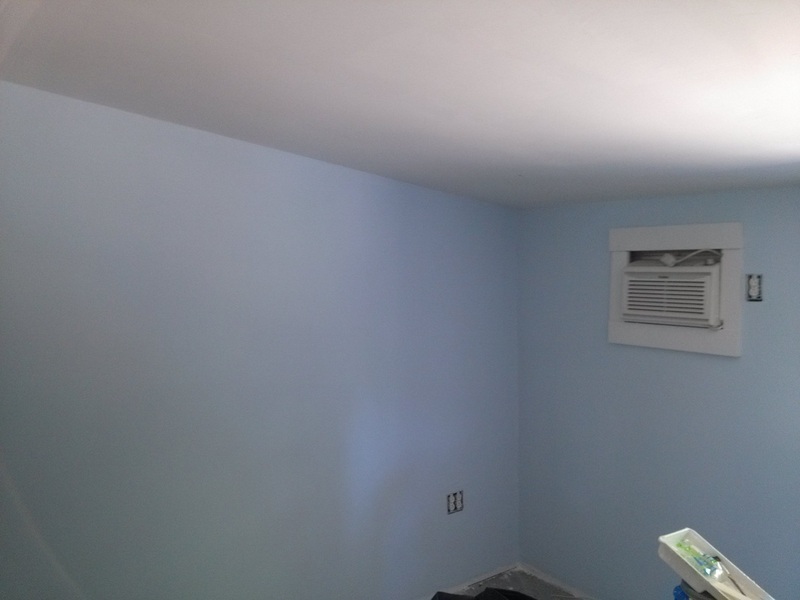 There is a huge amount of both wall space and ceiling that isn't yet even started, but it still made a big difference. 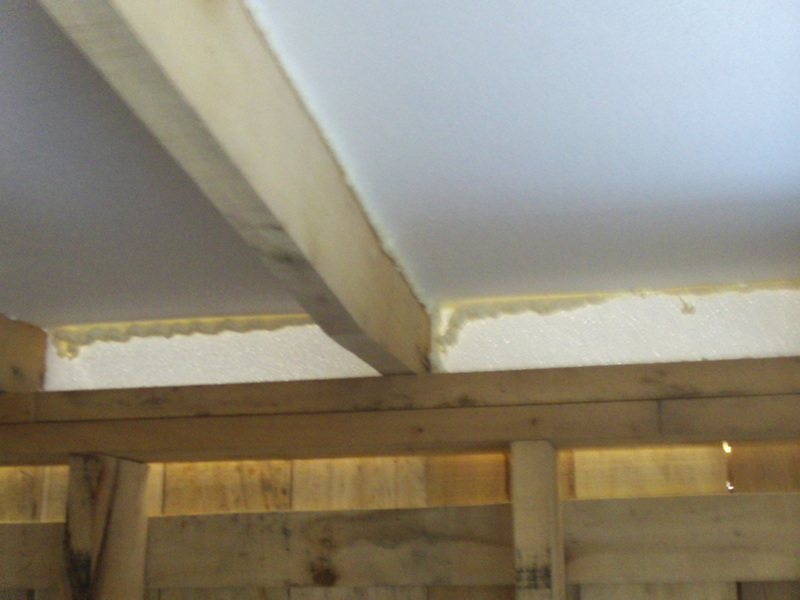 I began by setting 3/4" styrofoam between the studs and rafters. 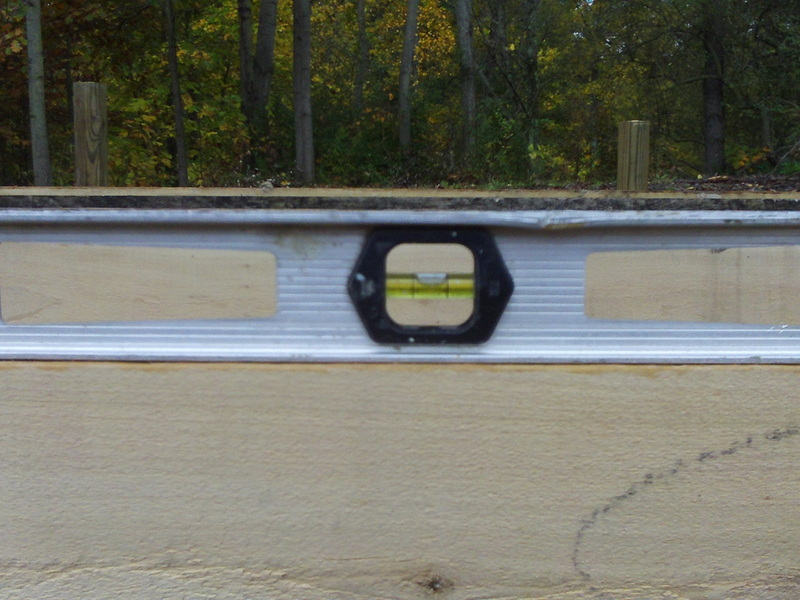 Around the edge, I put a bead of "Great Stuff" spray foam to stop air infiltration, unwanted crawling guests, and also act as a moisture burrier. 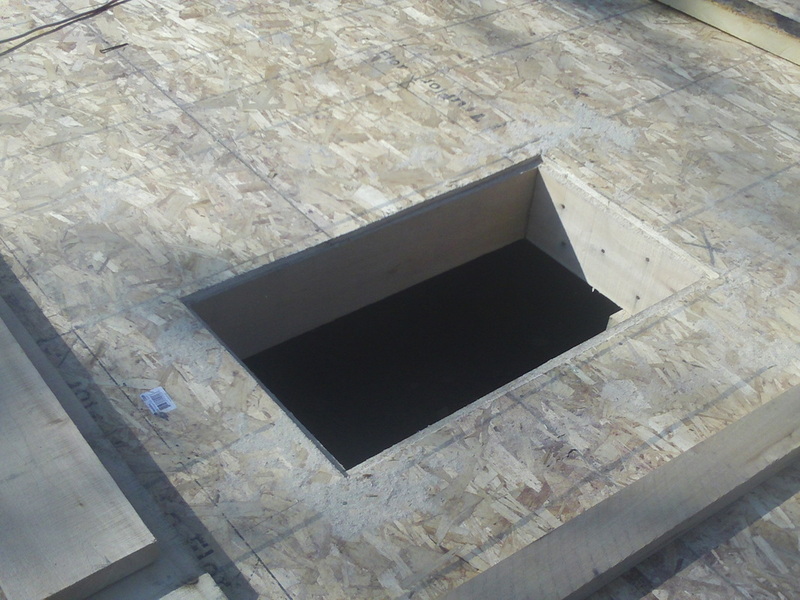 Over the styrofoam, I am puting 6" of formaldahide free fiberglass insulation with a craft face for another moisture burrier. 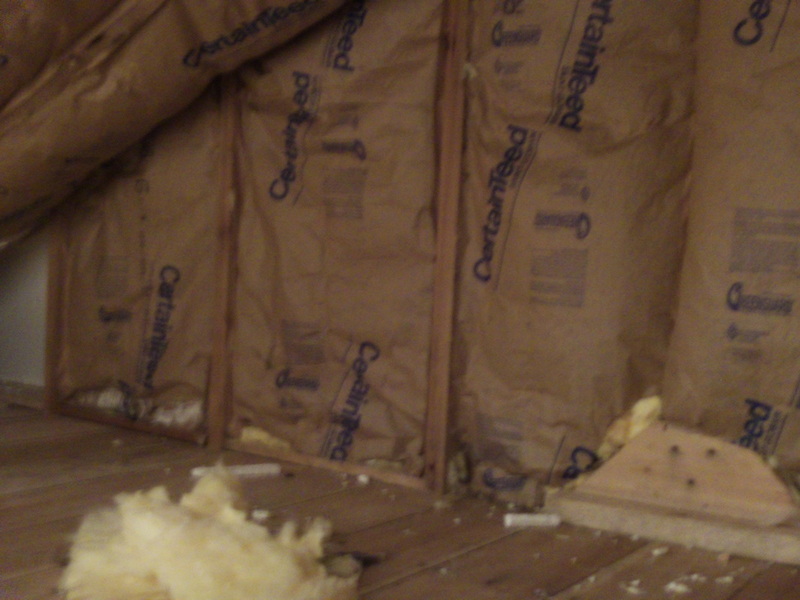 The total insulation value will be about an R-24. 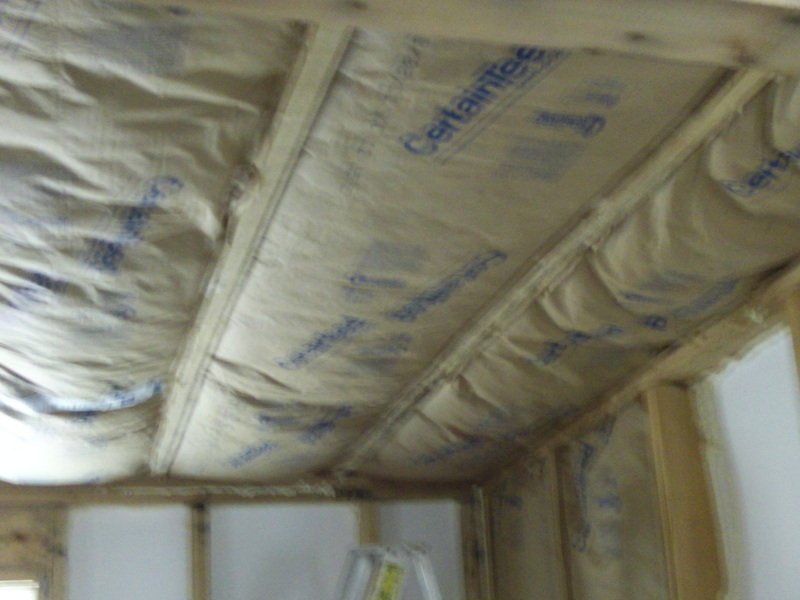 I haven't taken any recent pictures, but have continued working on insulation. I have to work with the generator running constantly now to have enough light after work to get anything done. Today is the winter solstice! Shortest day of the year. Thank goodness the days will begin getting longer now. It has been cloudy and raining not stop for over a week. 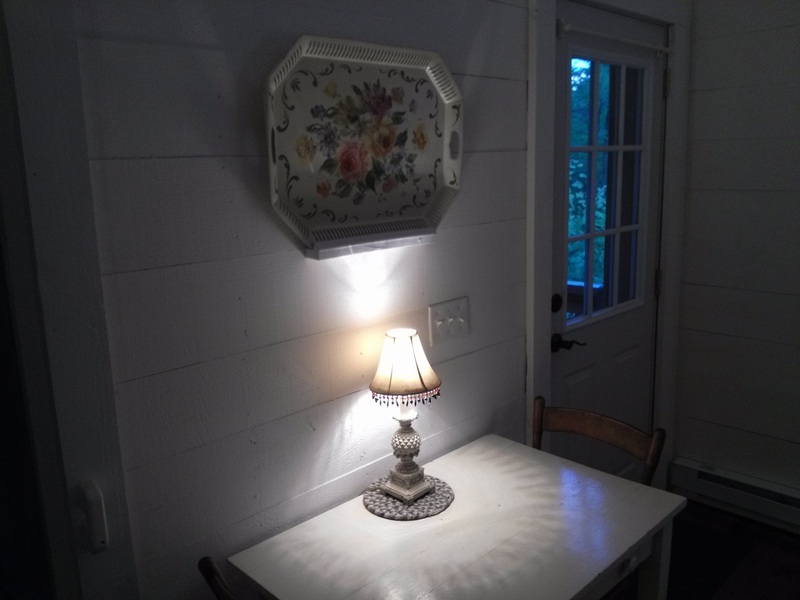 By 4:45 pm, it is dark inside the cottage. I am so sick and tired of rain! The area around the cottage is such a mud hole I can hardly get in even with my 4 wheel drive Ranger. 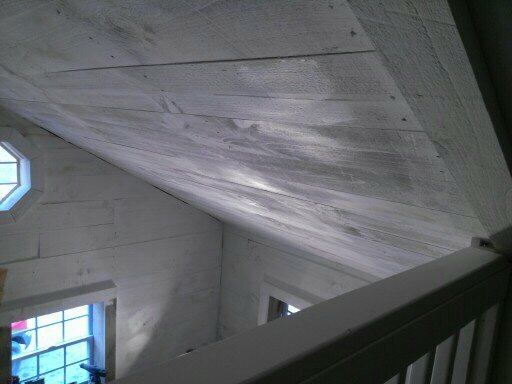 I have all the styrofoam up on the celing now, and about half the fiberglass on the ceiling. 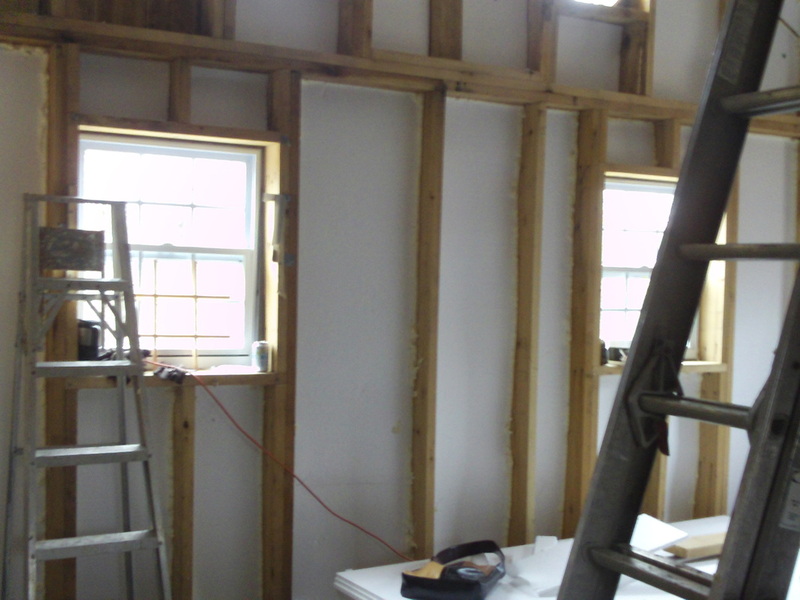 I am off all next week and hope to work almost every day on the insulation until it is finished. 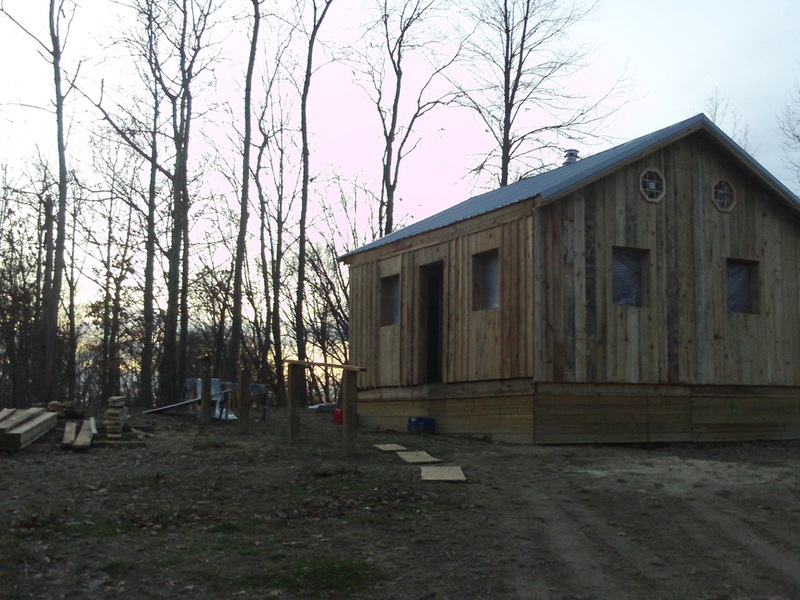 I am anxious to see how easy it will be to heat when fully insulated. Wow, I didn't realize it has been this long since an update. I hope everybody had a very merry Christmas. It was a little busy around here. 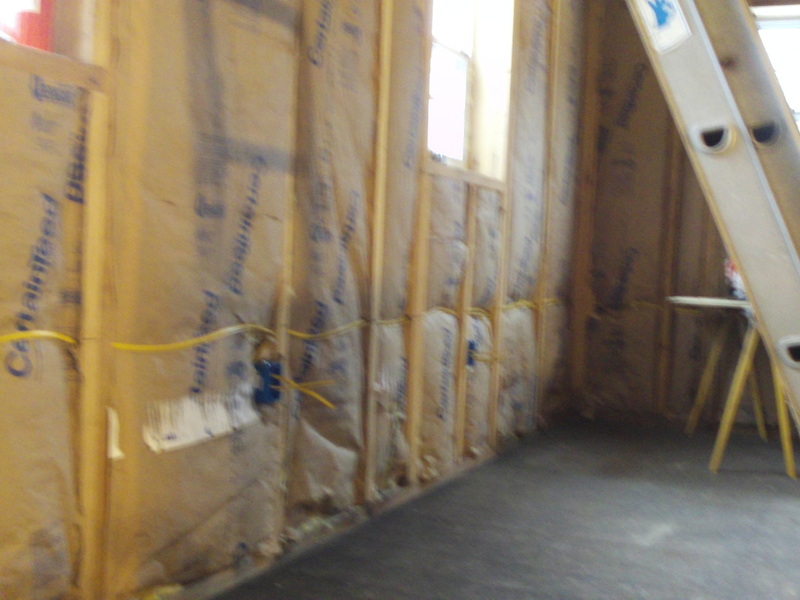 I have been working on more insulation. 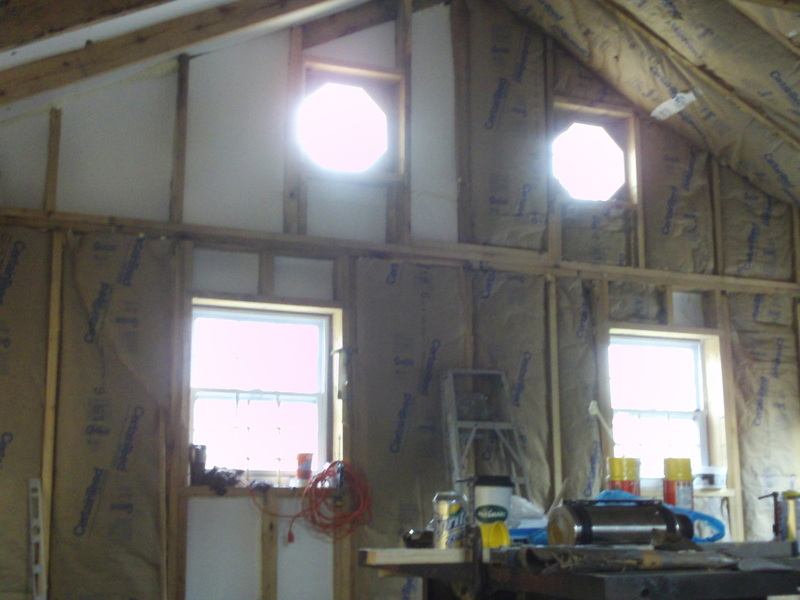 Tonight, I finished the last of the ceiling and the tall gable wall where the vaulted ceiling is, in the livingroom. I have some pics I haven't posted from Christmas Eve, but haven't taken any since then. I will get more tomorrow. 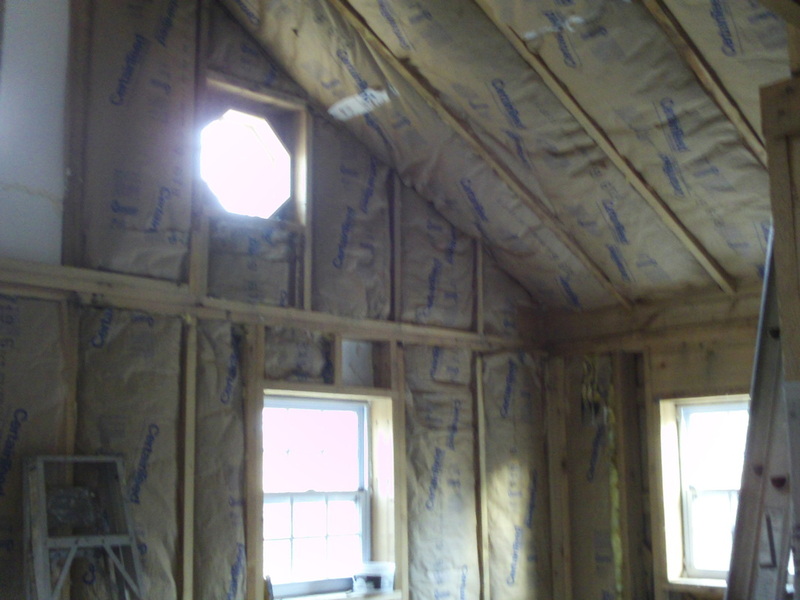 THE INSULATION IS FINELY DONE!!!!! It so nice and cozy in there. 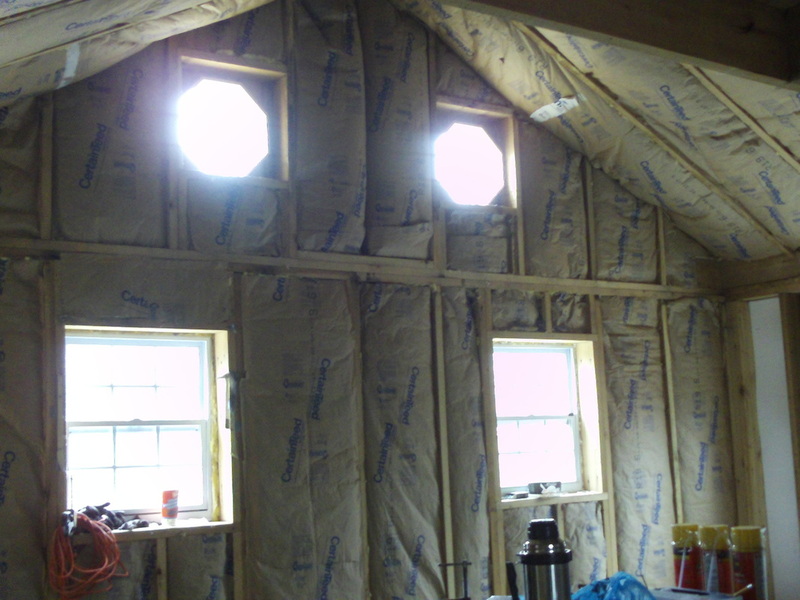 It was 26 degrees today all day while I was finishing the last of the insulation. 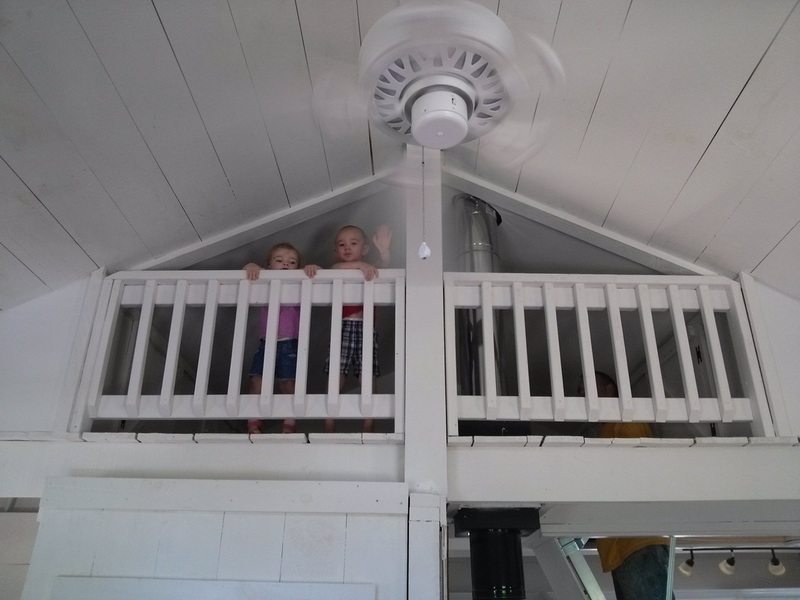 It was about 70 in the cottage! Wow, what a difference. 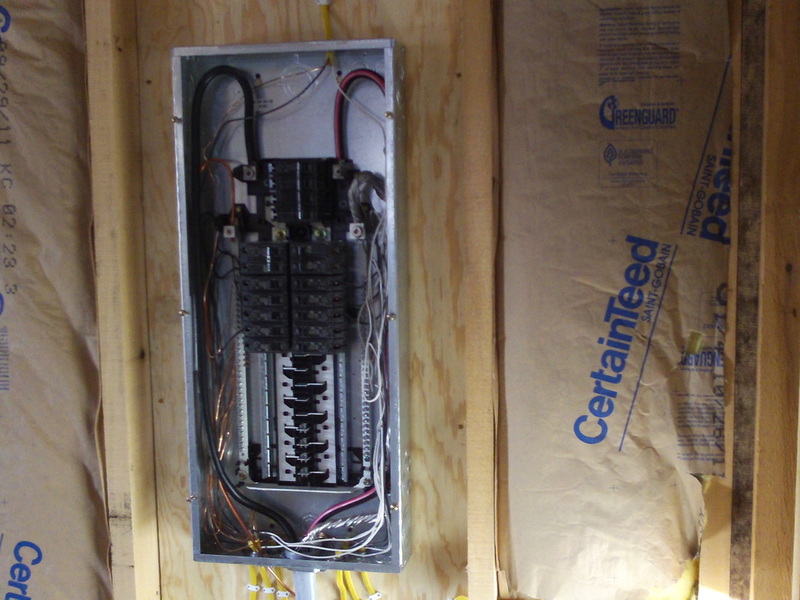 I started working on the wiring today. 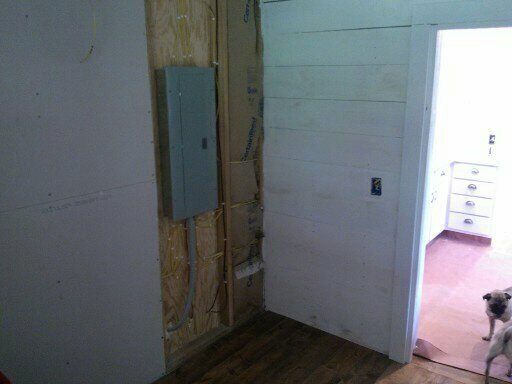 I got the breaker box mounted, and receptical circuits run to the kitchen and bedroom. (4 cirucuits total) including a dedicated circuit for the microwave. I will try to get some pictures tomorrow. Well, this will be the last day I work in the cottage this year! 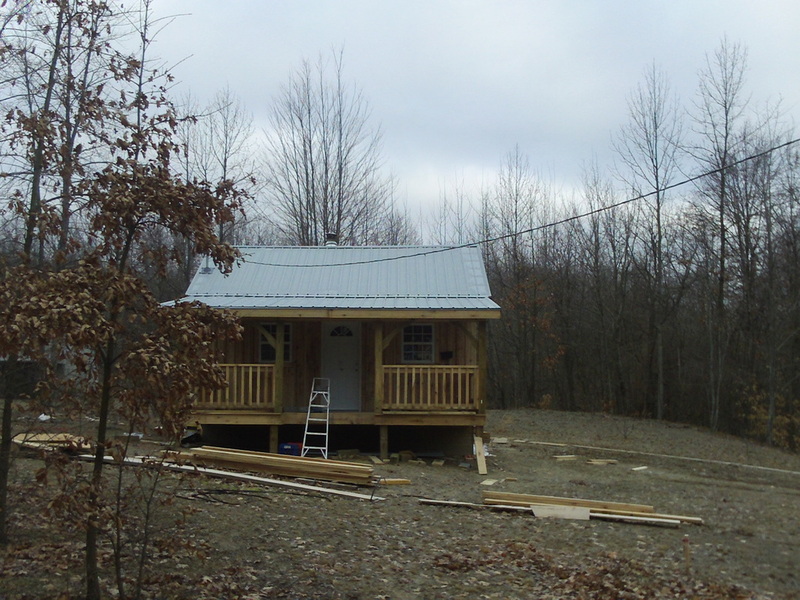 lol I am headed out there this morning to work on more wiring. I HOPE EVERYBODY HAS A VERY HAPPY NEW YEAR! BUT PLEASE......DO NOT DRINK AND DRIVE! HAVE FUN, AND SPEND THE NIGHT! Things are still progressing, but slowly. The biggest problem is working in the cold. In the evening after work, it is hardly worth trying to start a fire. 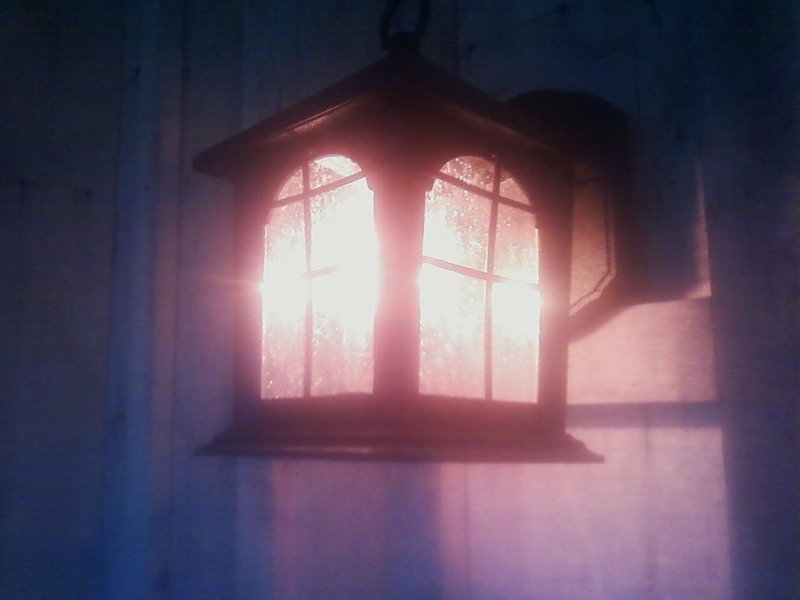 By the time the cottage gets warm, it is time to quit for the night. I get up for work at 4:30 in the morning, so work until 10 or 11 at night is out of the question. 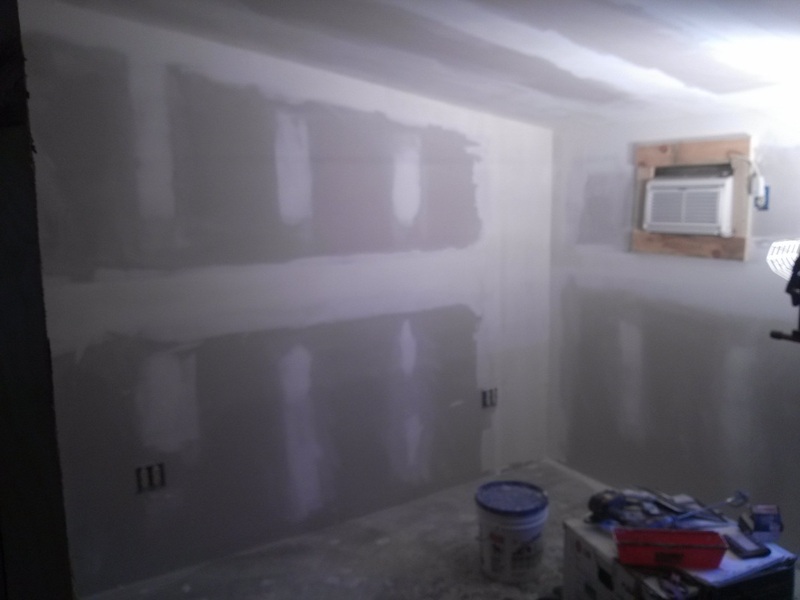 Soon, I will be starting to hang drywall. 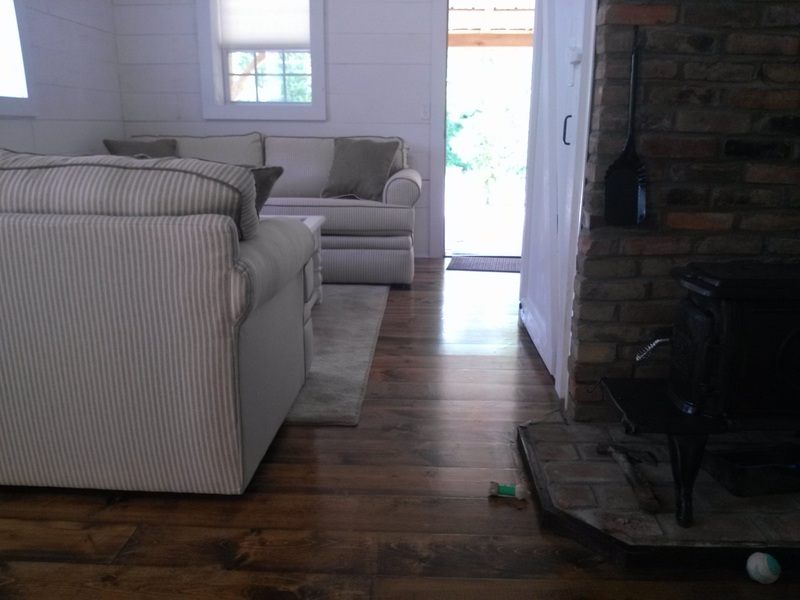 Then I will be able to put the baseboard heaters in and that will really help the situation! 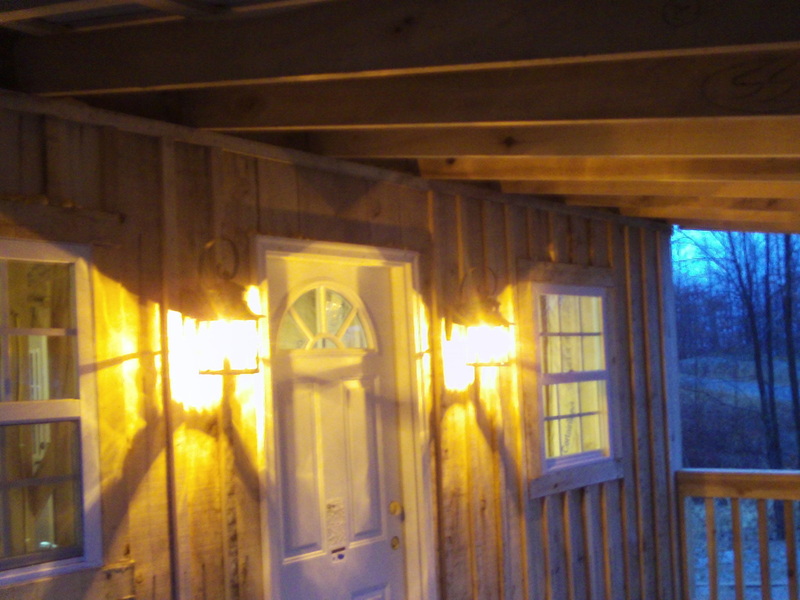 Last night I installed the back porch light and started to put the gable spot lights up. I took a vacation day Monday and made it a long weekend from the 10th to the 12th. 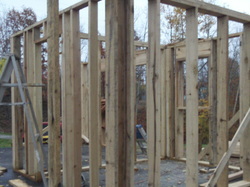 The wood arrived Friday and I started the inside walls. I was lucky enough to find 1300 bd. 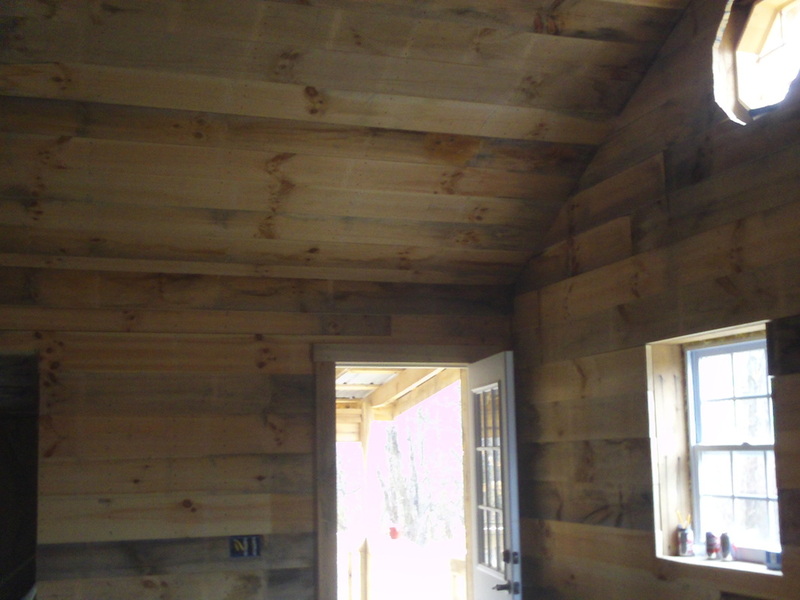 ft. of 1X8 pine that was stacked inside a building an an Amish sawmill for the last 5 years. It is totally dry and will not be a problem at all with shrinking. 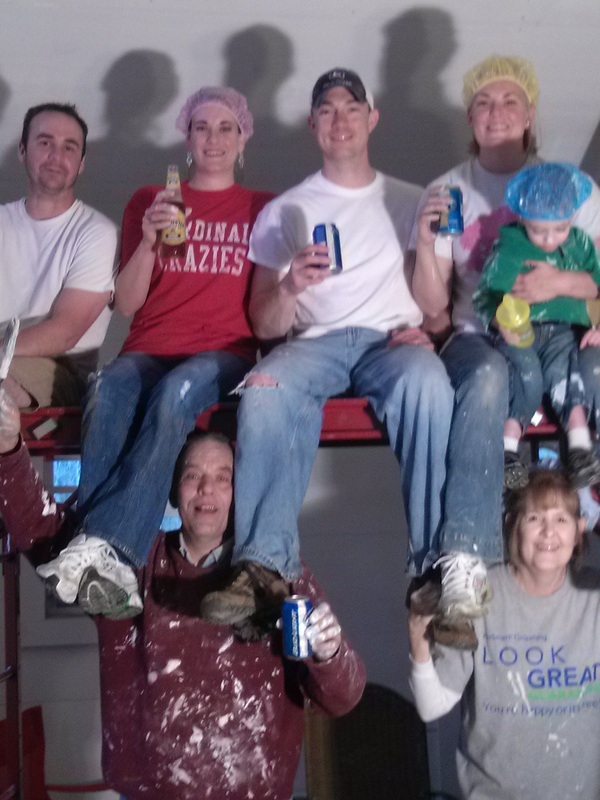 A friend (Nathan) came over Friday after work and again Saturday and we sure got a lot done. Monday, I worked alone, but still got even more done. I am far further than I thought I would be by now, always a good thing! 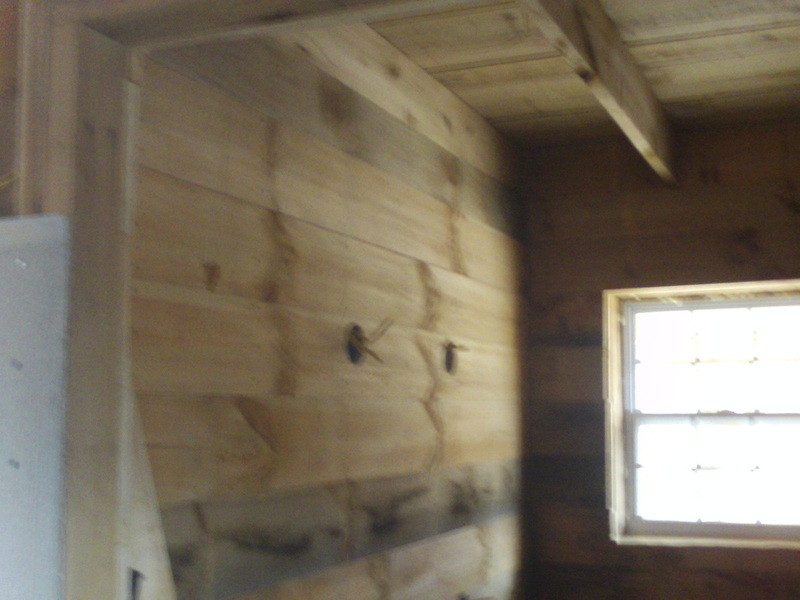 Here are some pics of the inside as it is now. 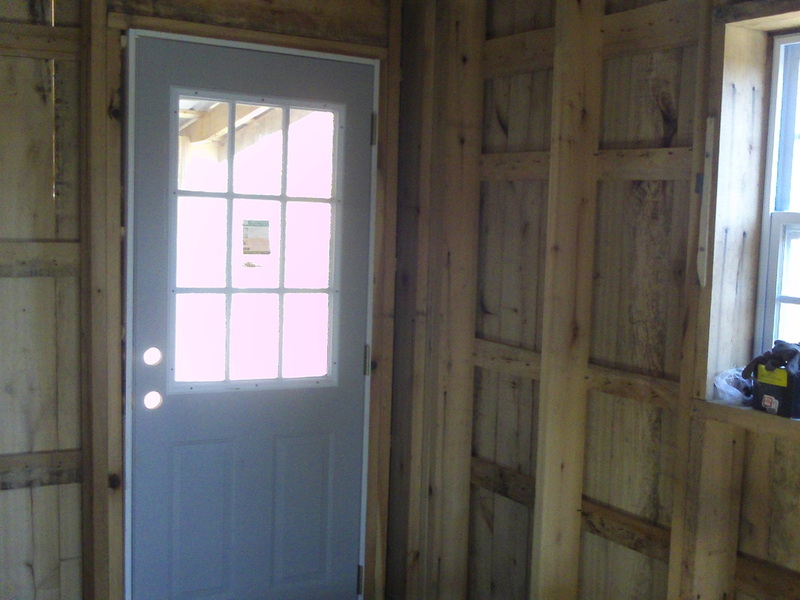 I have been working on the inside building closets, closet doors, triming windows, building shelves, etc. 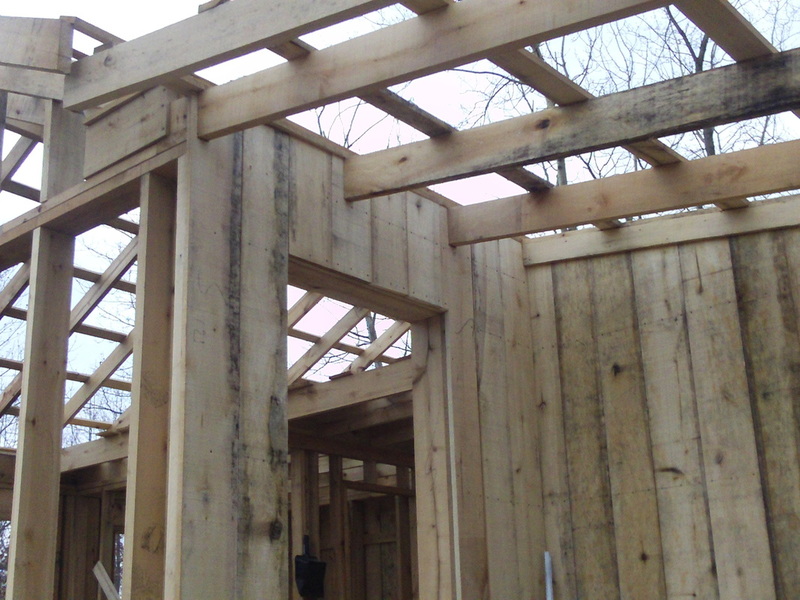 It is extremely time consuming, and takes way more lumber than you would think. 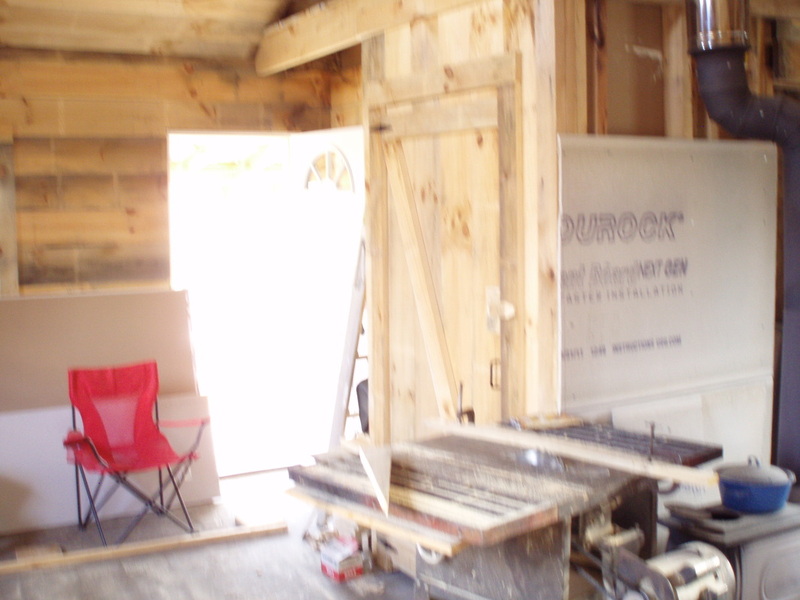 I bought 200 board feet more lumber than I though I would need, and I am still going to run a little short I fear. 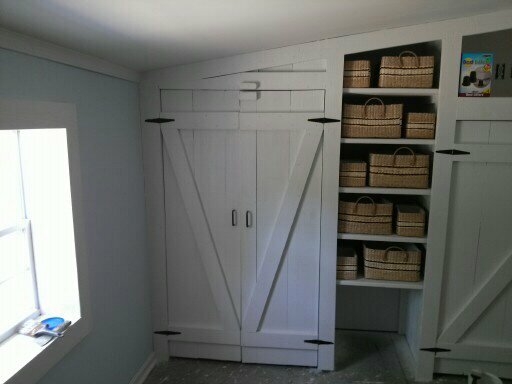 Here are some pics of the closets and trim. 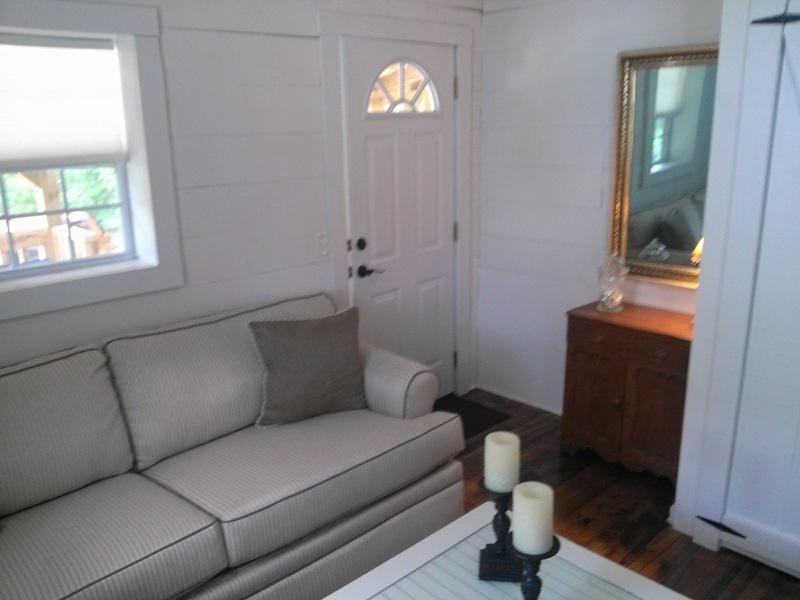 I have still been working on the wall finish, window and door trim, and closet doors, shelves, and all the inside "trimmings". It is extremely time consuming. 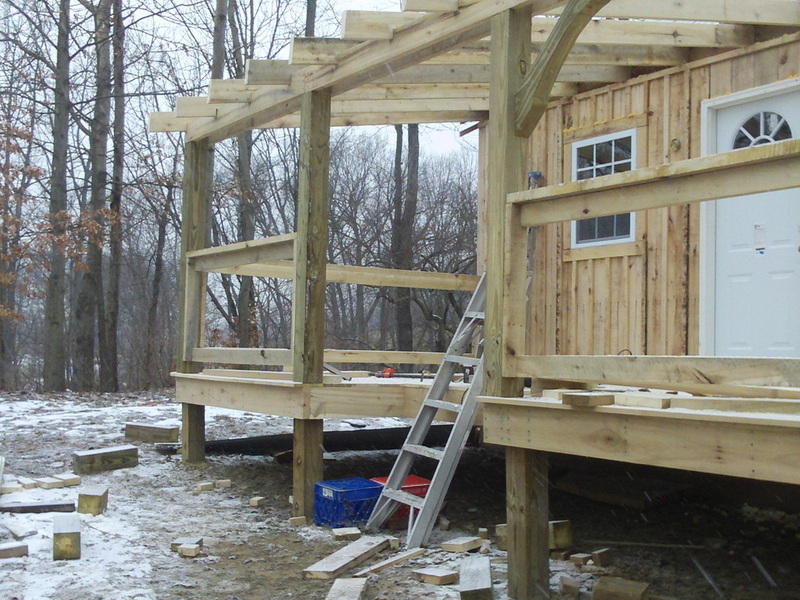 Nothing goes very fast, but it is very rewarding seeing it all come together. 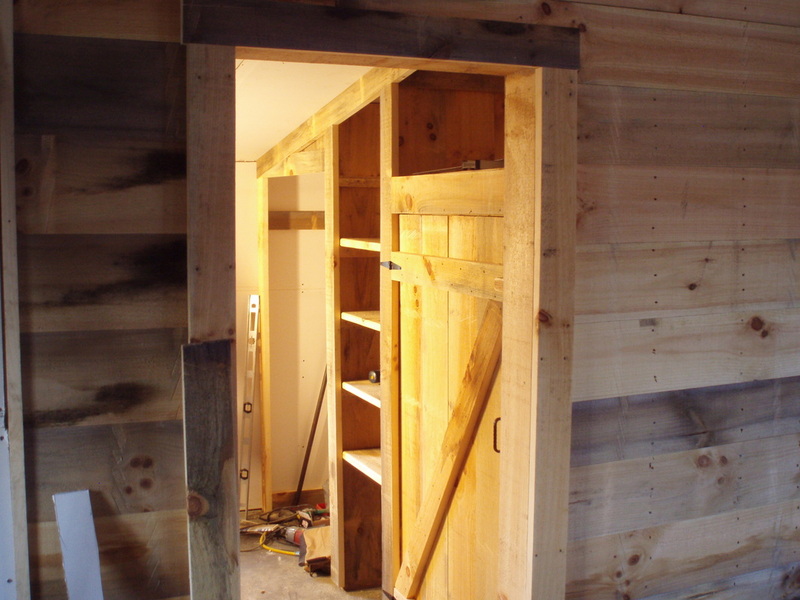 There are shelves, doors, and even hidden compartments for those what-knots. 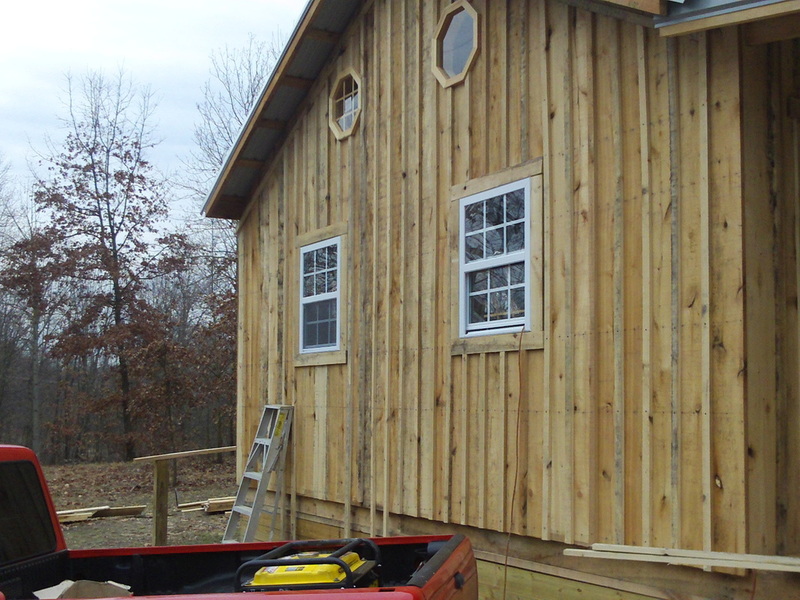 Here are some pics of some of what I have been doing. It looks absolutely fantastic. It was such a huge help having everybody pitch in. 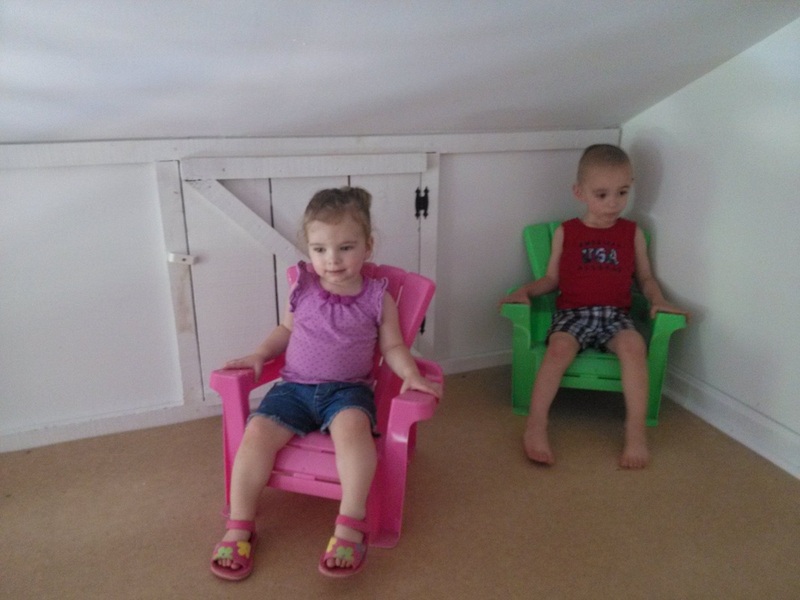 Even the Grand kids had a blast. 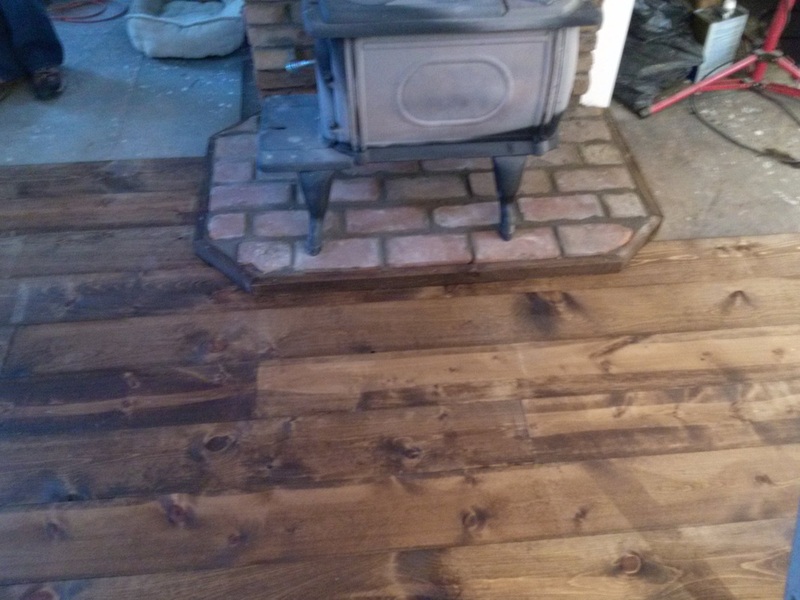 This weekend, we worked on flooring and the wood stove harth. We were going to cover the harth in stone, of which there is plenty on the property, free. Then, I came across a source of free brick from a historic building the the area that burnt down. 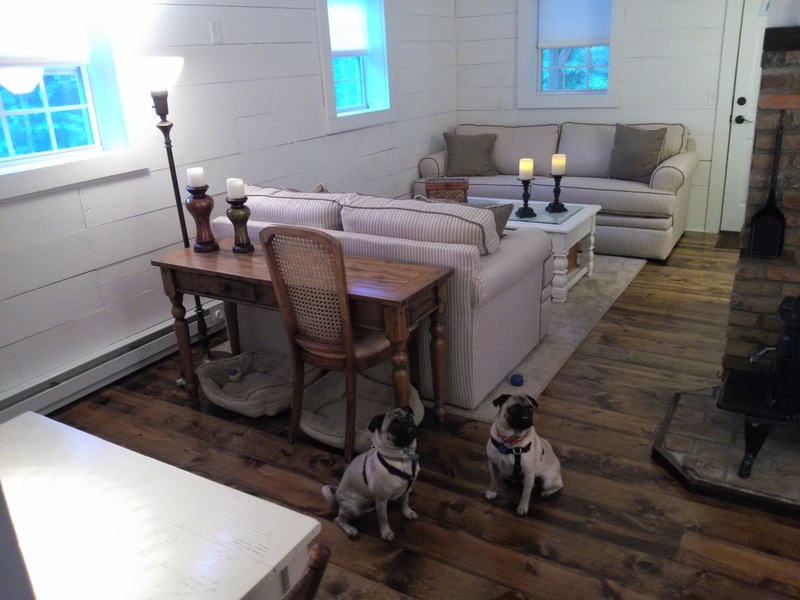 We decided the brick would be a little more "cottagie" so we went with the brick. 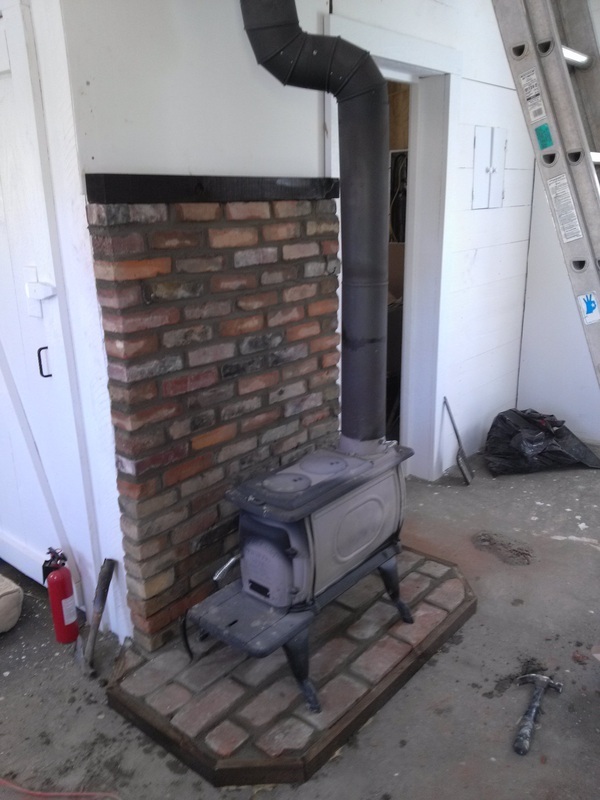 Now that the depth of the brick has been added in front of the cement board on the wall, the stove is really close to the wall. I know many would be really concerned about this. 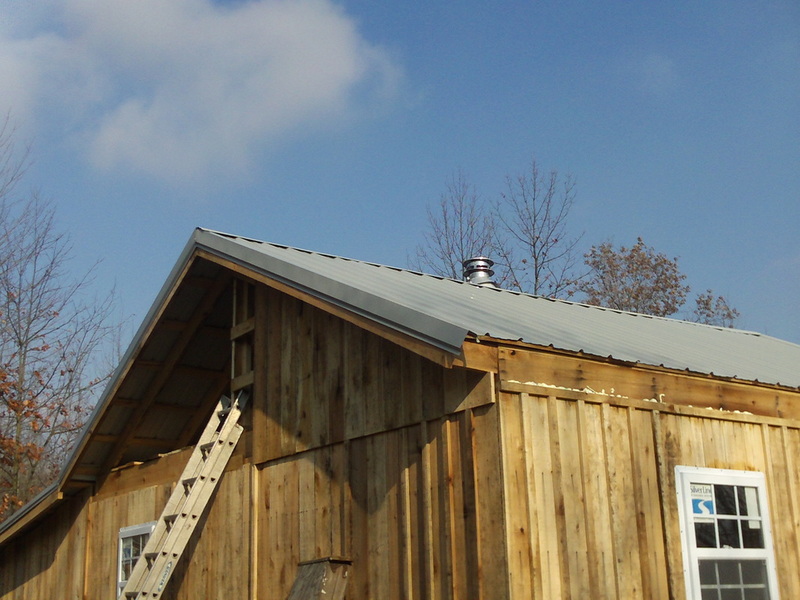 The thing is, we burnt the wood stove all winter as we worked. 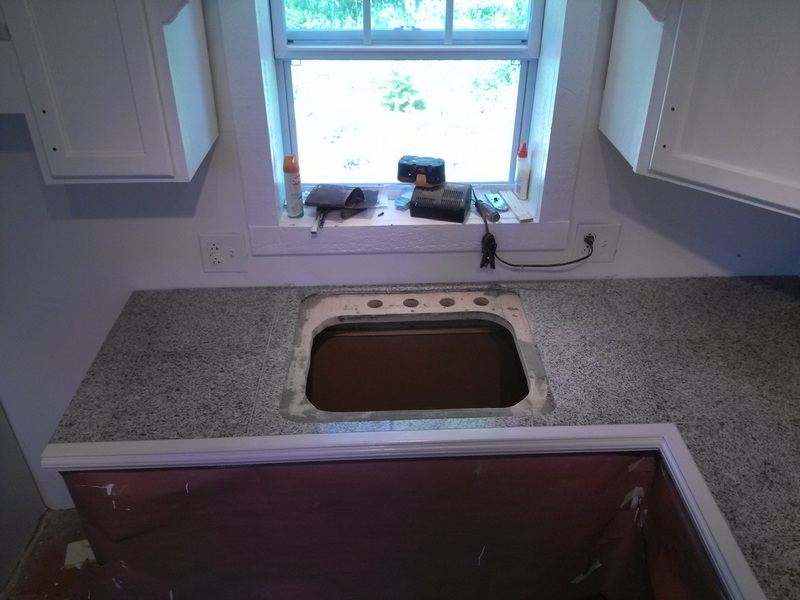 The cement board only got warm to the touch. Very warm, but not hot enough that you couldn't lay your hand on it. The brick will be even more of a heat barrier, so I can't immagine there will be any problem. 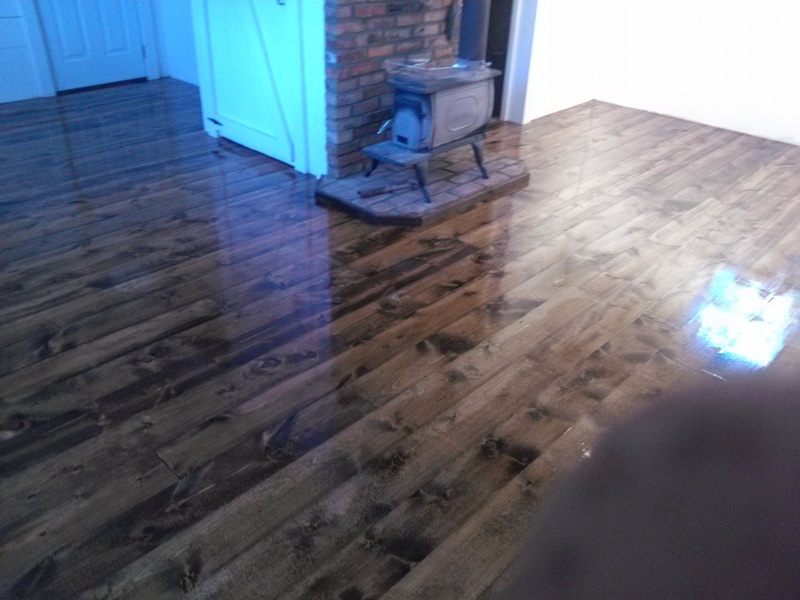 We also bought and stained all the boards for the floor Saturday. 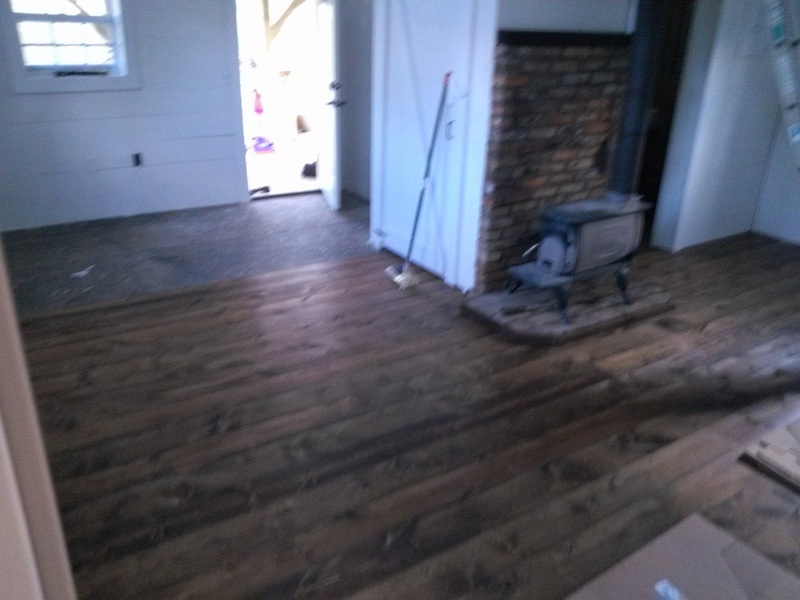 After we finished staining them, I started laying bricks while the stain dried. 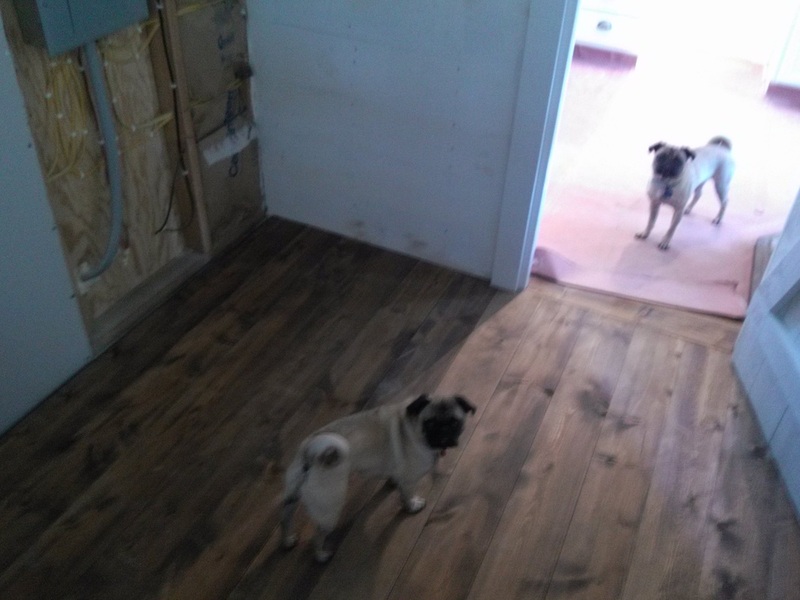 Sunday morning, I finished the brick and in the afternoon, started laying flooring. Wow, we love it so far! 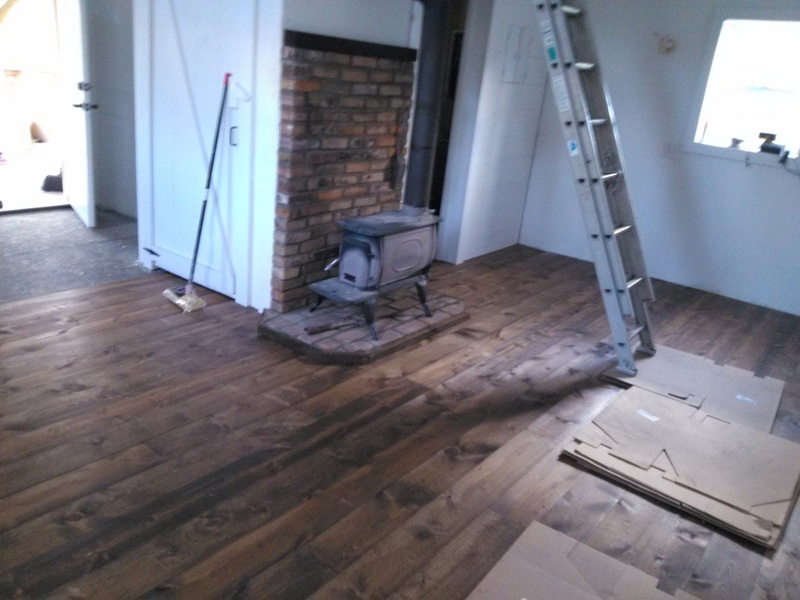 The laying of the floor continues. 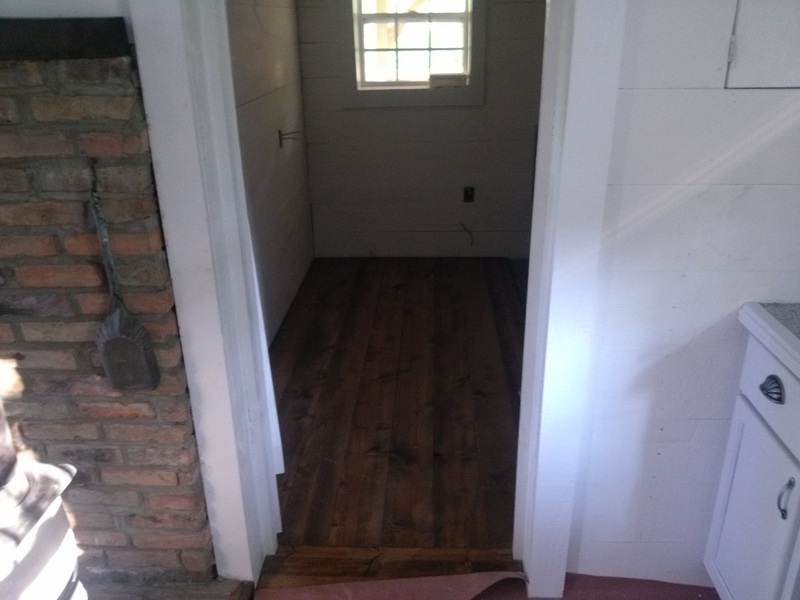 I should finish the floor tomorrow after work. 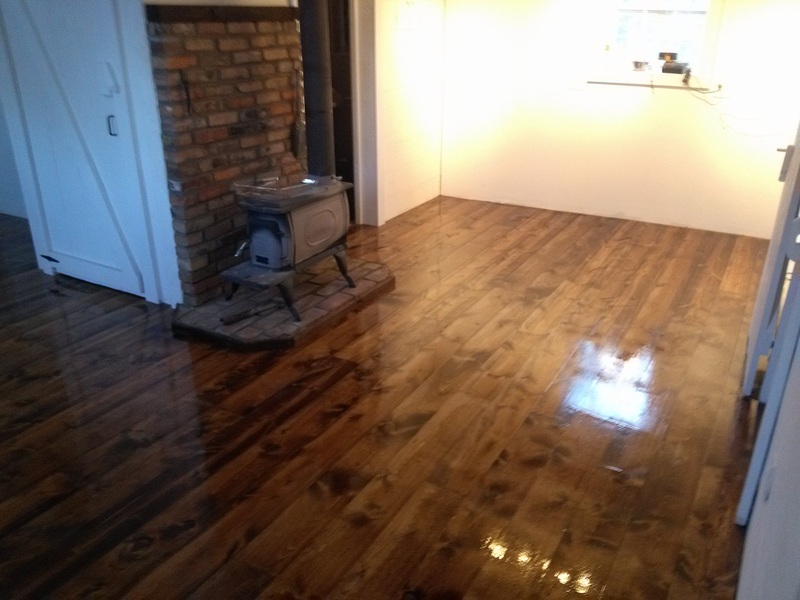 This evening, I finished laying the floor, and put on the first coat of High Build MinWax Urathane. 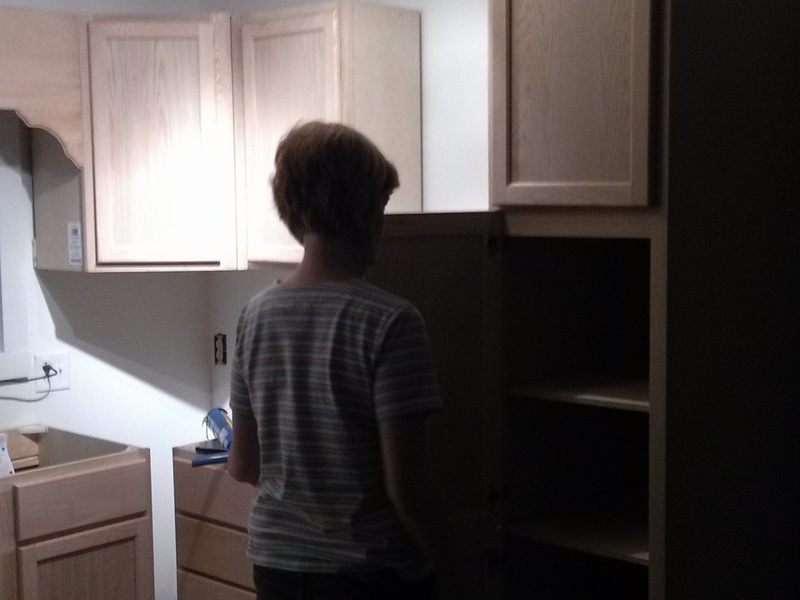 Today I went and bought the kitchen cabinets. 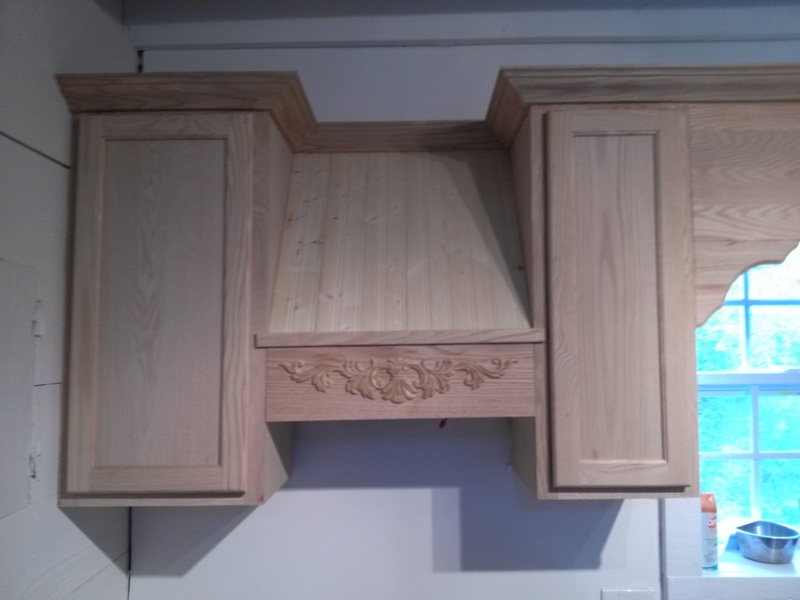 They are just the cheap "in stock" unfinished oak cabinets you see at Lowe's or Home Depot. I bought them at Menards because there were quite a bit cheaper than Lowe's. 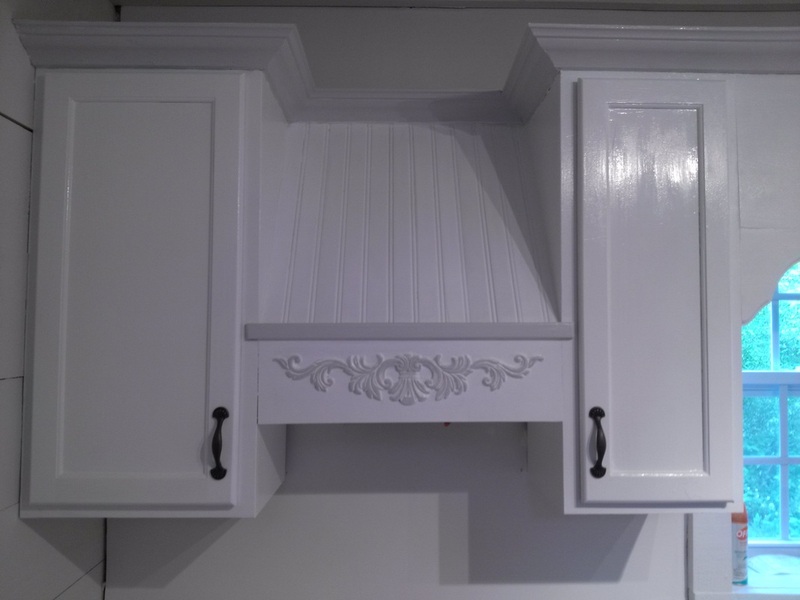 We plan to paint them, and put lots of fancy appliques, moldings, and nice drawer pulls etc. to make them look a little more "high end" than they do now. 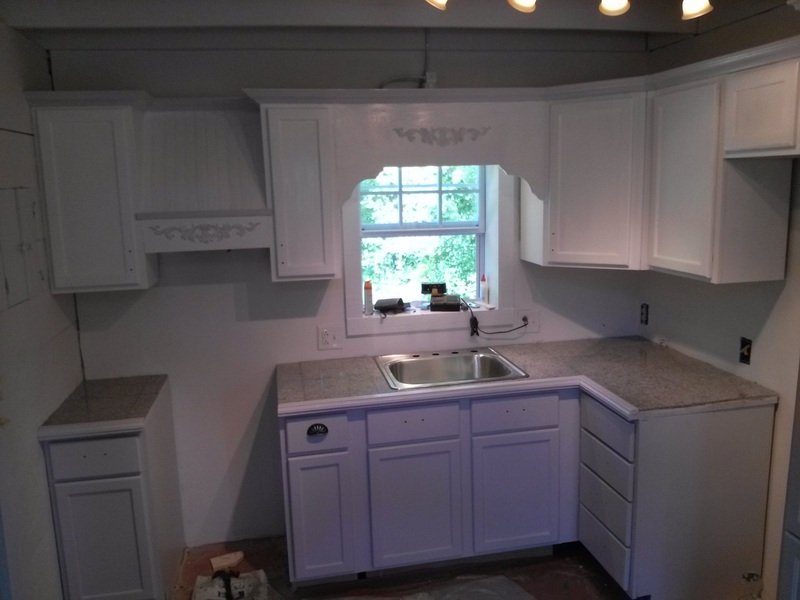 The entire kitchen including moldings, pulls, and appliques was a little under $800.00. 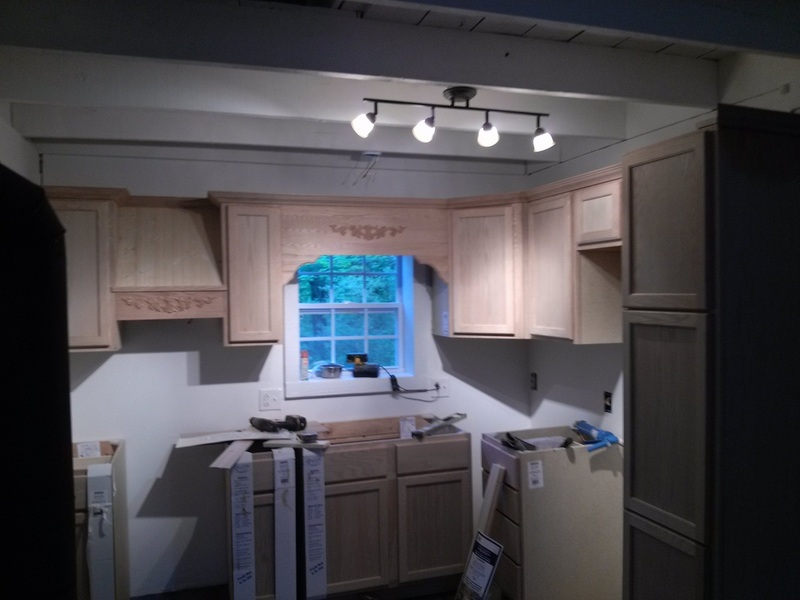 I finished hanging the wall cabinets today. Then worked on some of the "fancies" and trim. 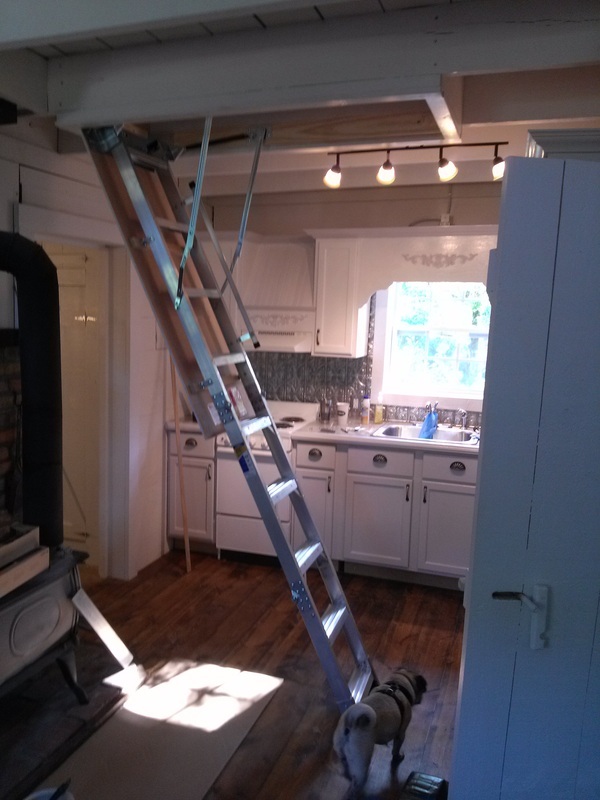 There will be a small (20") stove. 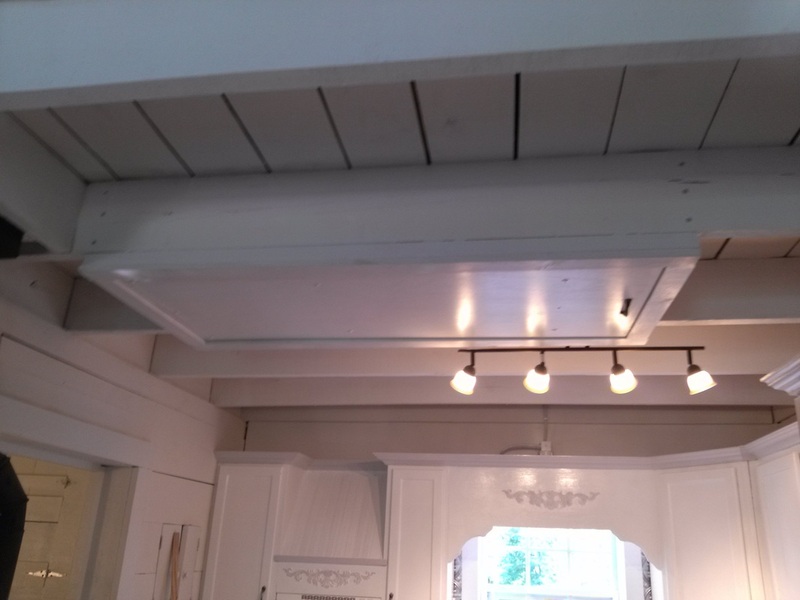 I couldn't get that small of a cabinet for above it to mount a range hood, so I had to get creative to fill the space. 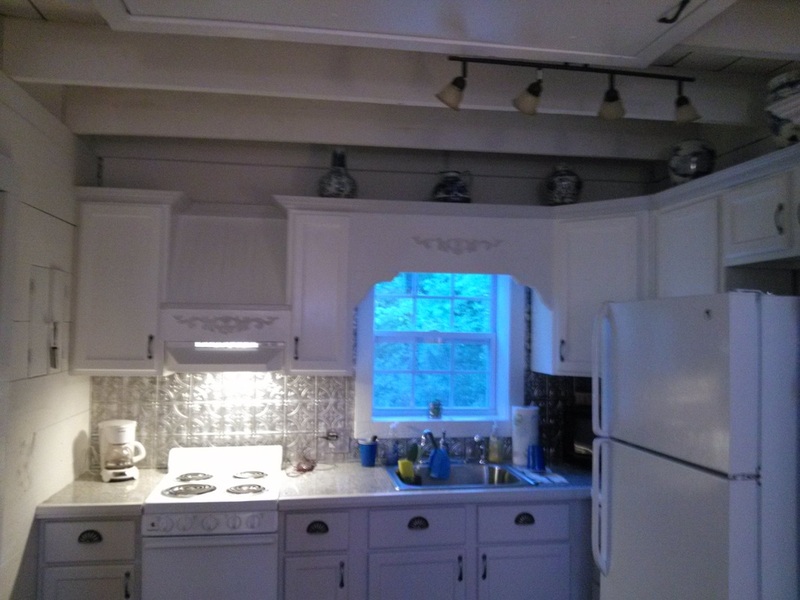 Below the "wooden hood" you see in the pictures, there will be a white 20" wide range hood I found on line for $75 bucks. 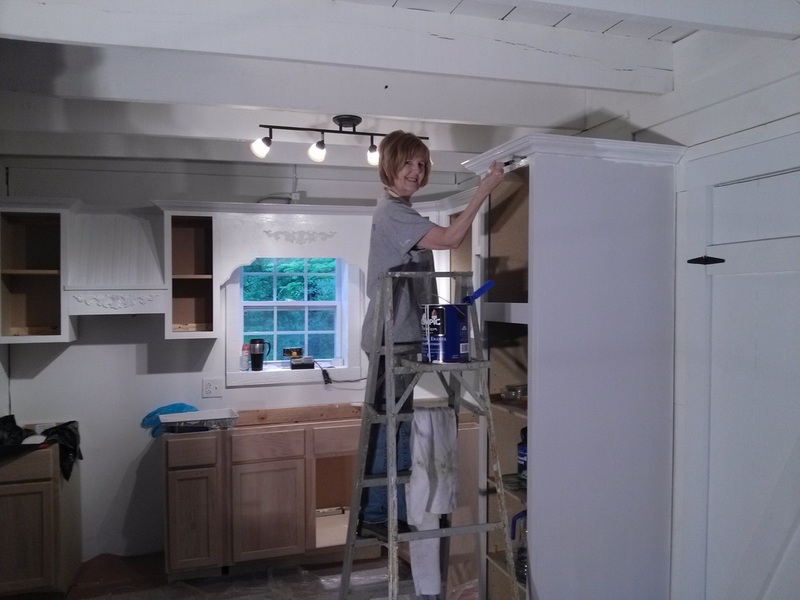 We spent this entire weekend painting the cabinets. They turned out pretty well, but we made a mistake on the color of hardware we chose. 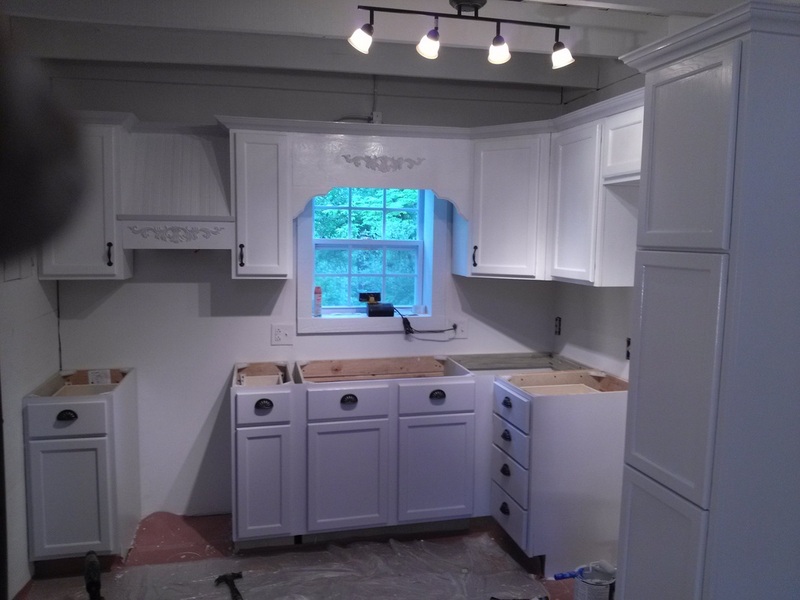 We are going to go back and get the same style in a pewter finish, which will go much better with the gray cabinets. 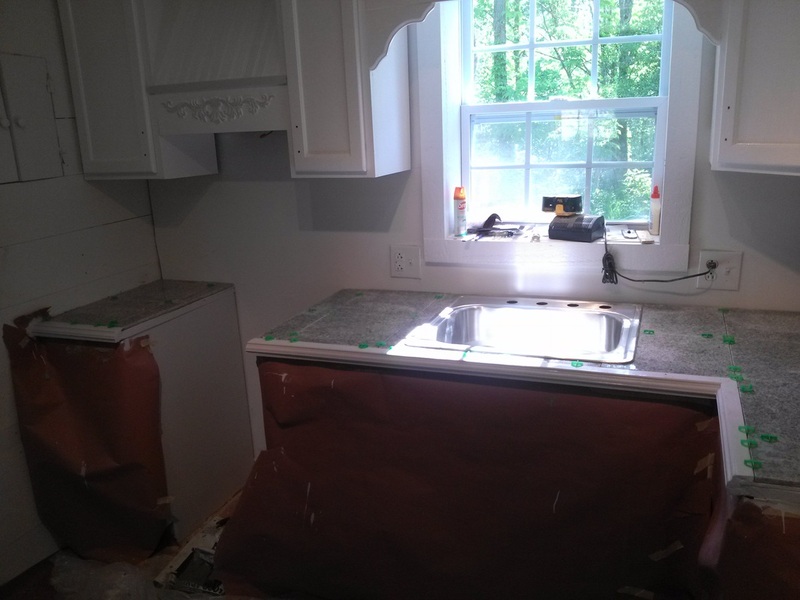 Finely, the countertops are all tiled and grouted. 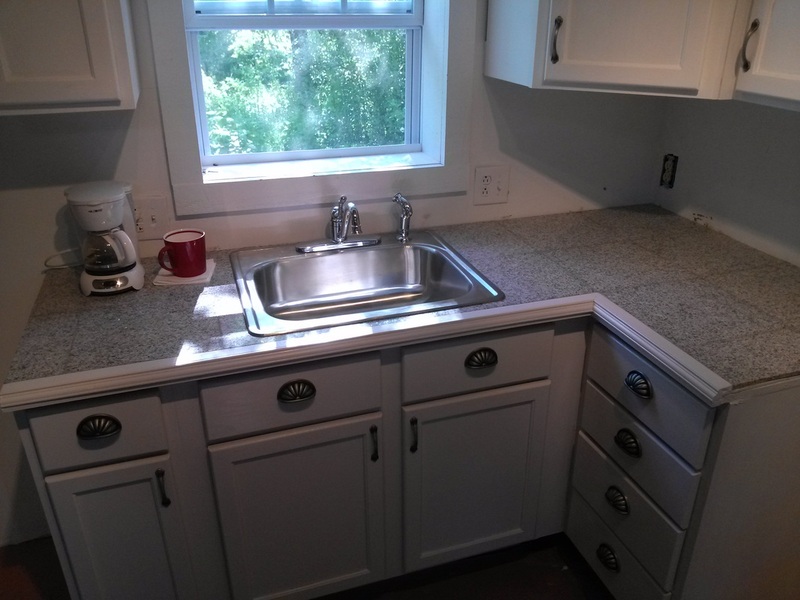 I used an epoxy grout, which I really love for countertops. It is bullet proof! Tonight after work, I layed the flooring in the bathroom. It was already stained and ready to go. But it still needs urathaned. 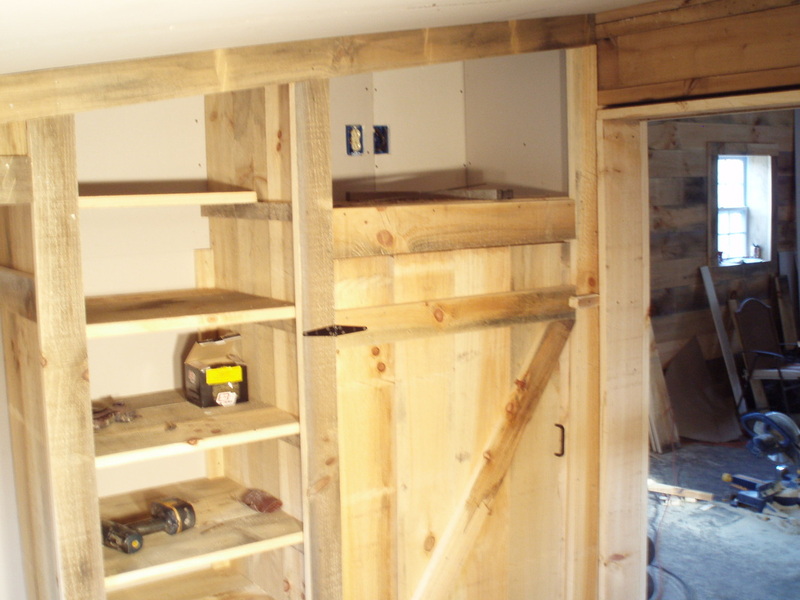 It was great getting that stack of lumber out of the bedroom so I can move around in there. 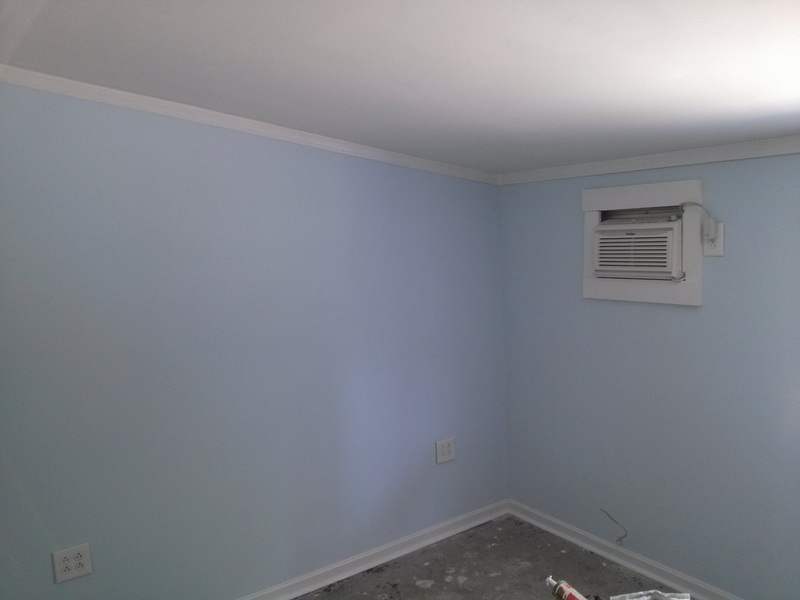 Leslie has decided to paint the two drywall walls in the bedroom a sort of sea green. I wish she would quit looking at magazines! lol. 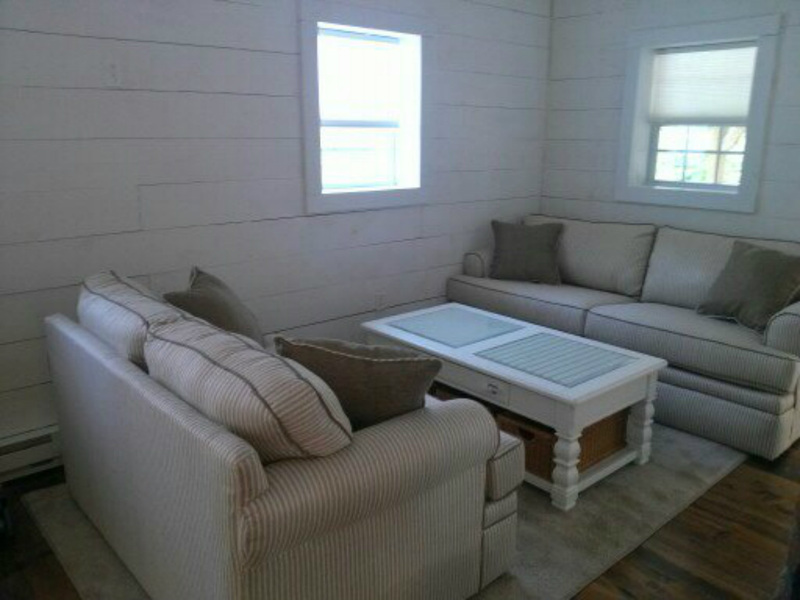 The other two walls (the wood ones) are staying white. As soon as she paints, we are ready for bedroom carpet. 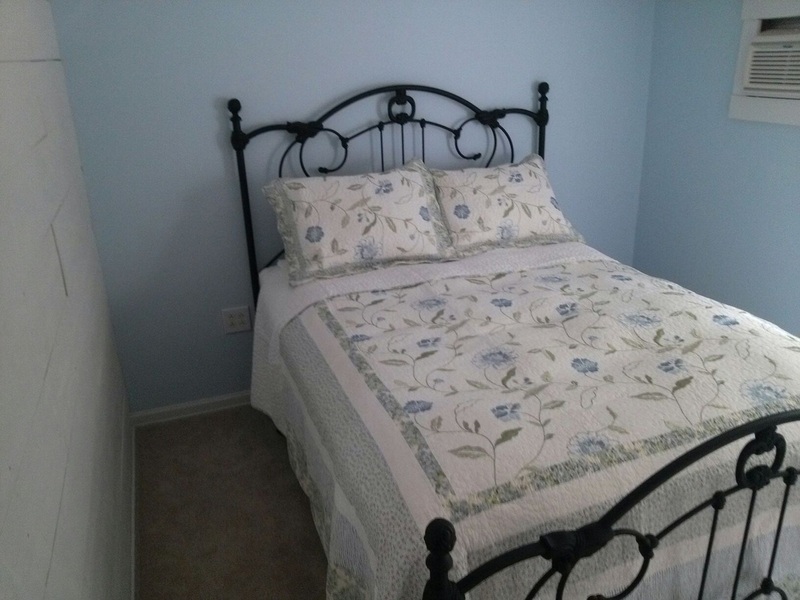 We might go ahead and move the bed from our existing guest room out there so the bedroom is totally finished and ready to decorate with accessories. It will be less work all at once when we move that way. It will also give me a place to sleep if I decide to spend entire weekend there working. 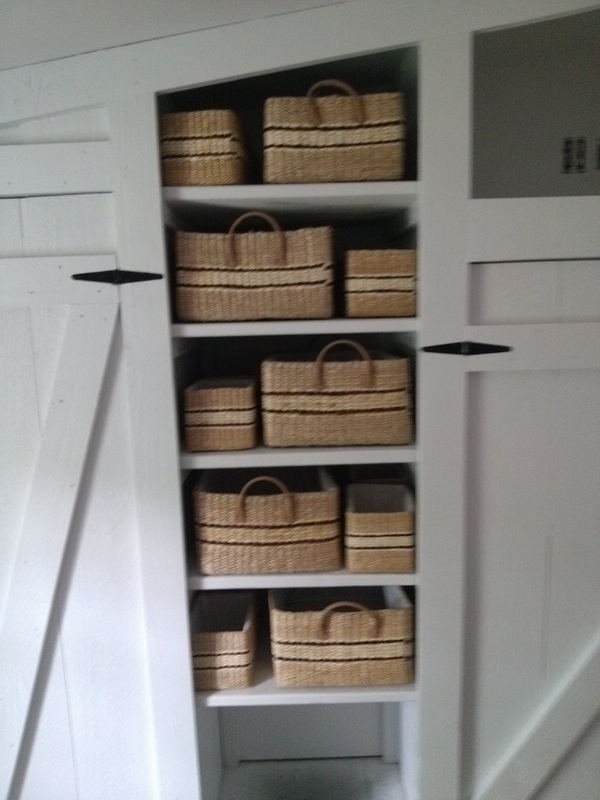 Oh, she also found baskets at a new factory basket outlet that just opened in town. They are for storage of unmentionables on the bedroom shelves. This is Memorial weekend. First I want to take a second to remember all of the fallen heros that have protected this country and given their lives for our freedom. 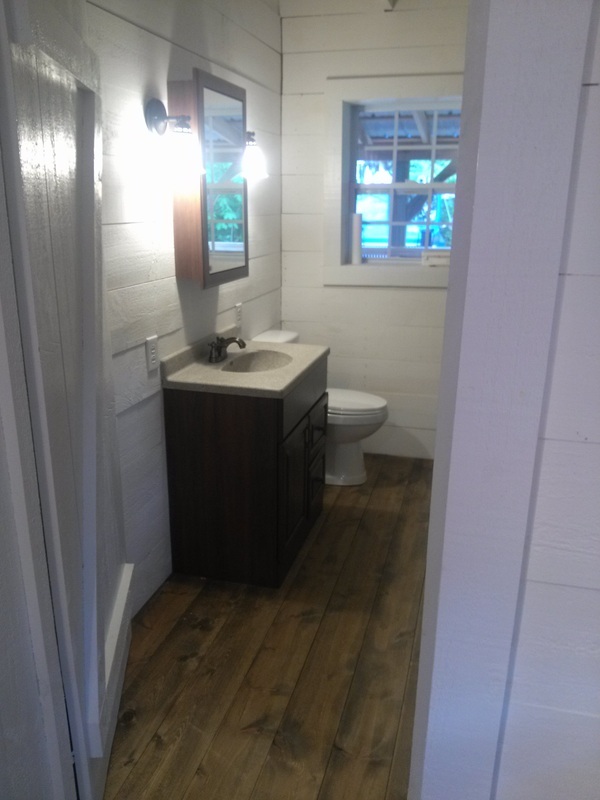 Today, I went to the cottage and finished the flooring in the bathroom. 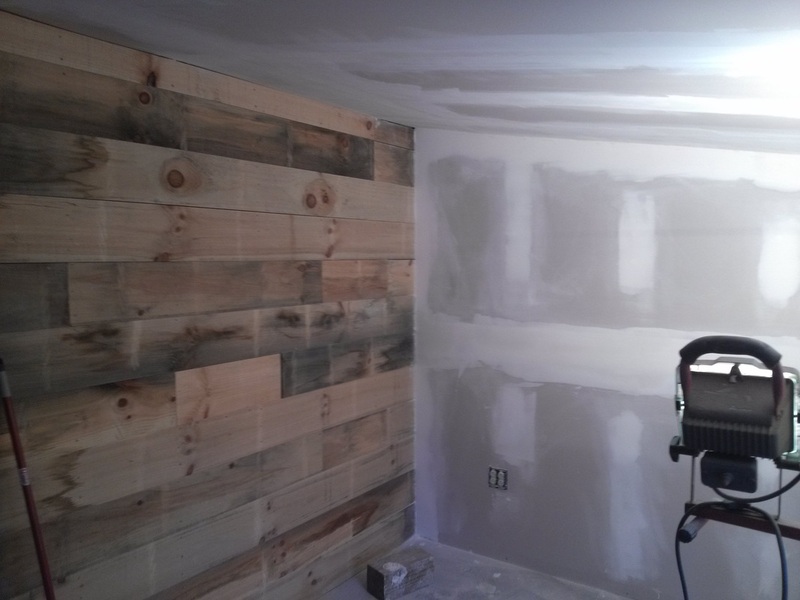 I had about 5 more boards to set in place. 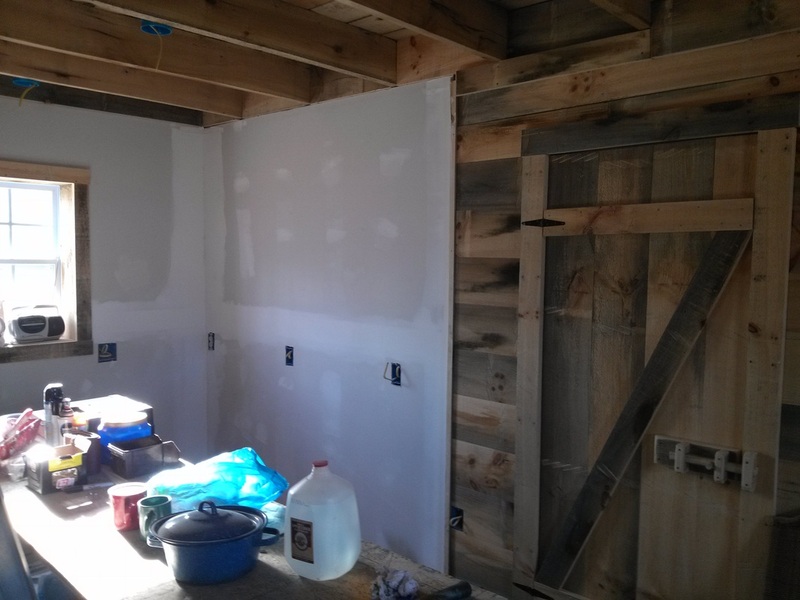 I also hung the drywall on the wall were the shower and stackable washer and dryer will sit. Here are some more pics. Wow, it was a busy weekend. 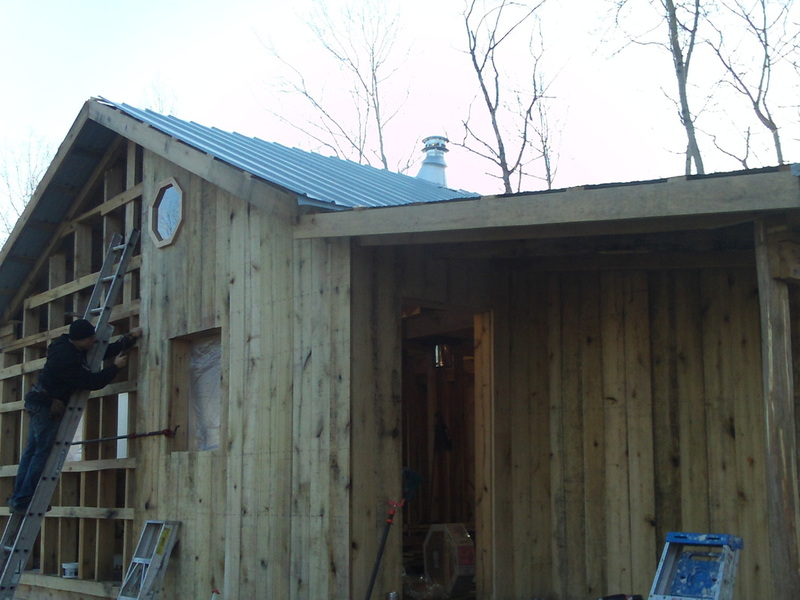 I went to the cottage early Saturday morning and started the plumbing for the sinks. 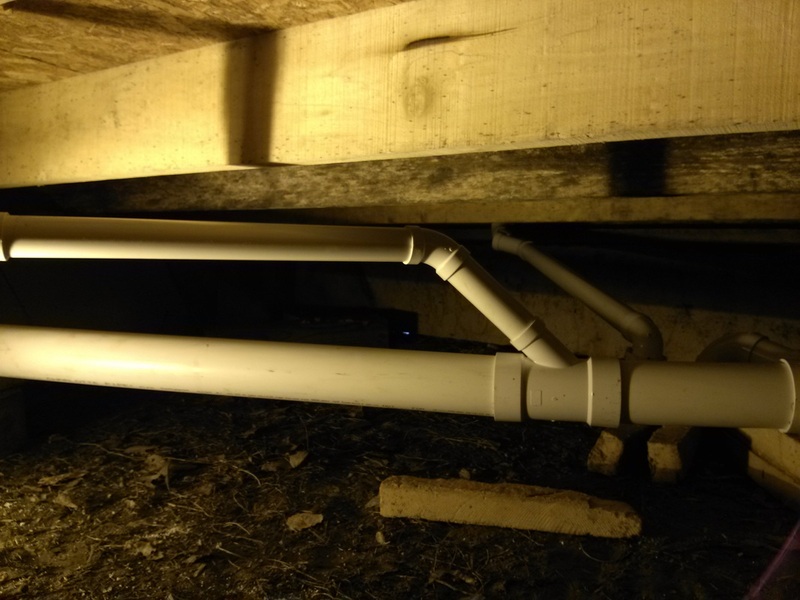 We had decided to use Pex pipe. If you haven't heard of it, google it. It is incredible stuff! I was an old school copper guy. But copper has become so cost prohibitive. I started researching and found this stuff. I am a believer! I love working with it! Check it out. 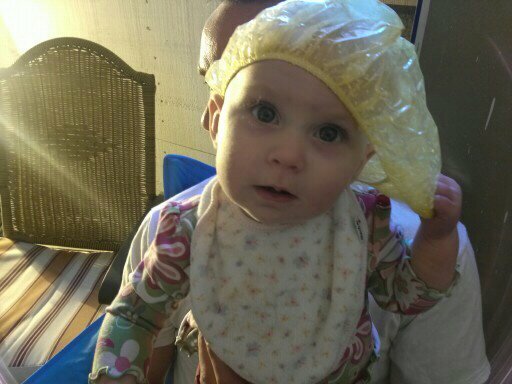 So, anyway, my wife had to do the grocery early. 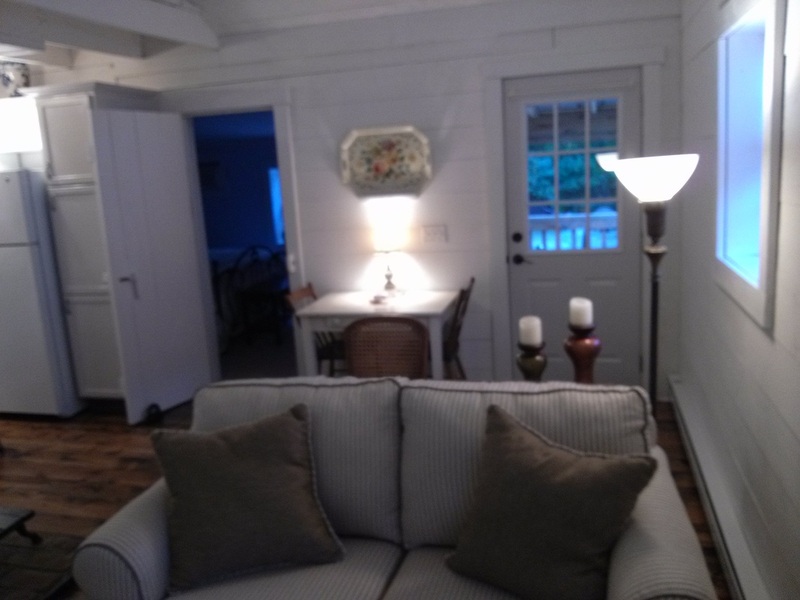 When she got done and came to the cottage, she suggested we go buy our stove and hot water heater. Well, after 6 hours at Lowe's and Menards we ended up with the hot water heater, the kitchen stove, the bathroom vanity, the vanity top, (which was cracked and has to go back), the medicine cabinet, the sconces for beside the medicine cabinet, the back splash for above the kitchen countertop, and a ton of misc. 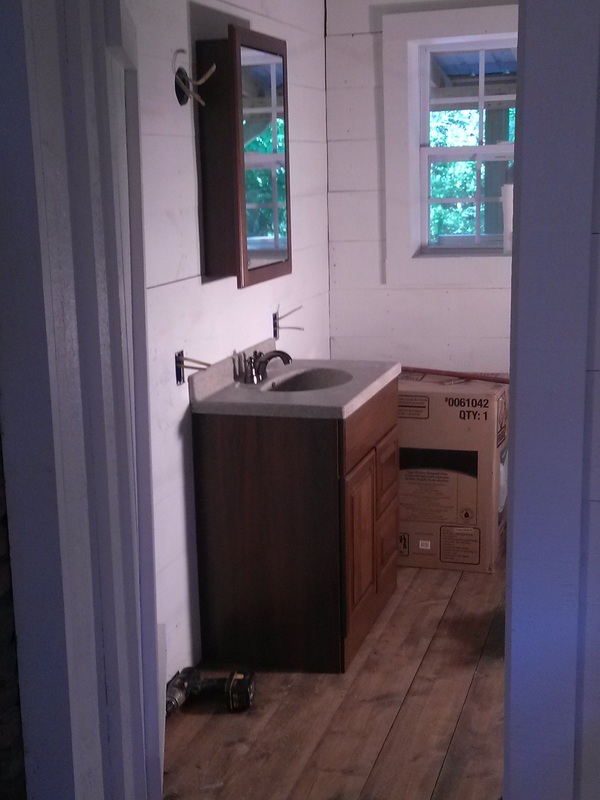 plumbing and electrical parts to hook up the sinks and hot water heater. 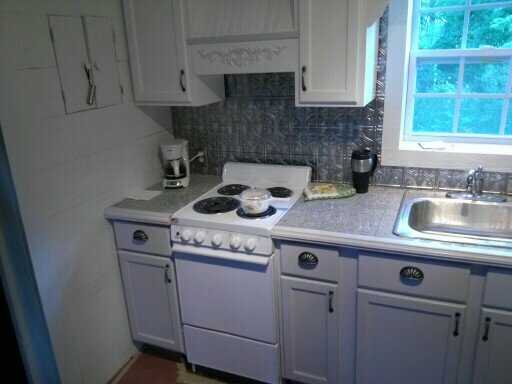 I spent all day today (Sunday) putting in the back splash and started installing the hot water heater. After work tonight on the way to the cottage I stopped at an antique shop. 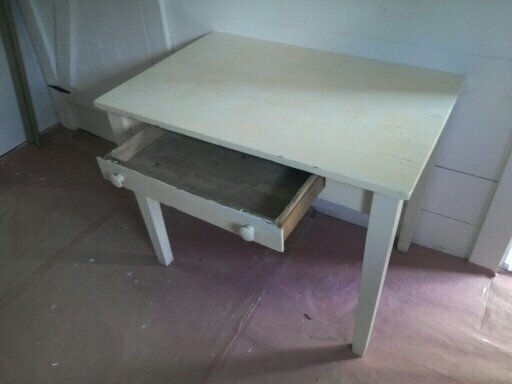 I found a great little kitchen table! 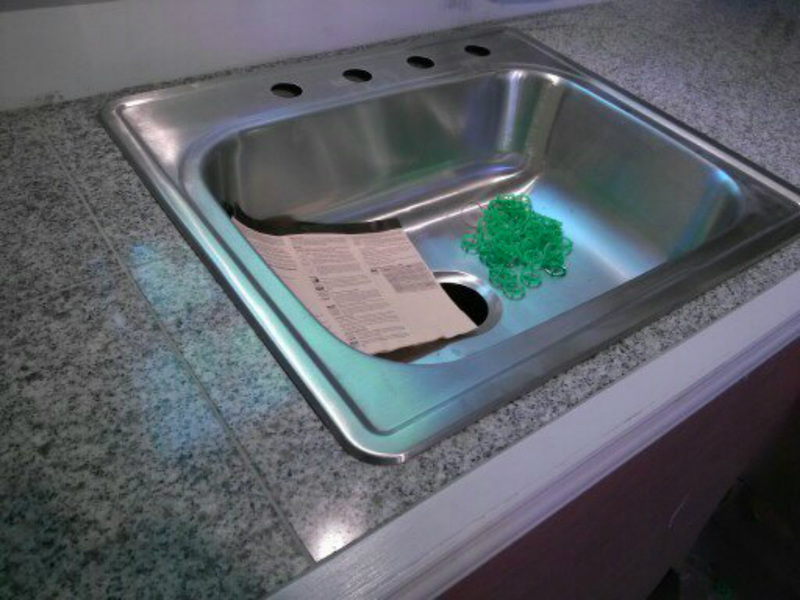 I also had to exchange the granite vanity top at Menard's that was cracked when I got it home. 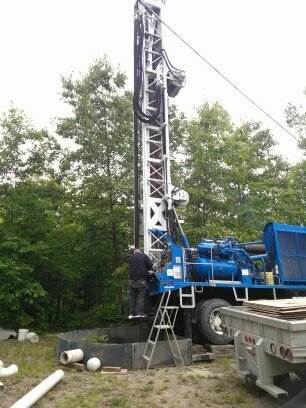 Today the well driller showed up to set up the rig. He is still waiting on the health department to give the "go ahead". We should here from them tomorrow. 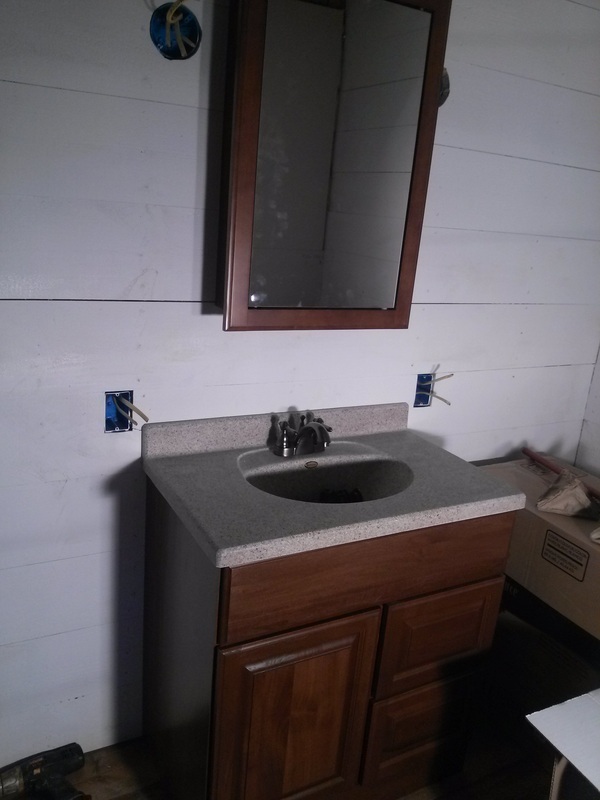 I finished the electrical in the bathroom today, and put the hardware on the vanity. 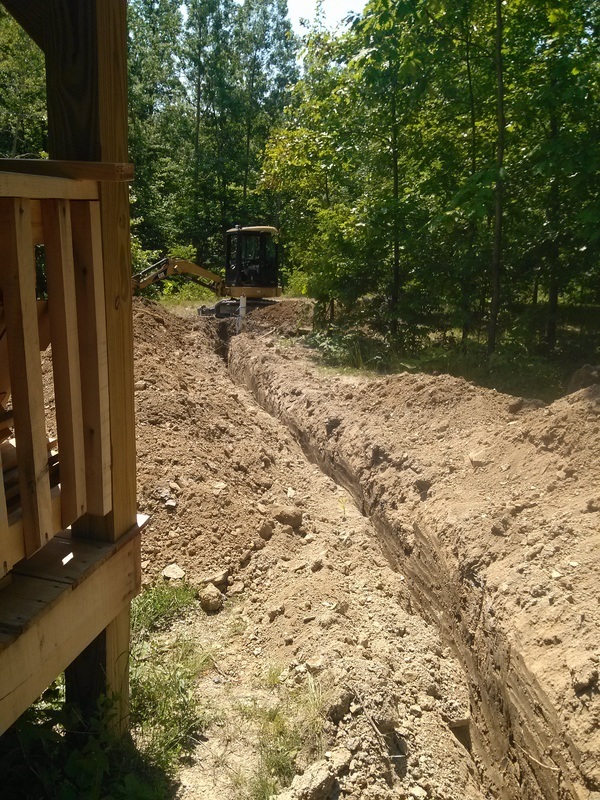 While she was at work Sunday, I finished the last link ( which had to be dug down into the dirt a tinch) and ran under the foundation. 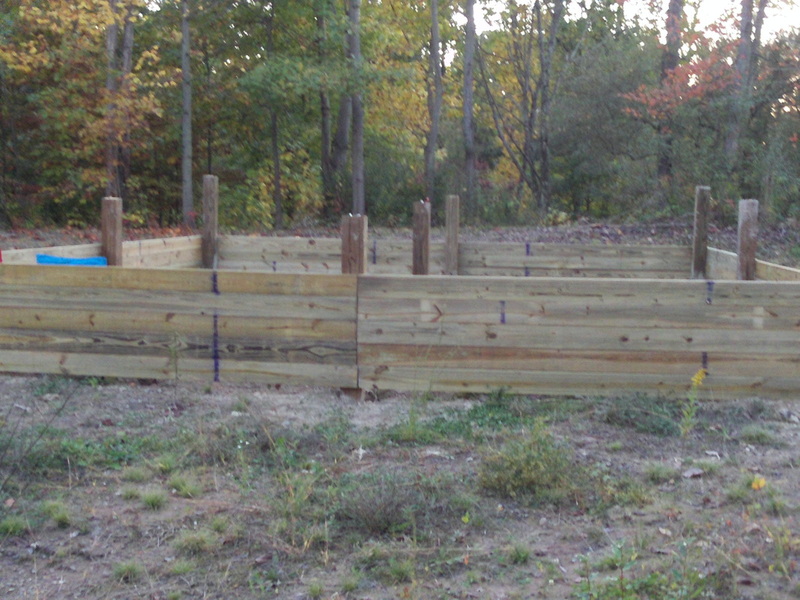 It is now outside the foundation and ready to hook to the septic system when I put it in. I might do that this coming weekend, but is Father's day weekend, so I might put it off one more week. 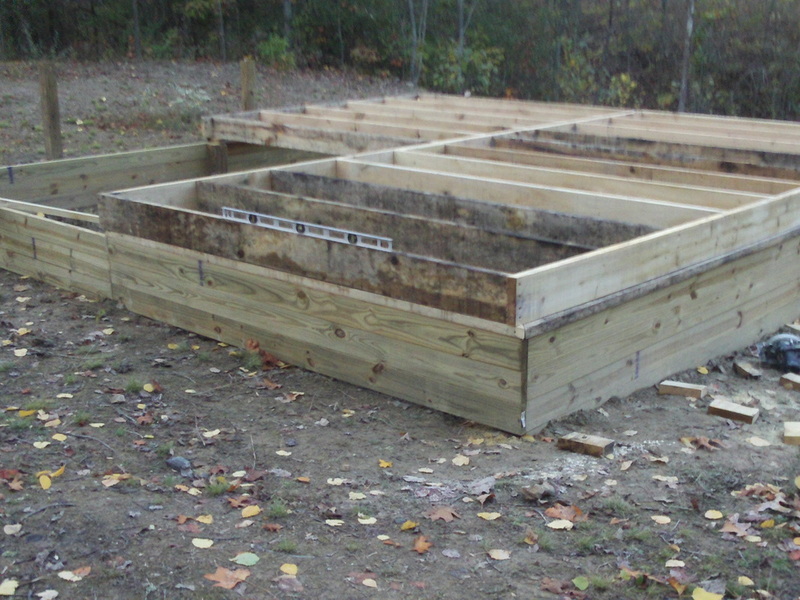 After I finished the DWV, I hooked up all the sinks, putting in the trap addapters, traps, etc. Off to Menards I went. 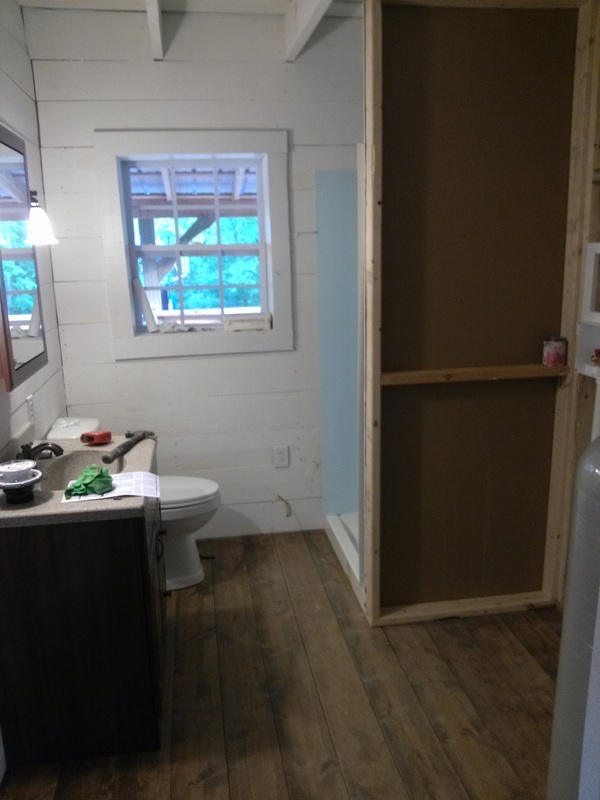 I picked up a shower stall, 2X4's, MR drywall and a few fittings. Yep, got the shower installed by about 6:00 last evening. Well, the hole for it anyway. 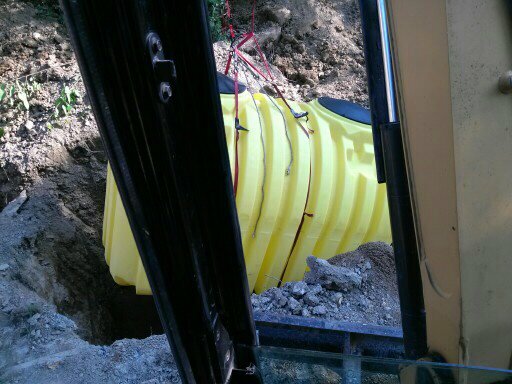 The base is in, and the drain attached. 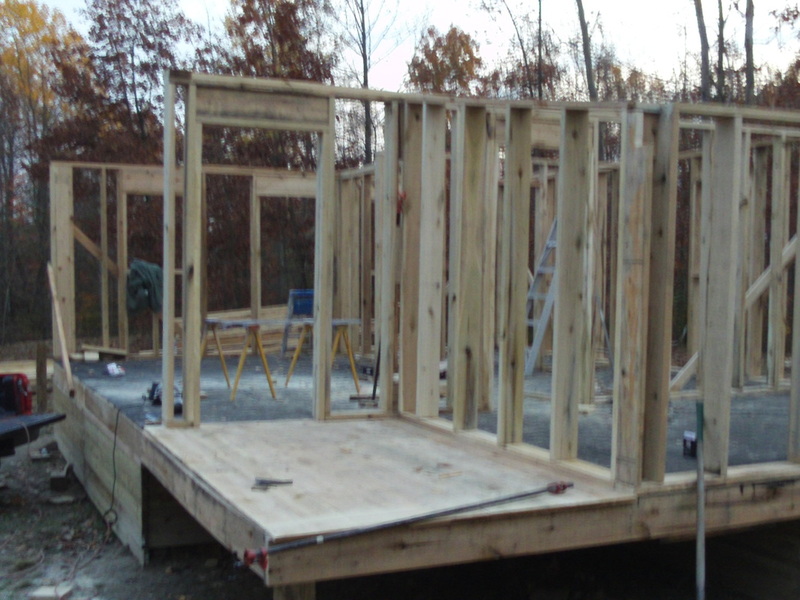 The walls still have to be glued in place, but that is quick and easy. I will finish that tonight. I also got the hookups for the washing machine roughed in. 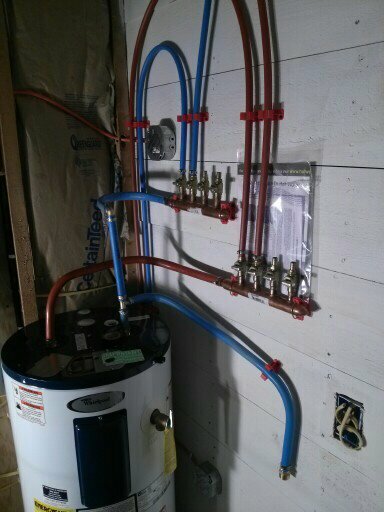 I still have to run pex pipe over to the faucets. 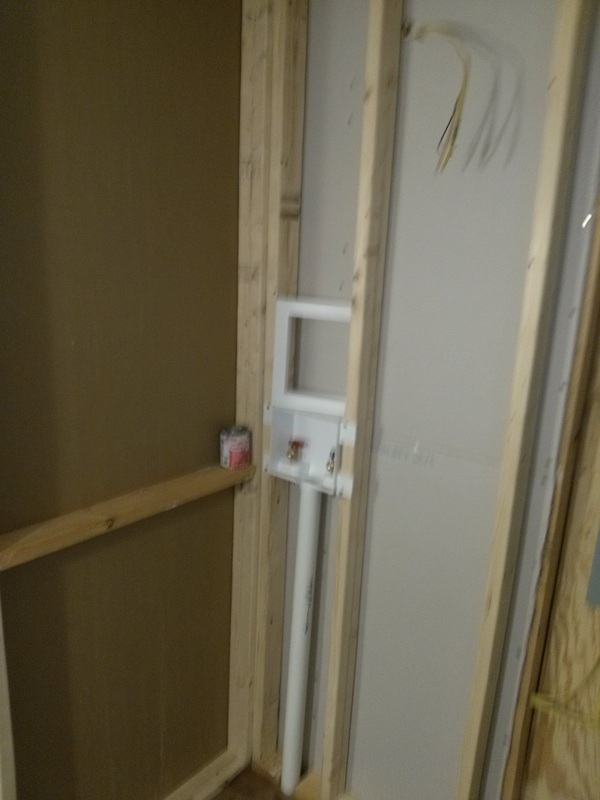 Tonight after work, I glued the shower walls up and connected the washing machine faucets to pex pipe. If it is going to rain, it straightens out to horizontal. 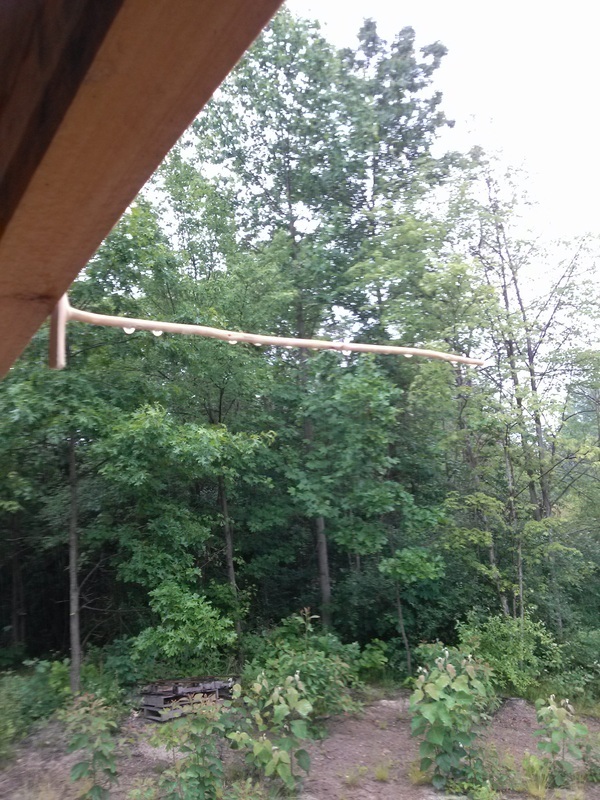 I had not heard a thing about rain today, but when I got to the cottage, I noticed the stick was straight out. THIS WAS AN HOUR LATER! 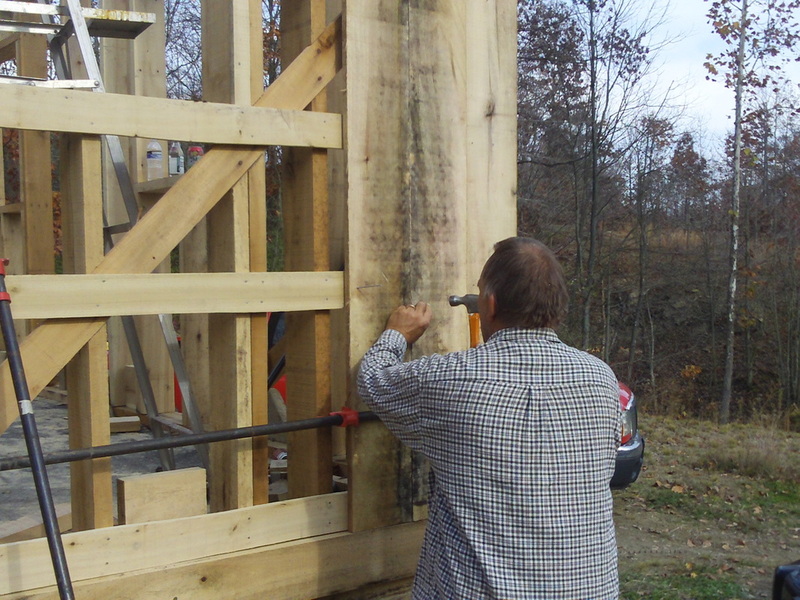 The story of drilling the well got more and more complicated. It ended up taking 9 days from the day they set up the rig, until we had water. Most of that time was just extremely tough drilling including hitting lots of huge rocks. One of the days, a part on the rig broke and he had to order the part out of Texas. Finely, Thursday, they finished drilling. They came yesterday and pulled the rig. 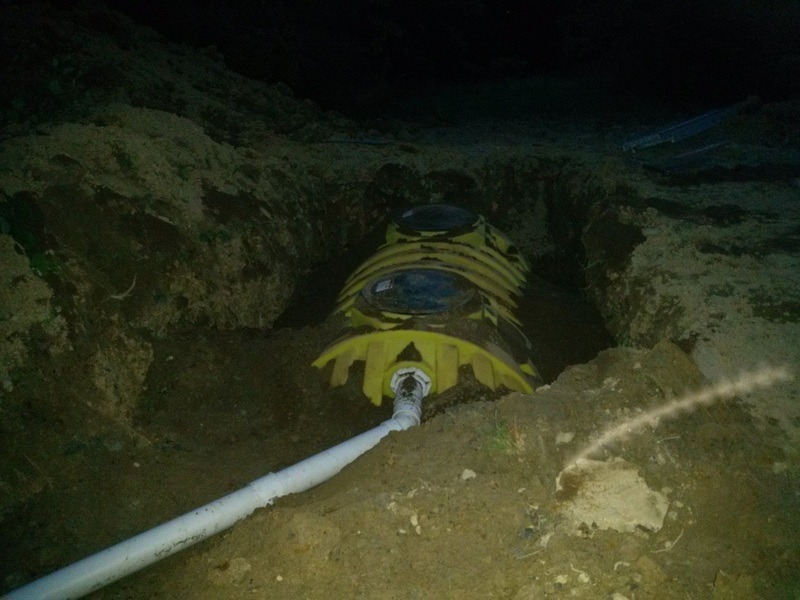 Today, (Saturday the 16th) they came and trenched to the house, set the pump, did the wiring and Fired up the pump. 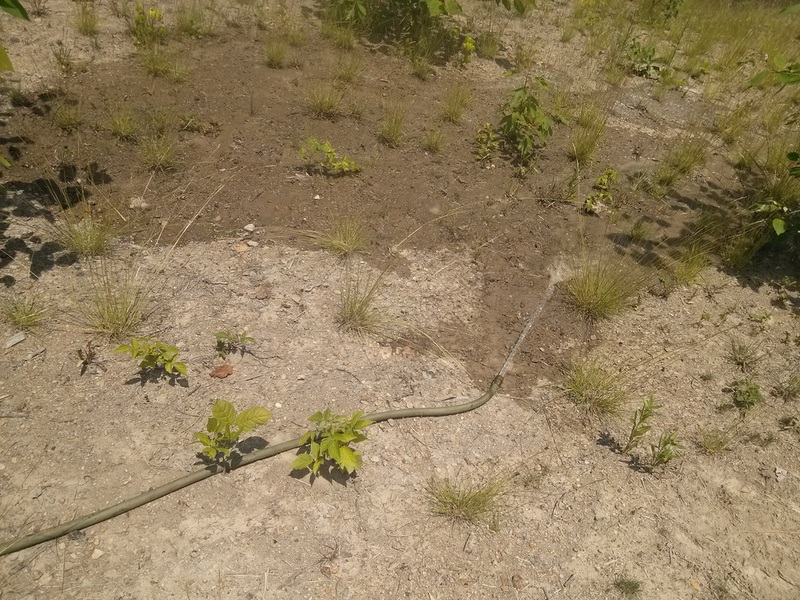 The sight of fresh, wonderful water flowing from a hose they ran out of the house was beautiful! The water test said, 0.04 Iron, 4 grains hardness, and 7.06 PH. Not bad! I'll take it. And.....it tastes wonderful too! Ok, my last entry was this morning before I went to the cottage. I just got home after another 11 hour day. 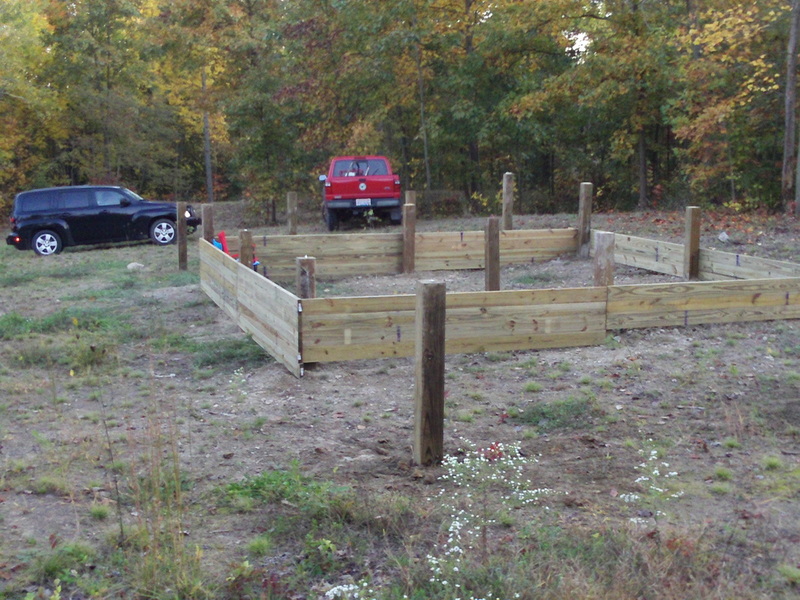 I FINISHED THE SEPTIC SYSTEM! The inspector is scheduled for 1:30 tomorrow afternoon. God I hope it all passes. I just don't have an once of energy left to have to do any part of it over again! Here are the final pictures of the entire system finished and ready for inspection. 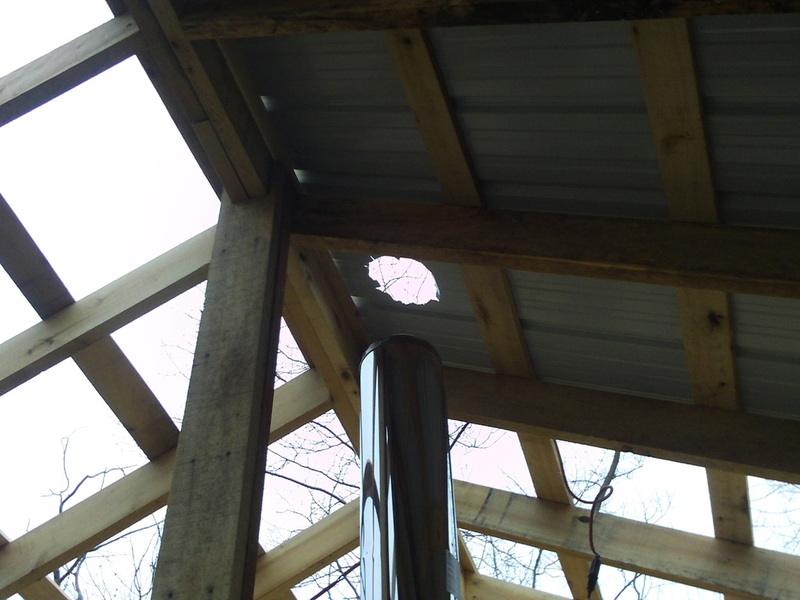 The hole is 12 feet long, 7 feet wide and 7 feet deep. That will allow for a foot of sand on the bottom and all sides of the tank. I am writing this the next morning befor work. 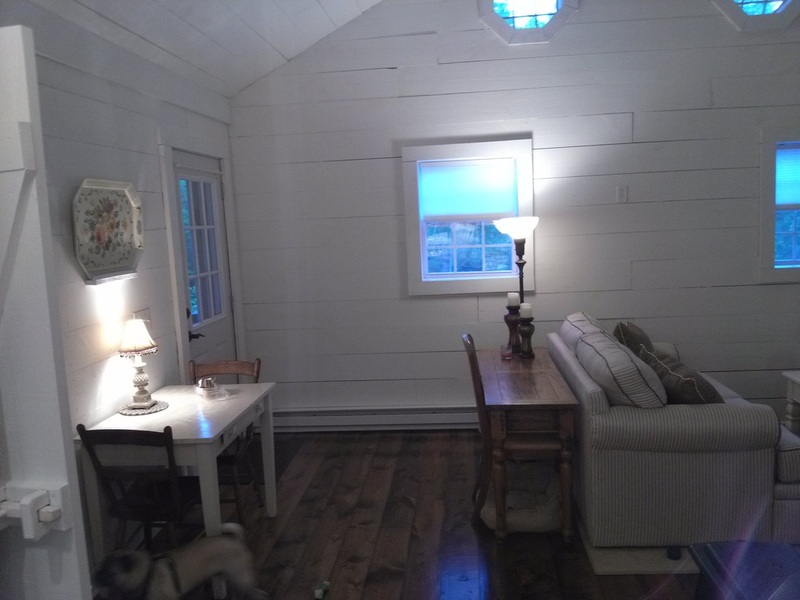 Last night I was at the cottage until almost 10pm. I got sand delivered yesterday for the bottom of the hole. When i got there after work, I started putting sand in the bottom of the hole. The truck driver dumped the sand as close as he could get to the hole, but it still meant making trips back and forth about 20with the track hoe to get sand. I put a 30" back fill bucket on the hoe to carry it, but is still was very time consuming. A bobcat sure would have been nice for this. 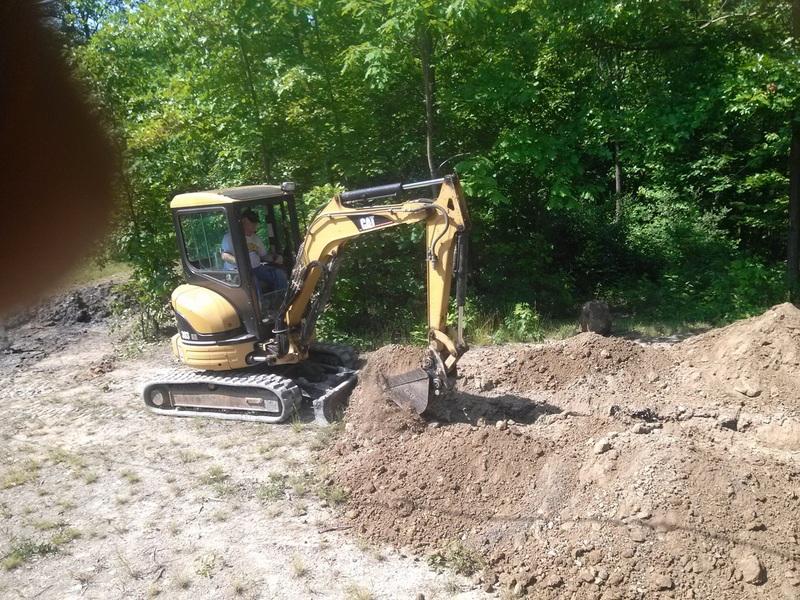 Once the sand was in the hole (about 18" of it) I was where I needed to be for the tank to just be about at grade, but have enough drop from the house for the entry pipe. 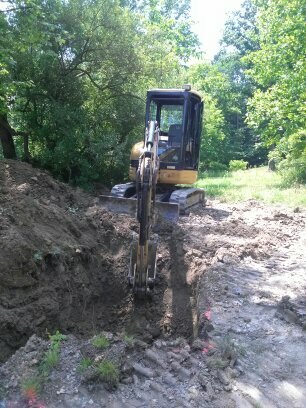 Then I set the tank in the hole with the track hoe. It fit just right! 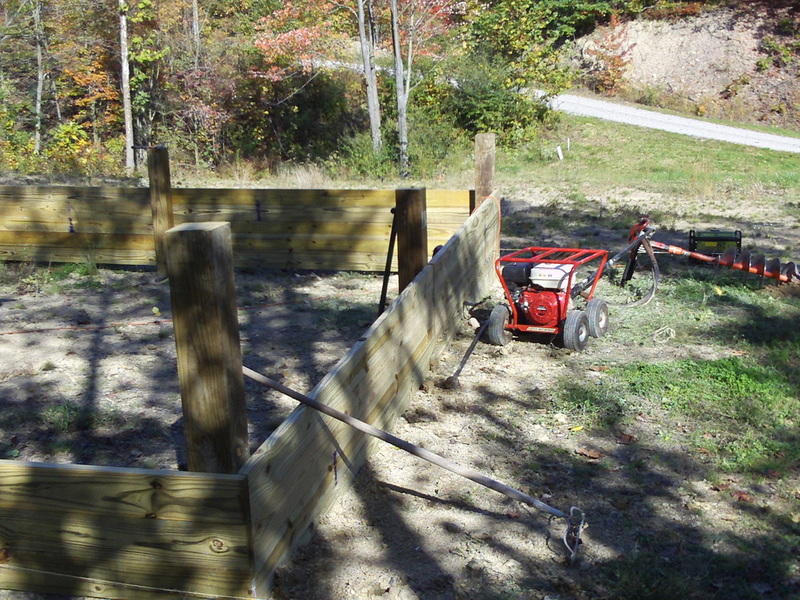 Then came the task of filling in around the sides with sand as well. That took FOREVER! Now, it was getting late. It was almost 7pm by the time I get that part done. But, here is a very important thing! 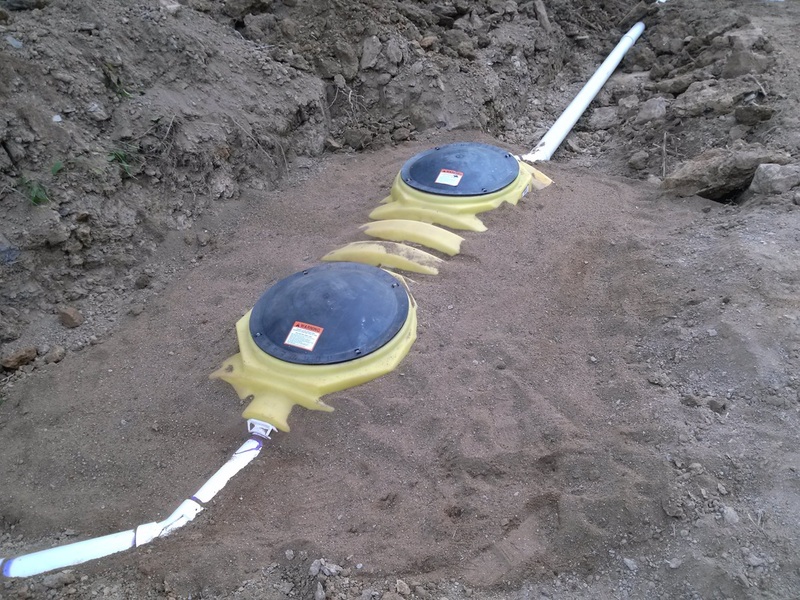 If you are using a plastic septic tank, you MUST fill it with water as soon as you can. 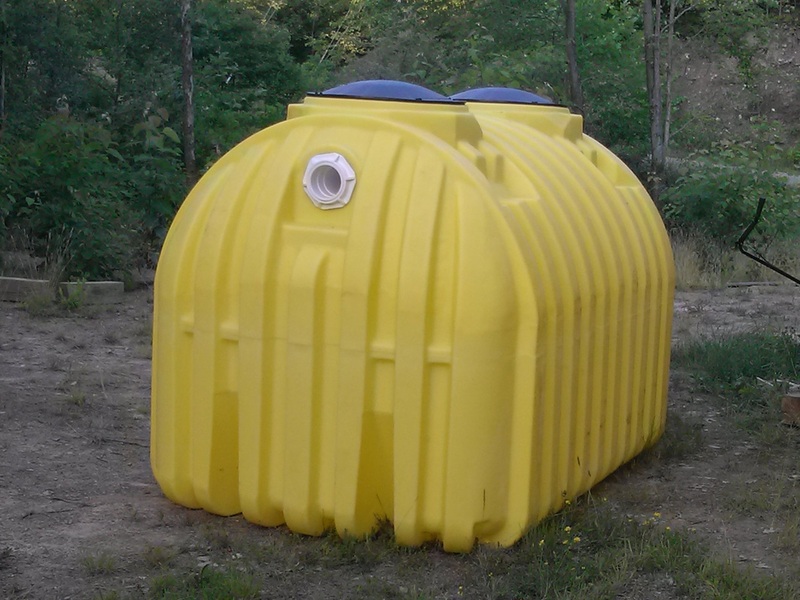 If you get much rain and the tank is empty, the tank will float up out of the hole. 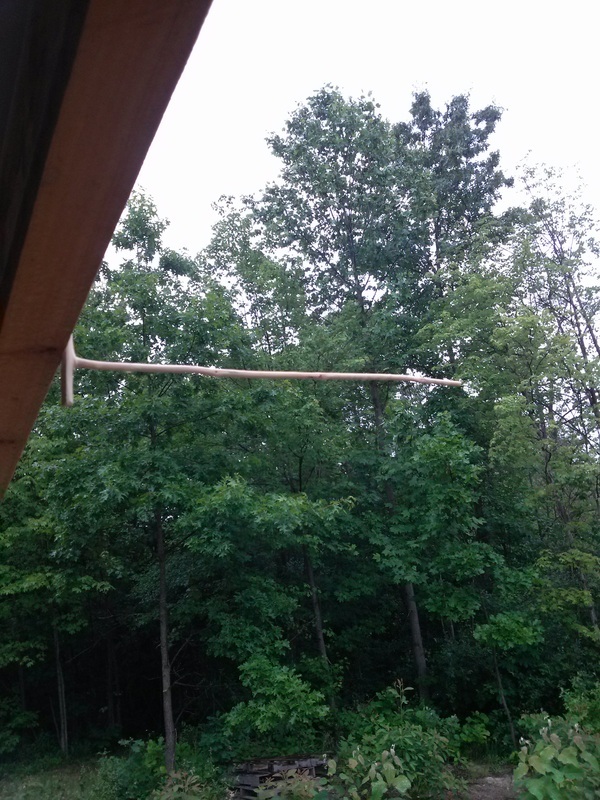 I still have a slight leak where one of the fittings was a little off on the angle where it was glued. Oh well, it was good enough to get water into the tank. Tonight, I will cut out a section and redue it, but it got my by for now to get water in the tank. 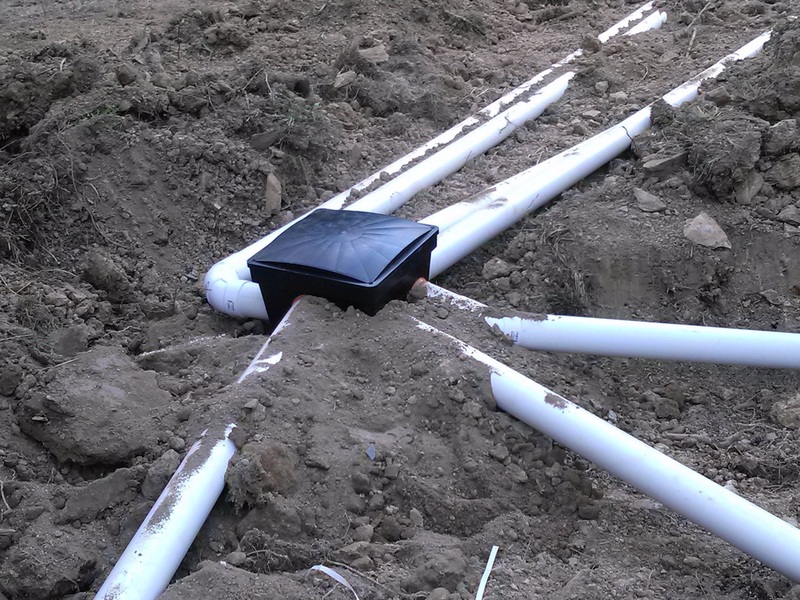 Next I will trench down the hill a little ways and install the distribution box. Ok, this is really, really bad! I have shared all the good, and fun stuff that has happened over the past 9 months, now it is time to share something really, really stupid I just discovered I did. OMG....I am sitting here shaking my head and half chuckeling, and half sobbing. 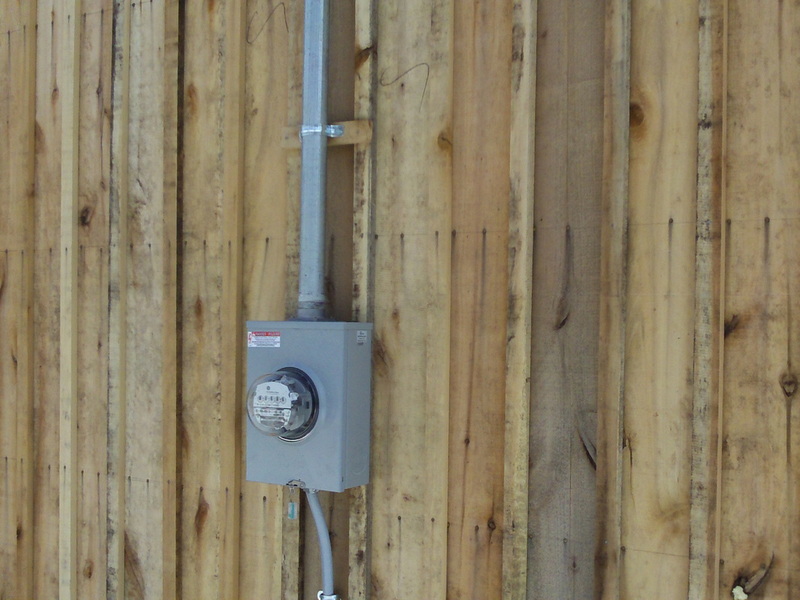 There is an inlet, and an outlet to the septic tank. 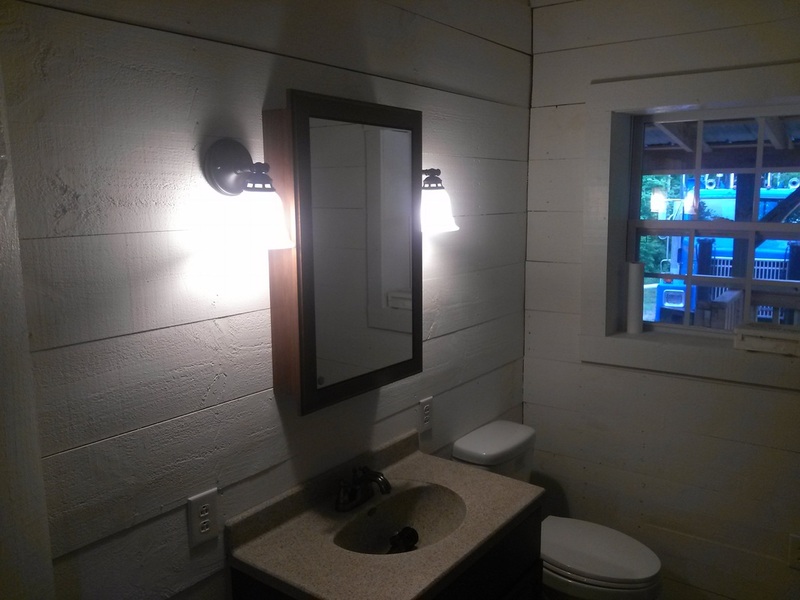 The inlet is slightly higher than the outlet. I had the tank sitting the right direction, but somehow when hooking up the straps, the way the track hoe was sitting, I swung it around an wasn't thinking that I just reversed it. I have installed it with the outlet tword the house. 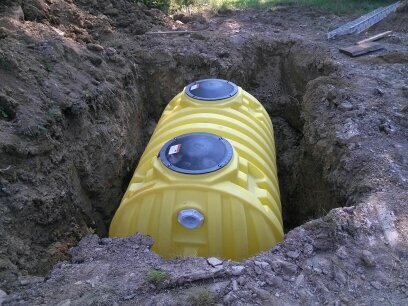 The fittings are all glued in, the tank is full of water, and totally burried in sand. I has to come out. A very close friend once told me if it isn't death or dieing, it can be fixed. I really need to remember that right now. OMG.......this is really, really bad! In the above picture, there is a little pile of sand sitting above where the pipe enters the tank. That sand is covering the word "outlet". That is why I didn't see it, or discover it sooner. 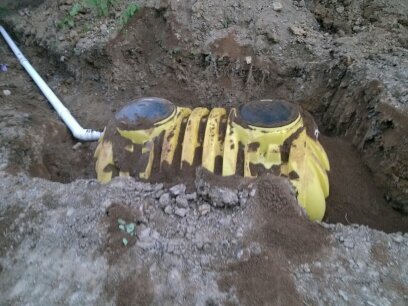 I was able to use the track hoe to dig the sand out from the front side of the tank. 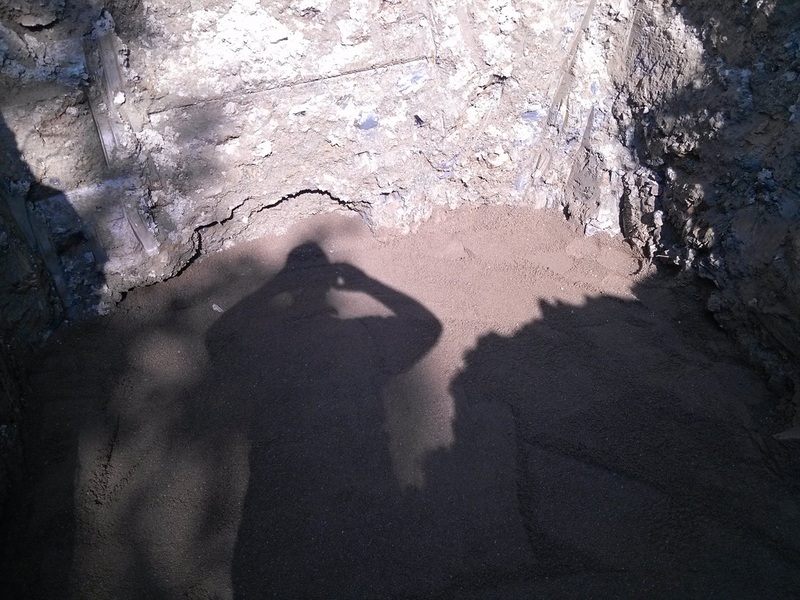 Then, due to lack of room to work, had to hand dig the sand out from the ends into the front cavity. Then back on the track hoe to empty the front area again. 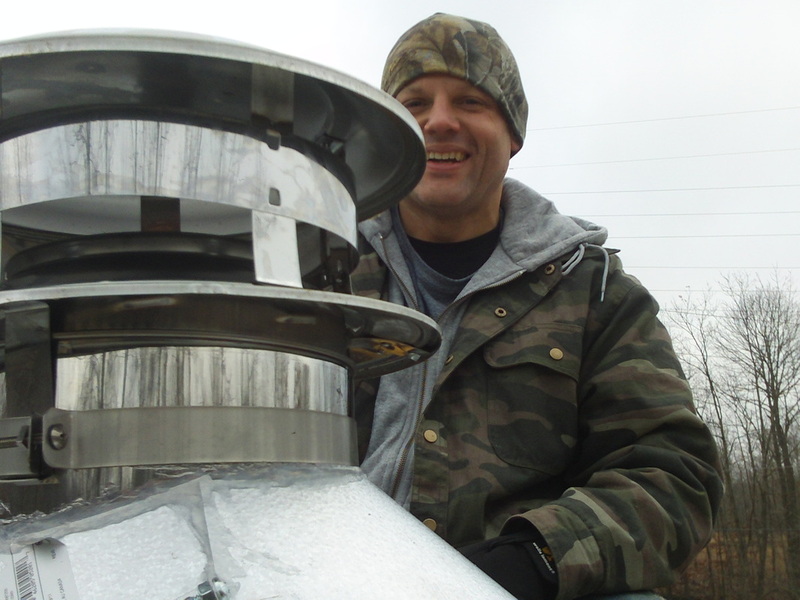 eventually, I got the tank worked loose and pulled it out. A good friend Nathan, came over Friday and Saturday all day. 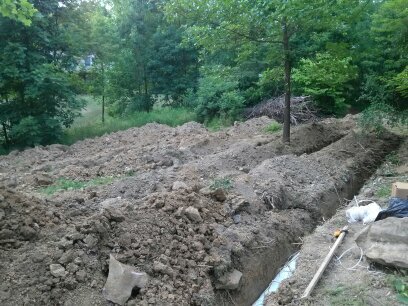 He worked the trenches with a shovel and the reciever of a lazor level to "fine tune" the level of the leach line trenches to a +/- 1/2" of exactly level. That was a huge help. 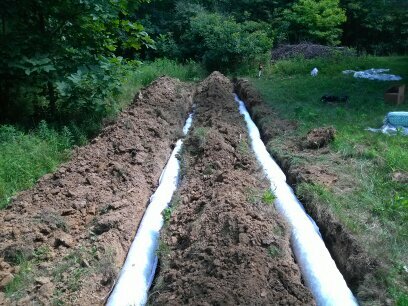 All of the eazy-flow pipe is in the trenches. 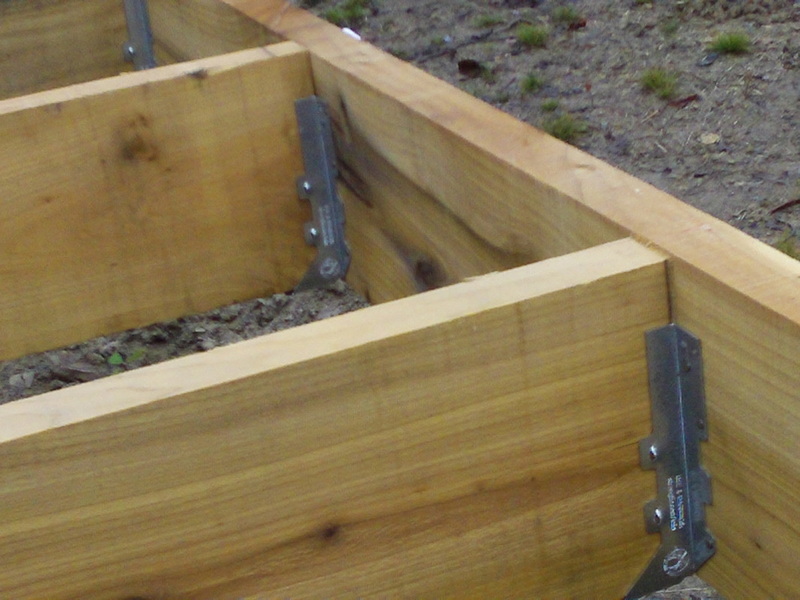 The trenches are all dug between all the components. Today, all I have to do is run the pipe from the tank to the distrubution box, then pipe from the distribution box to each leach line. This has been the hardest part of the entire build, but I saved over $3,000 doing it myself, so it has been worth it. Today is Saturday. 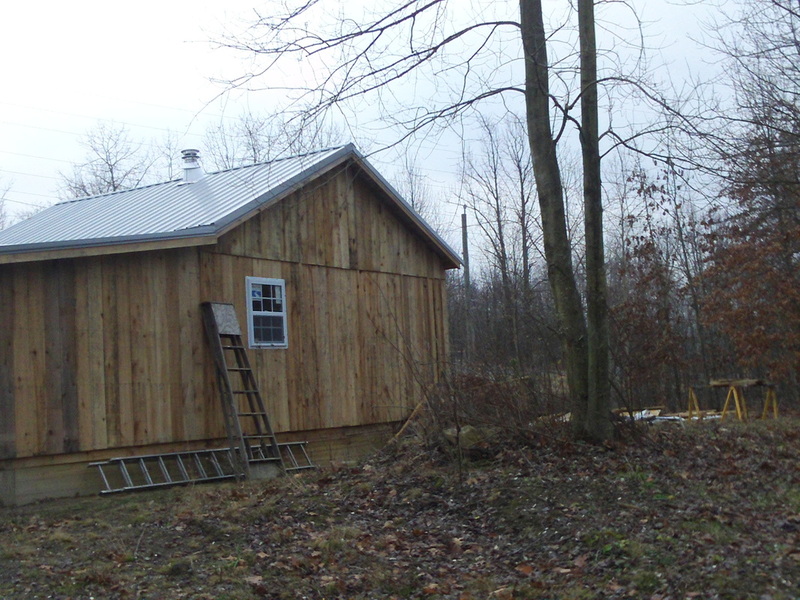 I worked inside all day today trying to finish some of the long, long list of "little things" yet to be completed. 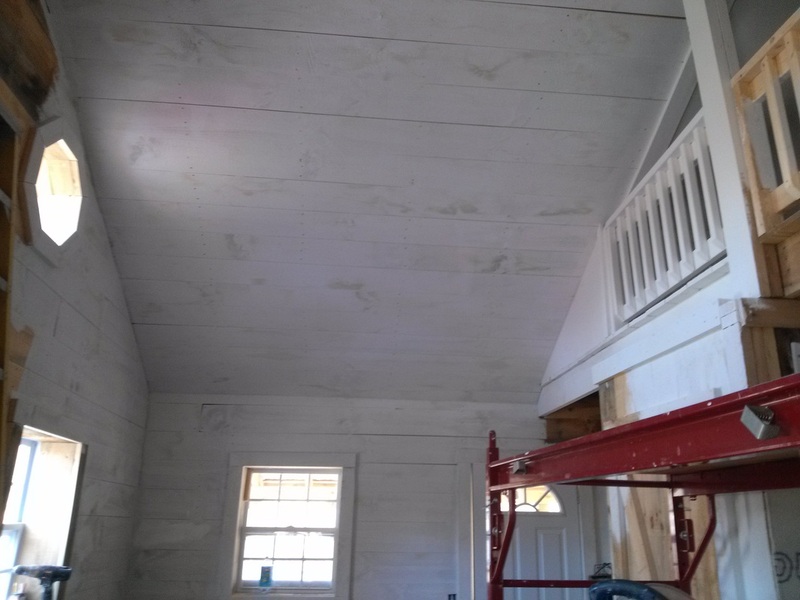 I installed the fold down ladder to the loft, put baseboard and crown molding in the bedroom, put underlayment in the loft, and did some touch-up painting. The guy from Lowe's is coming Monday to measure for carpet in the bedroom and loft. Well, I took a couple of vacation days along with the 4th holiday to finish all "the little things". 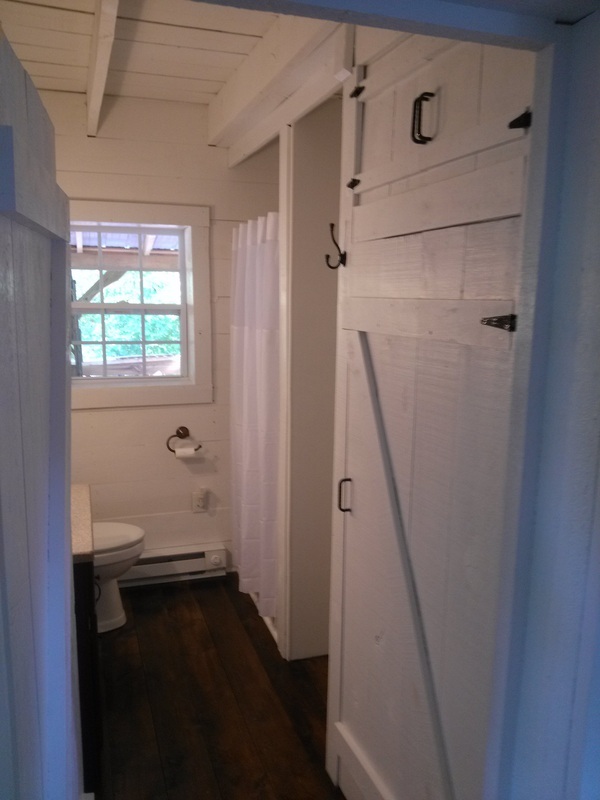 Added some molding, installed the baseboard heaters, put beadboard above the shower, put lattice under the front porch, a few more paint touch-ups, and hung a cabinet behind the bathroom door for linen. Tomorrow, they are delivering the refrigerator. 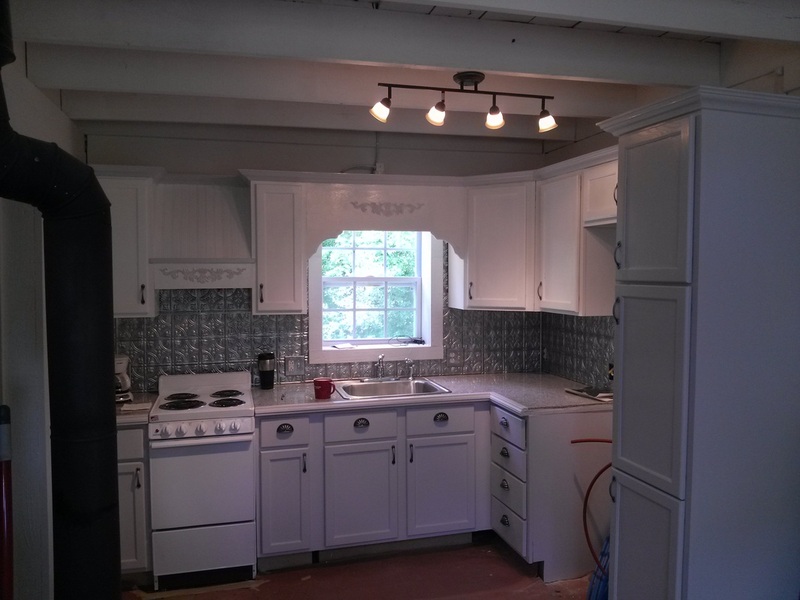 I will be installing the exhaust fan in the bathroom, putting the "kick plate" on the bottom of the kitchen cabinets, putting the lattice around the back porch, and starting to clean top to bottom. 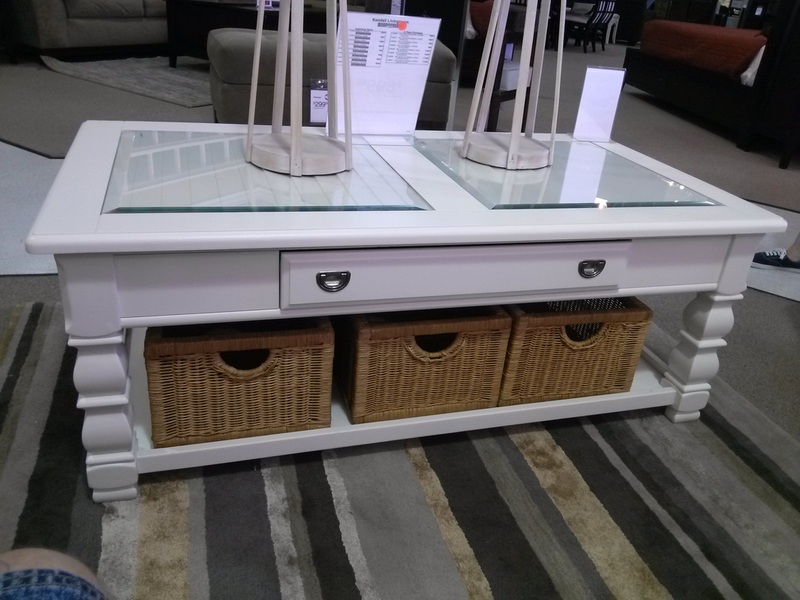 Oh, we also picked out furniture at Value City furniture that will be delivered next Wednesday. Things are happening very fast right now! 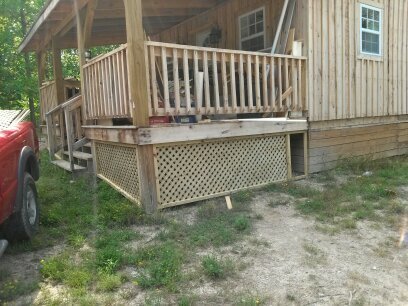 Today I finished the lattice around the back porch, and cleaned off the front porch (which has been my work shop for 3 months). 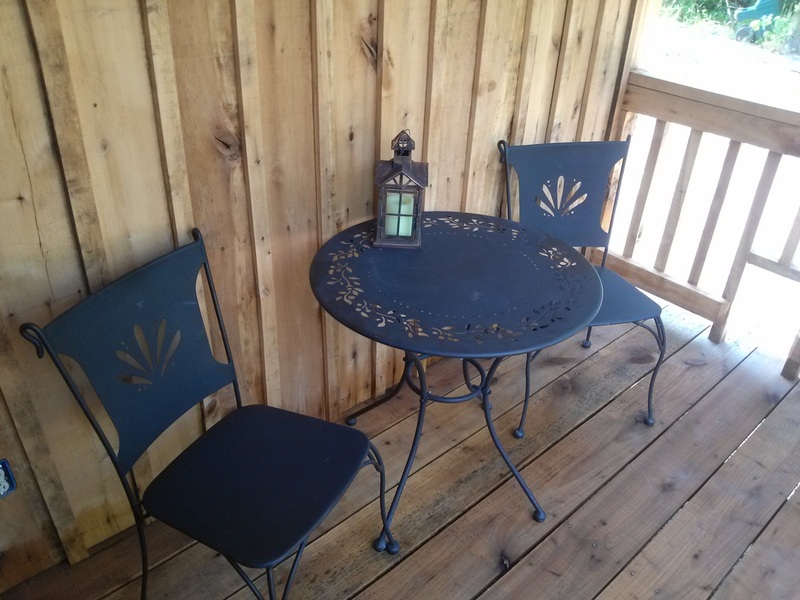 After a good sweeping and preasure washing, it is ready for porch furniture now! The furniture that is there now is only temporary. This past week we have been having a blast decorating! 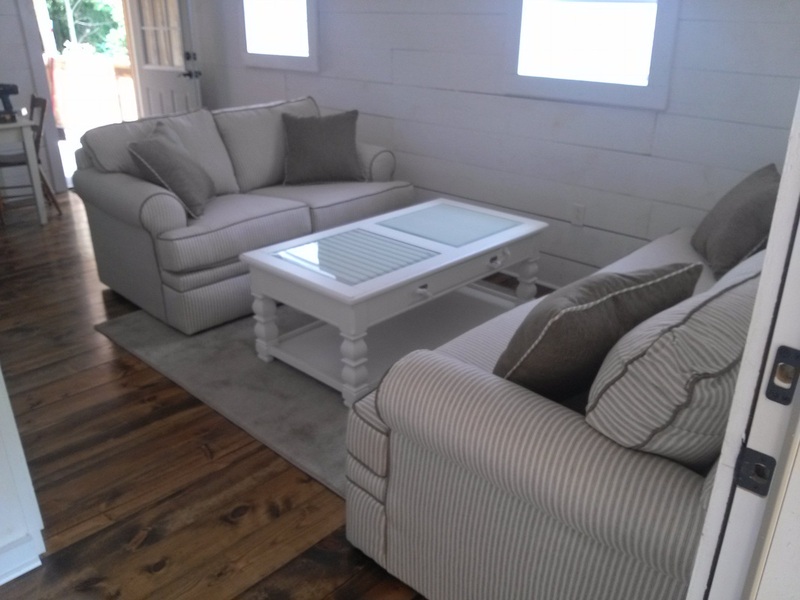 The furniture was delivered today. Lowe's are finely (after fighting for over 3 weeks) installing the carpet in the bedroom and loft tomorrow! 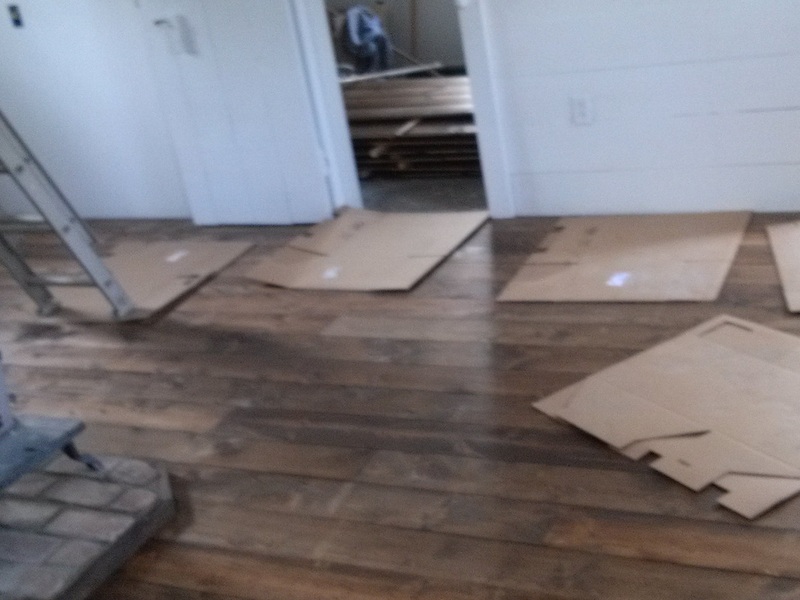 It took 6 days to get the installer to come out and measure. 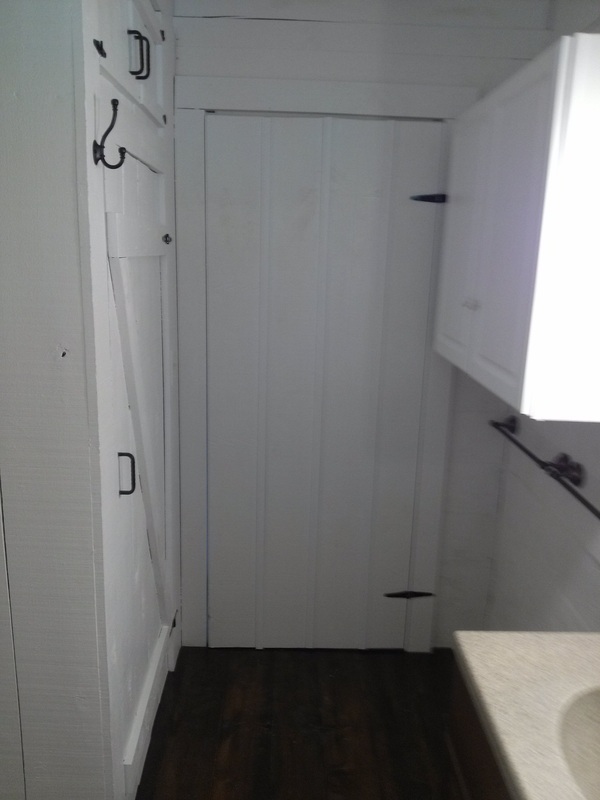 (I built if but they wouldn't go by my measurements) which is fine, but 6 days to get somebody out to measure? 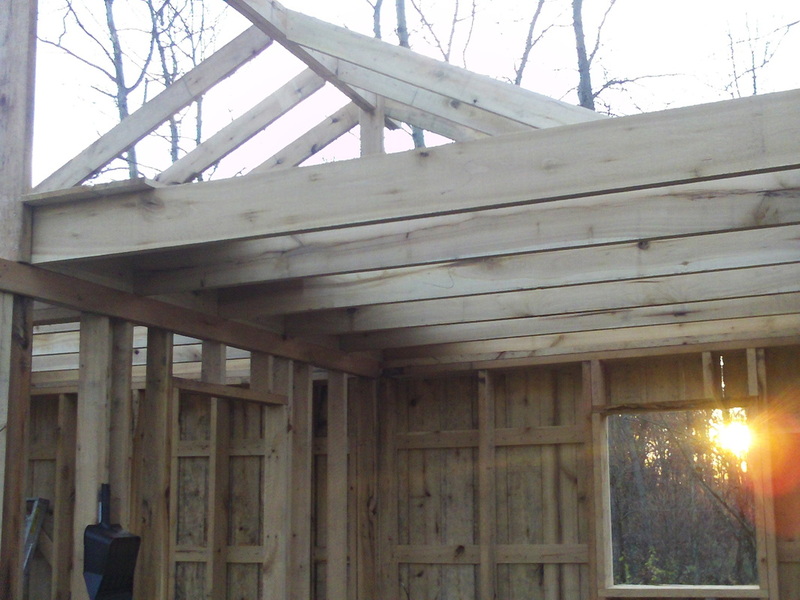 Then, it was 5 more days after that before he finely faxed the measurements into Lowe's. 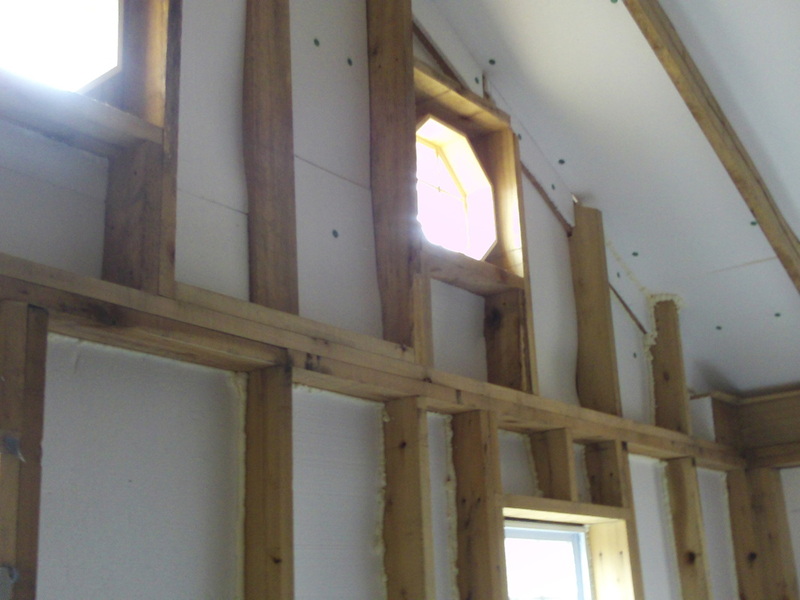 Then another week after finely resulving that before he called to schedule the installation! Ugh! Well, we finely won the battle. Lowe's installed the carpet yesterday. 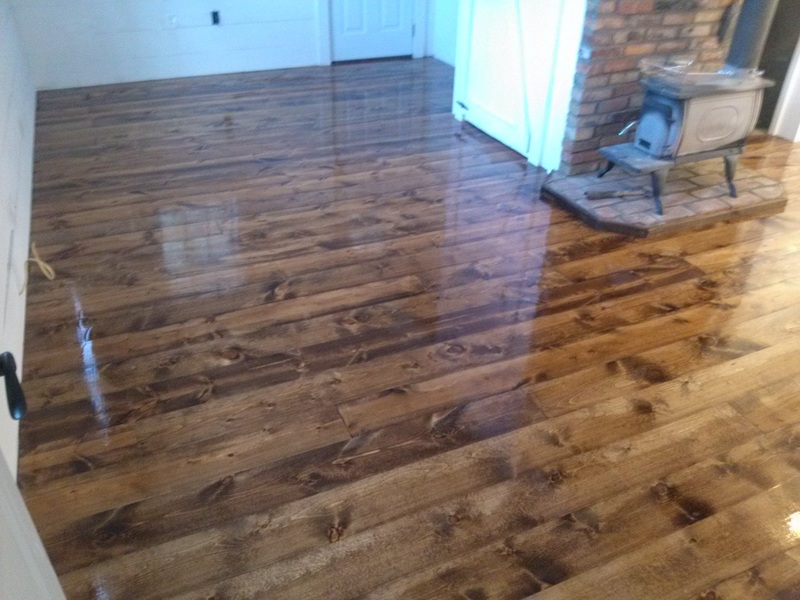 I will say they did a good job, and it looks great. It just took for ever! It shouldn't take 3 weeks to get "in stock" carpet installed. 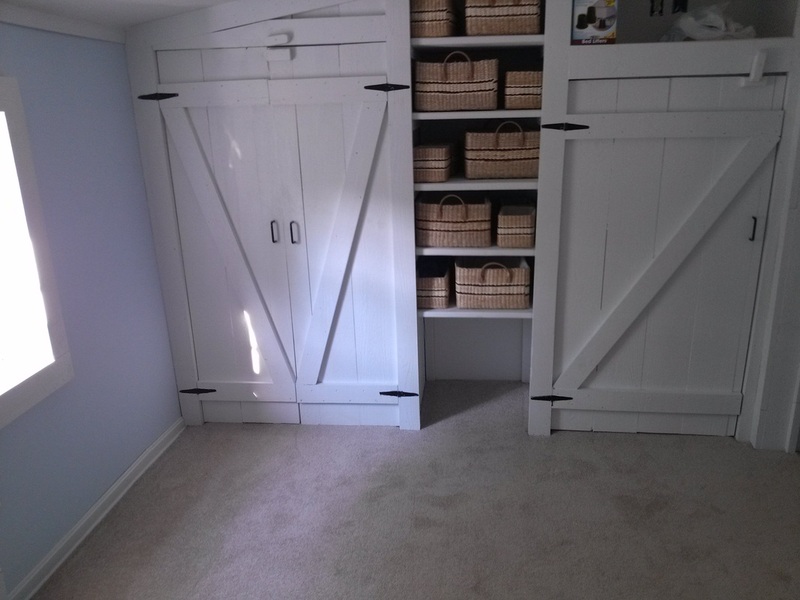 Anyway, now that the carpet is installed, we can start moving into the bedroom. I had left a full inch under the closet doors, but the carpet and padding are so plush that they still drag, so I will need to trim them this weekend. 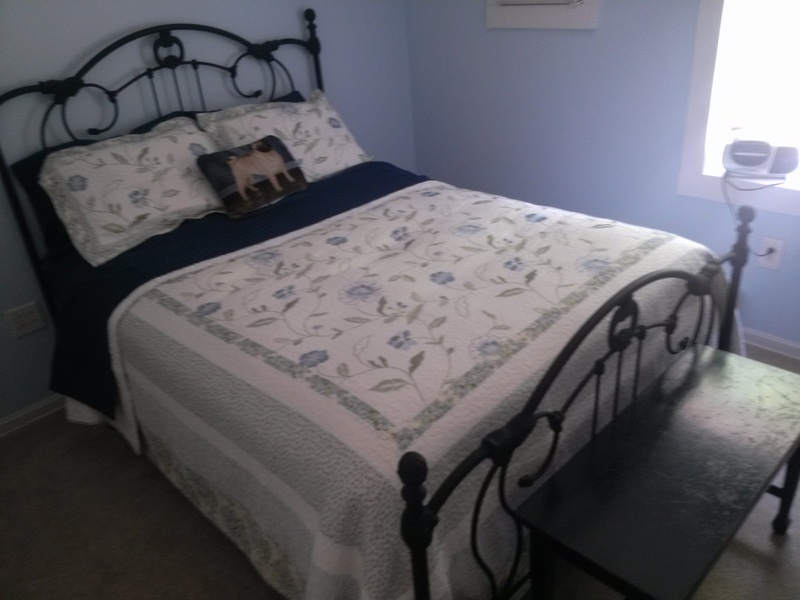 Here are some pics of the carpet and bed moved in. Please note: I have started addtional pages. 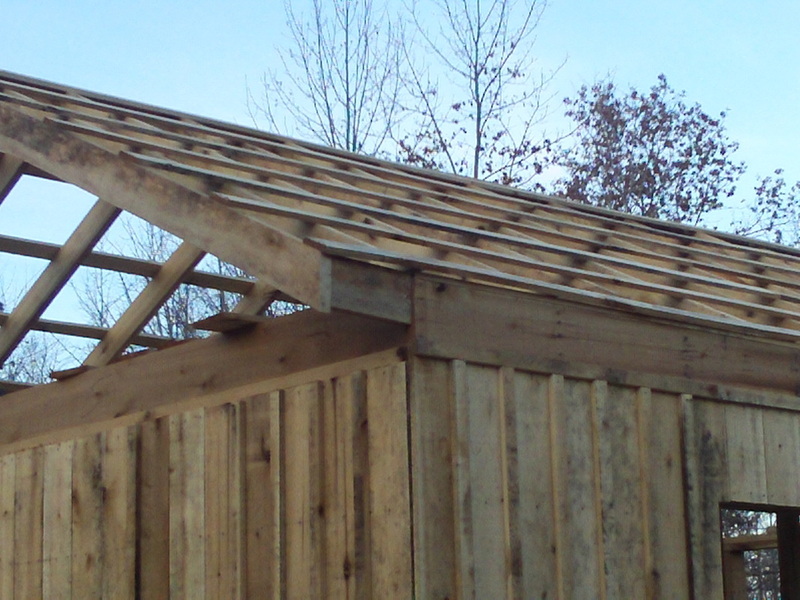 At the top header of this page, there is a link to building a tool shed / chicken coop. 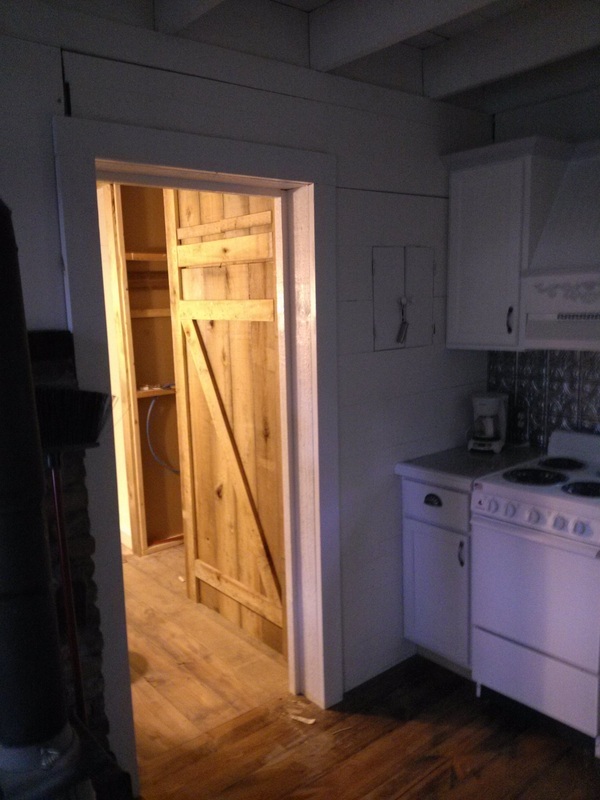 Please join us as we "go into homesteading at our little house on the hill". And feel free to contact us any time! I would love to hear from people with simular interests. Please fill out the form below. Your e-mail address will go NOWHERE! I promise! 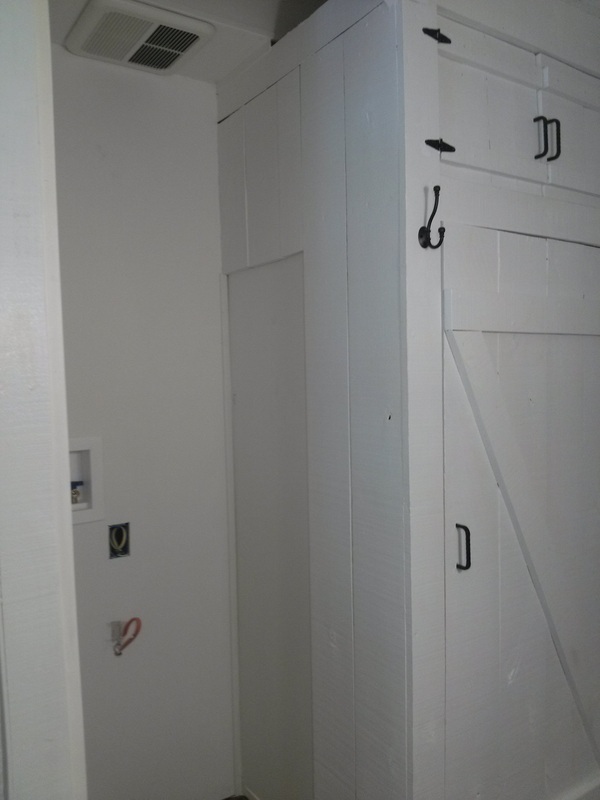 Today, I started the garage. Please see the garage page link at the top of this page.